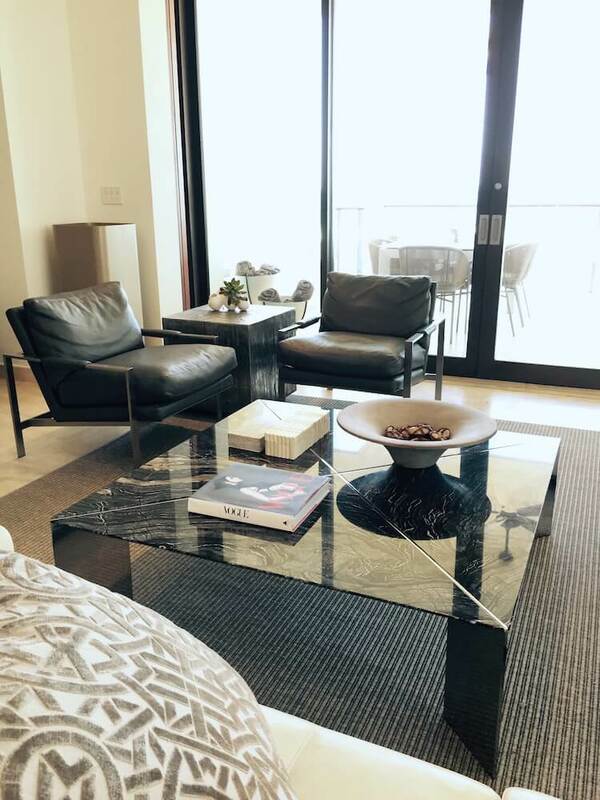 Use the buttons to filter the images by category. 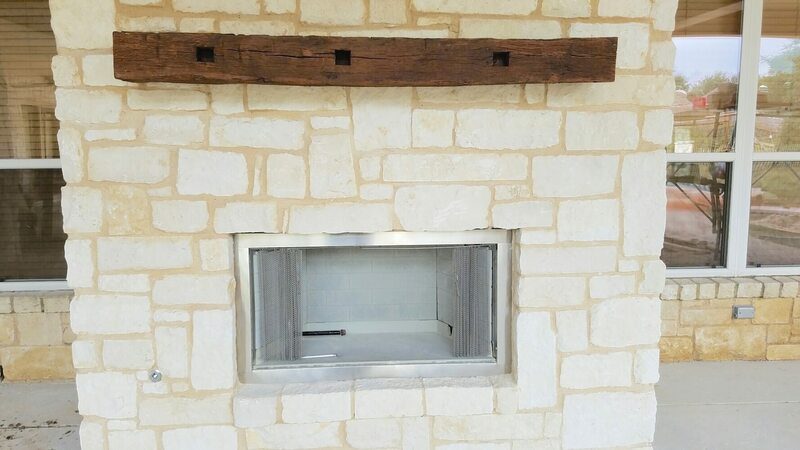 Click on an image to see more information. 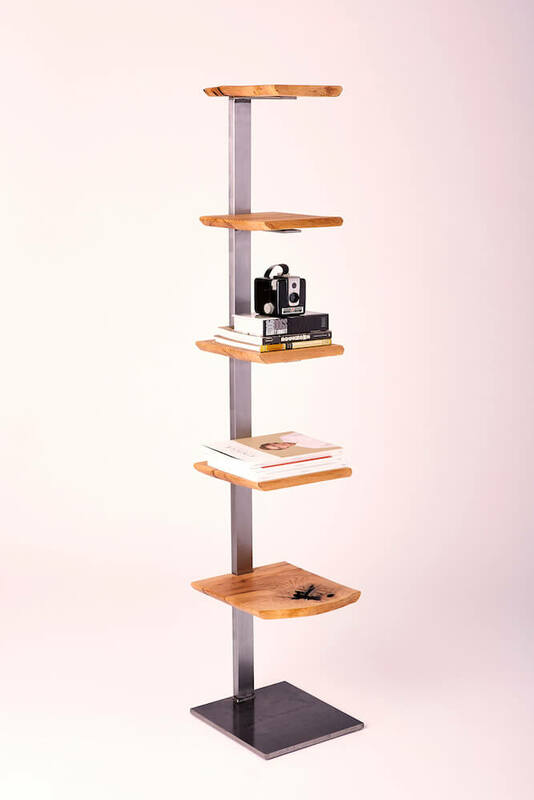 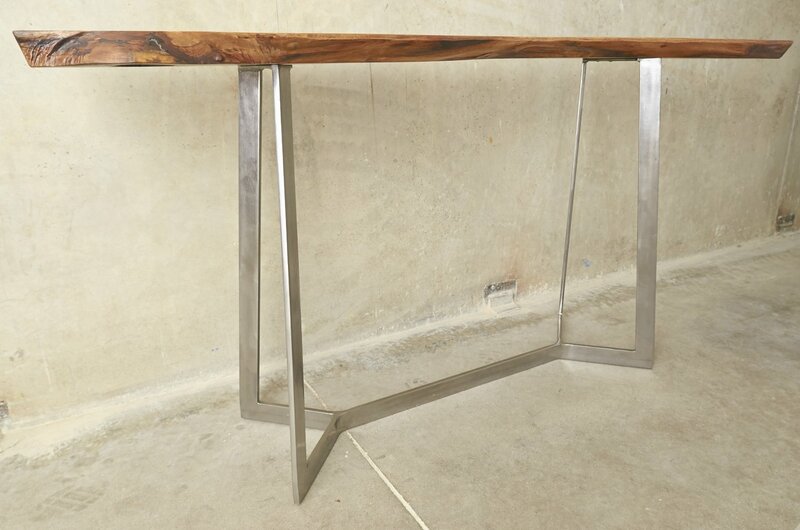 Rich, incredibly figured walnut combined with our Innover steel base in semi-polished steel. 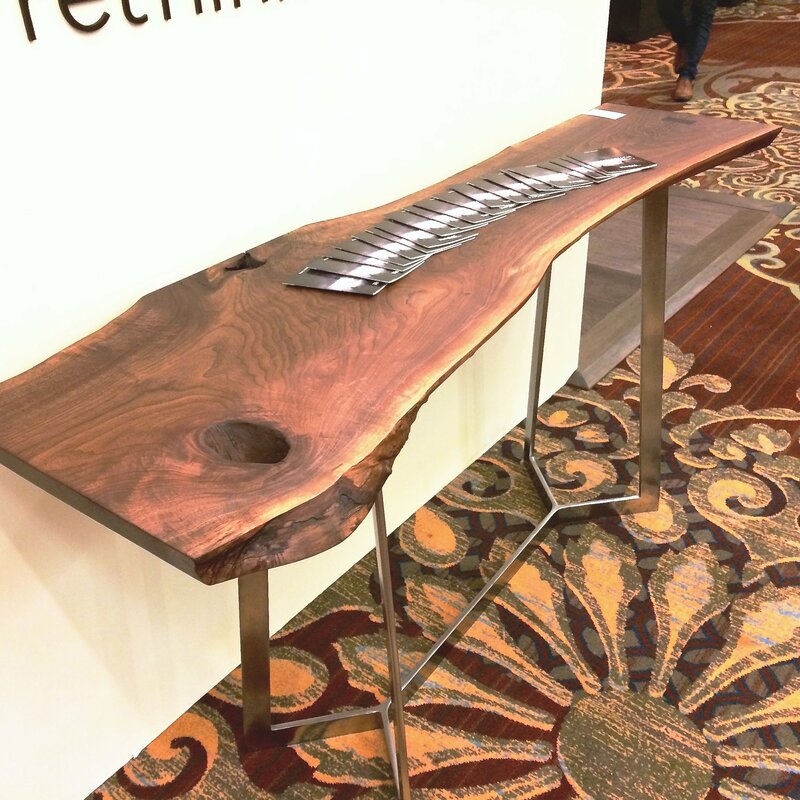 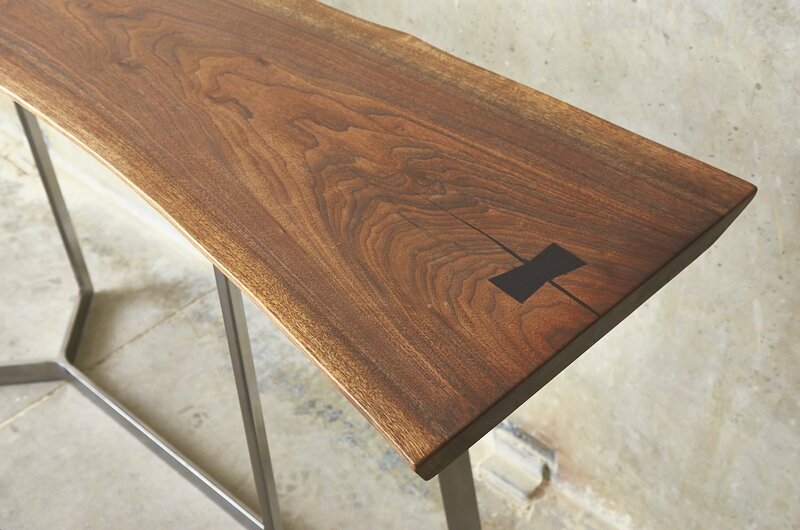 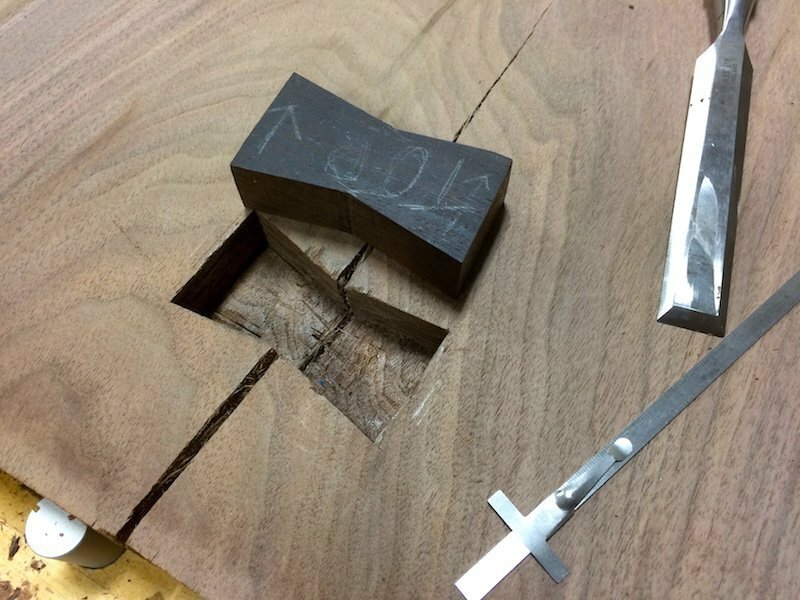 This table features amazing character, and a wenge wood bow tie key over the dark epoxy filled end crack. 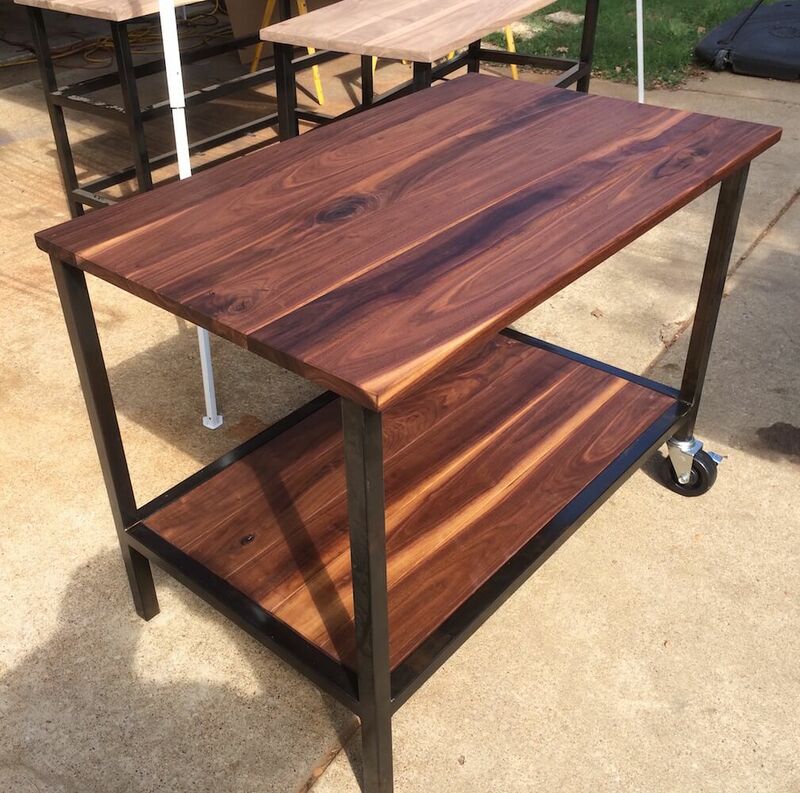 Finished to a buttery smooth matte finish. 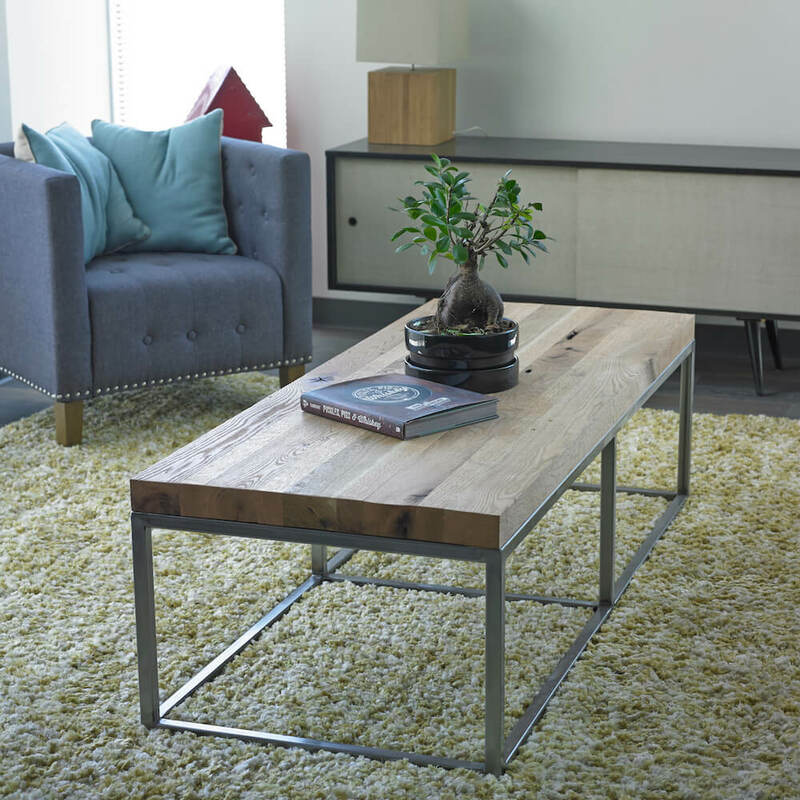 Accent tables made from antique beams in 24” and 28” heights. 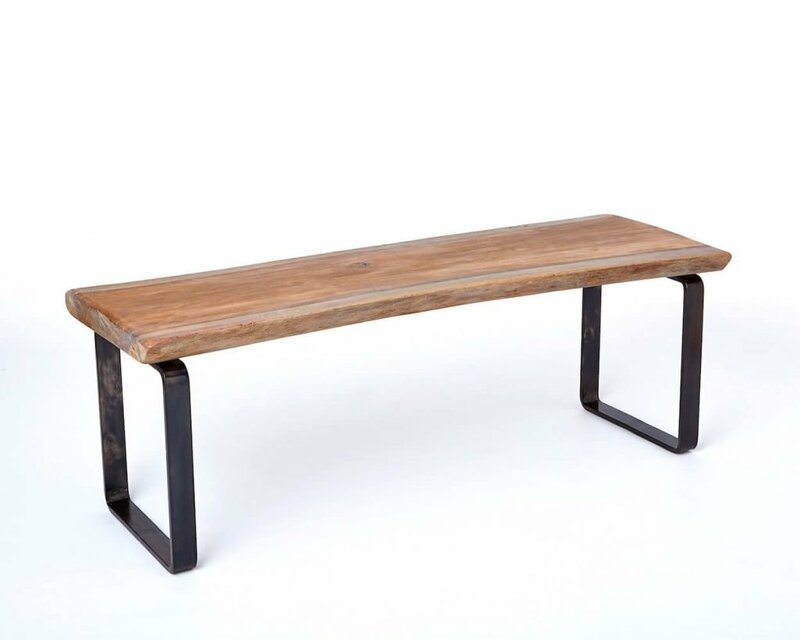 Stål Timber benches from either live-edge wood or think planks and steel. 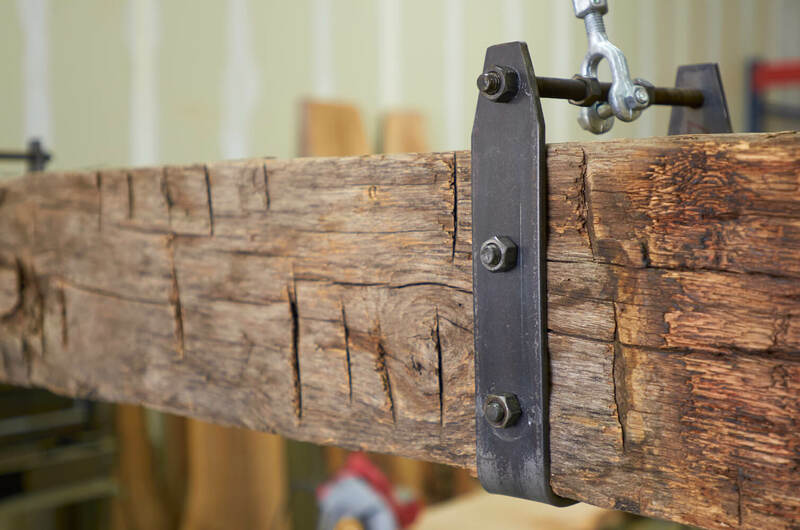 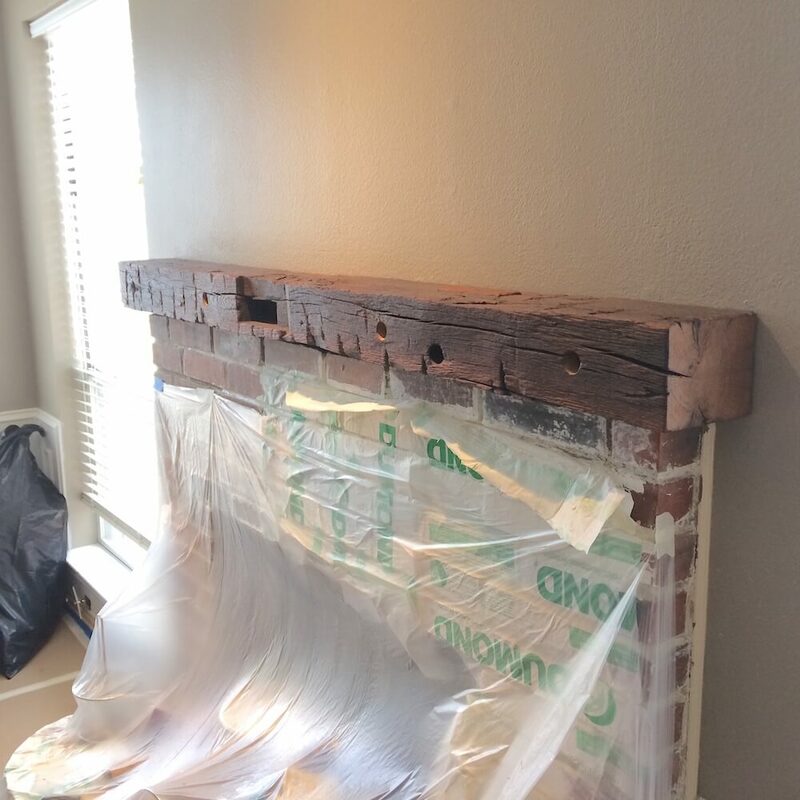 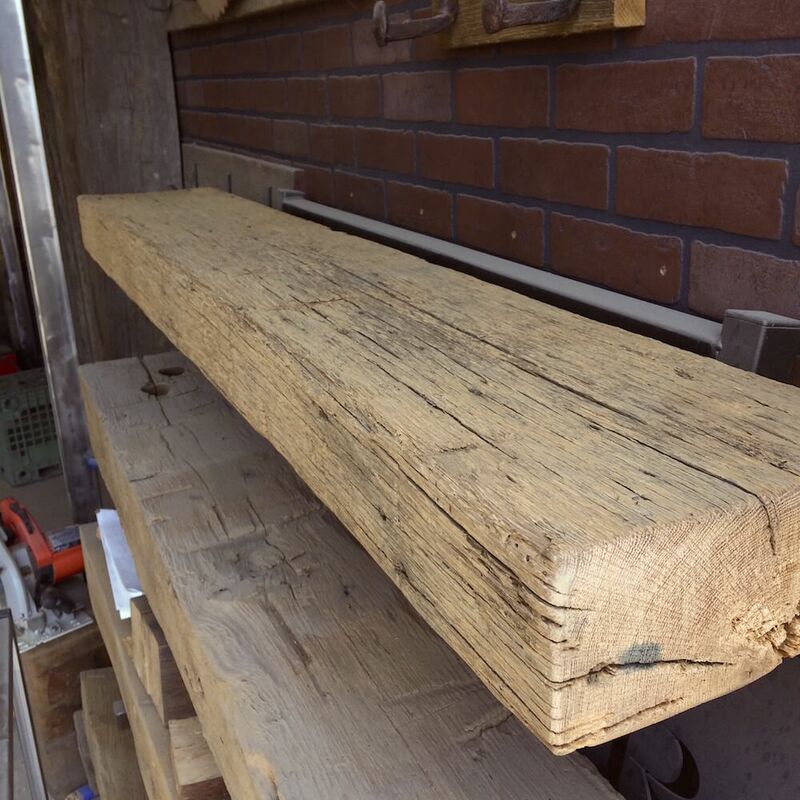 Put the look of ancient structural beams into any environment — then take them with you if you move! 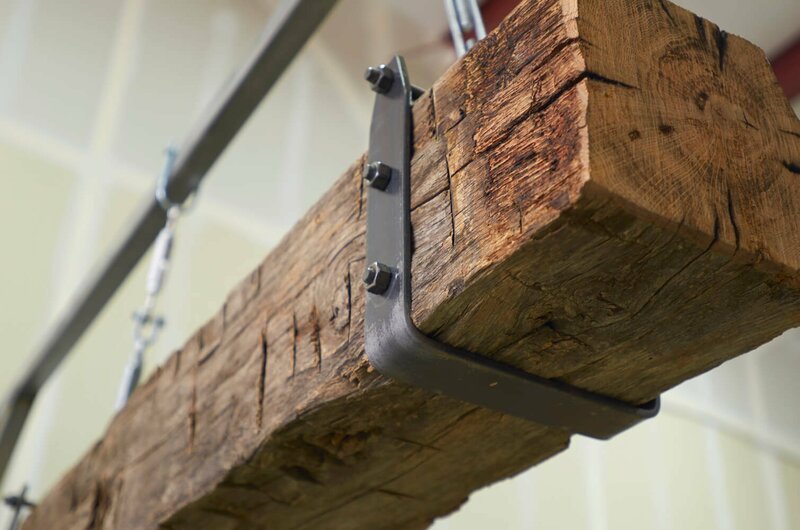 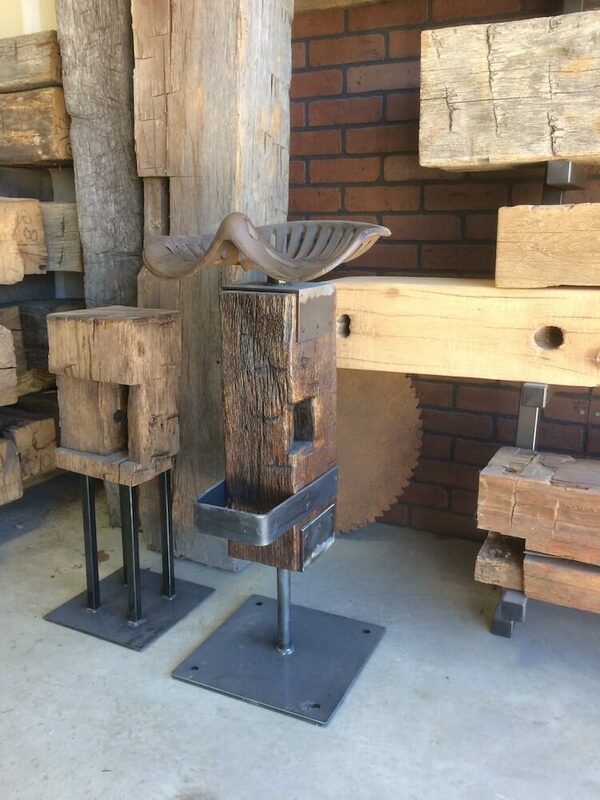 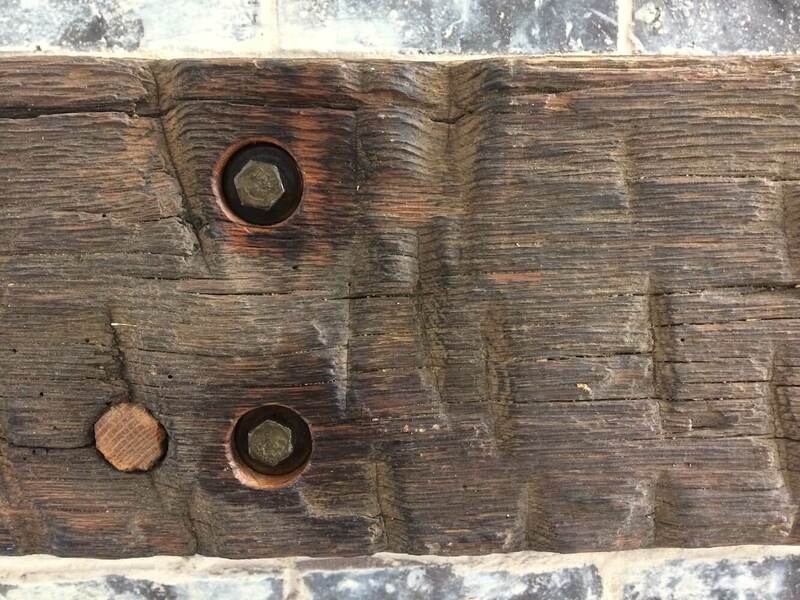 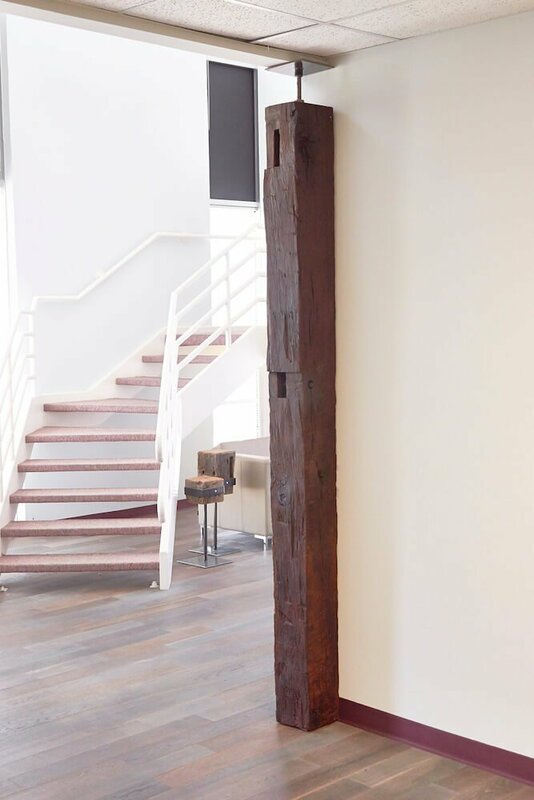 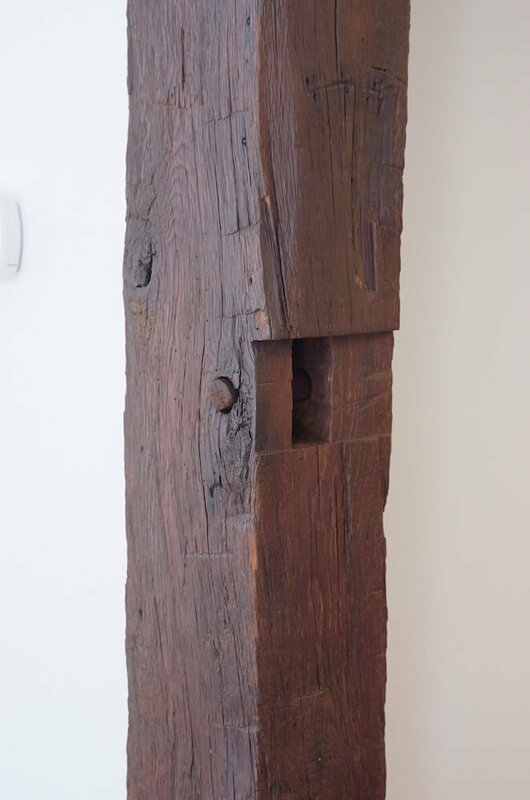 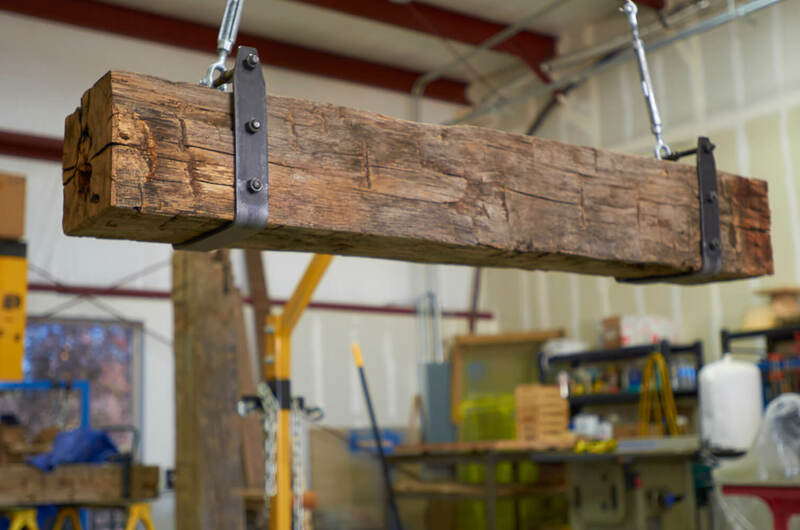 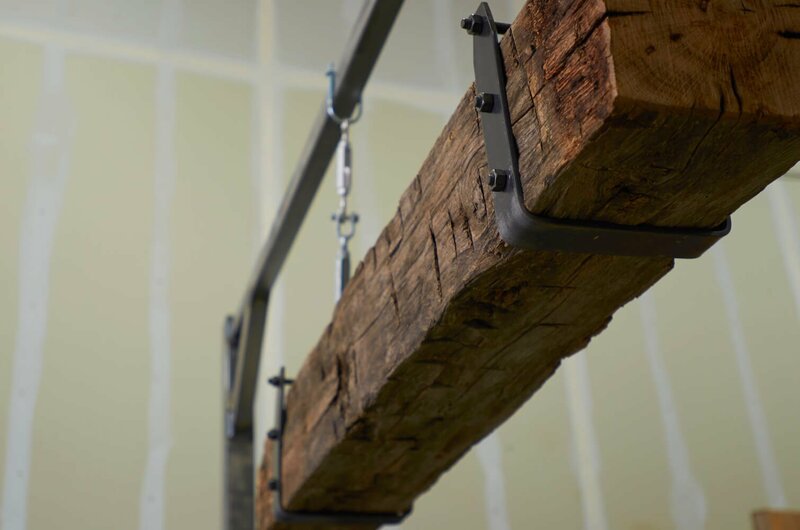 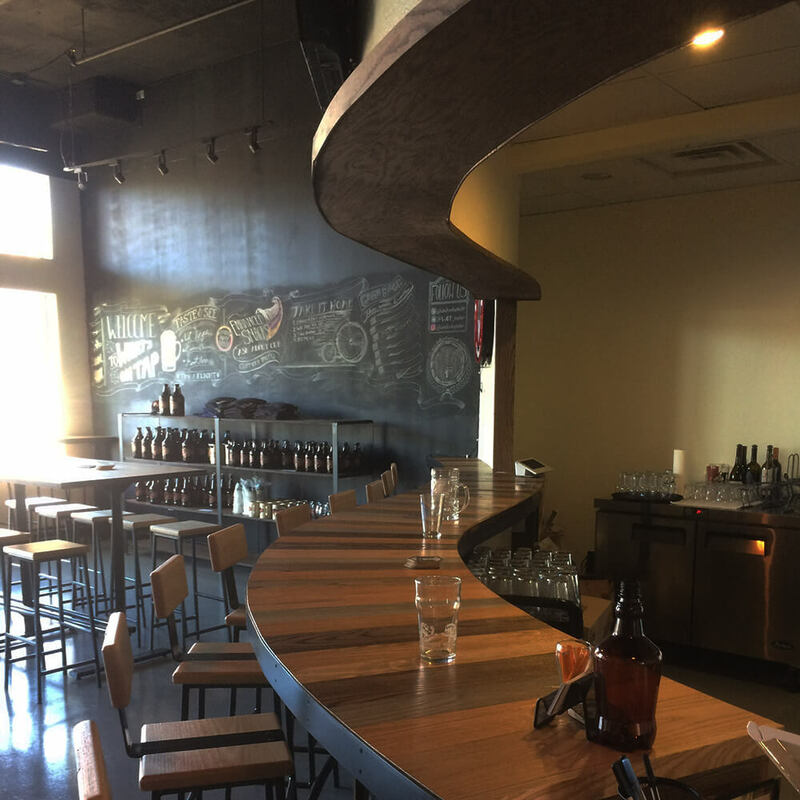 Our beam columns are made from antique oak barn beams that are roughly 200 years old, and feature an industrial strength screw jack and top and bottom mounting plates that allow you to secure them to any ceiling or overhead structure. 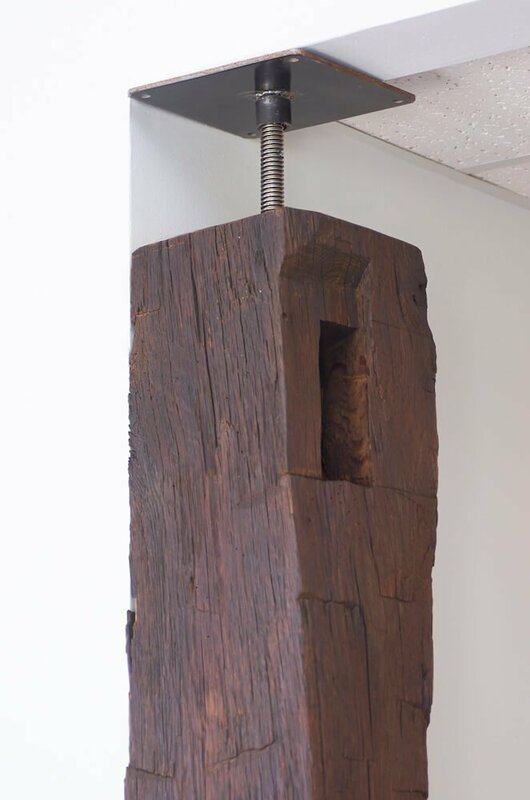 Leave the screw jack open as a gorgeous accent, or box it off to make it look built-in. 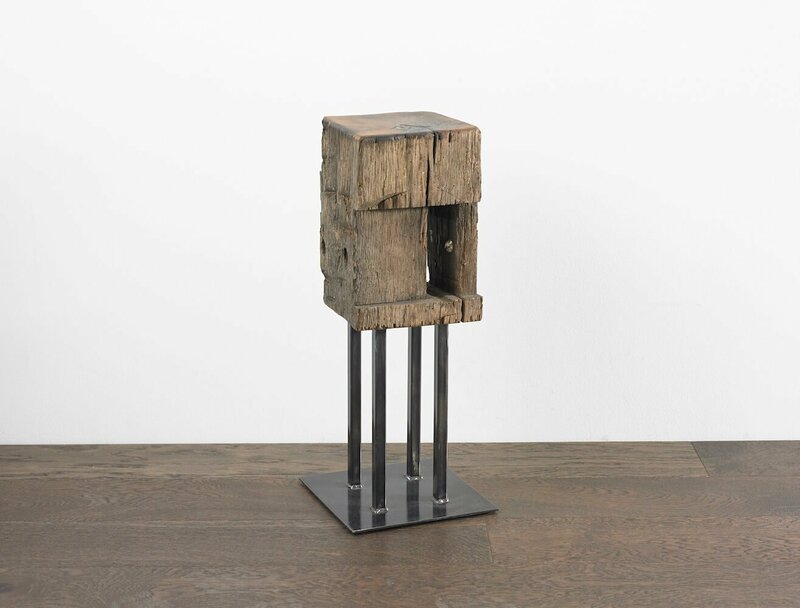 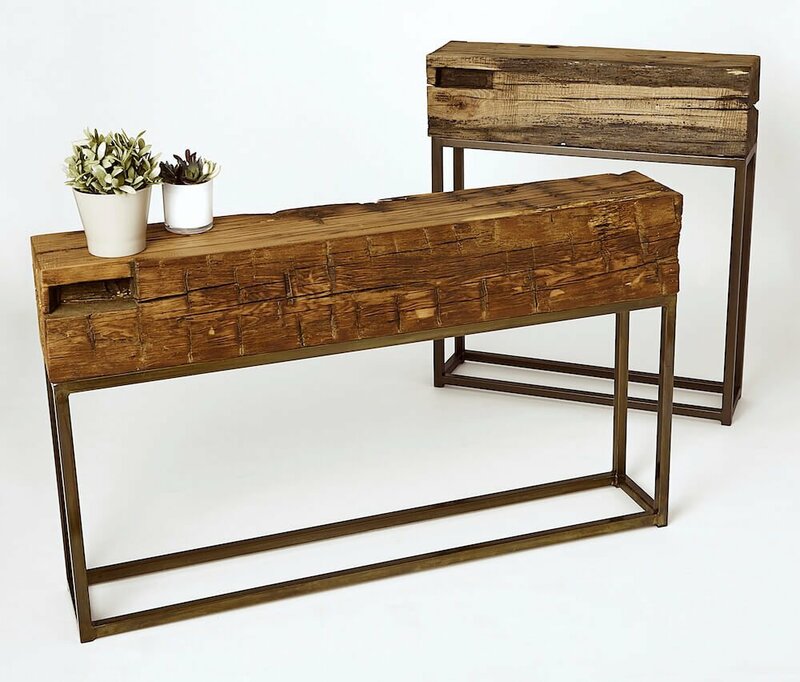 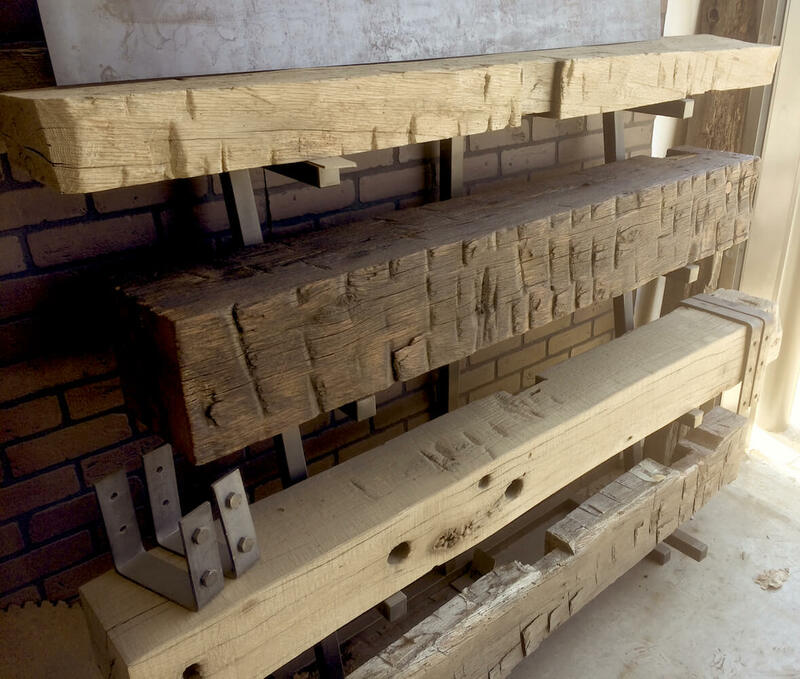 Stål Timber creates unique furniture from our stock of reclaimed antique beams, salvaged from a Virgina tobacco barn. 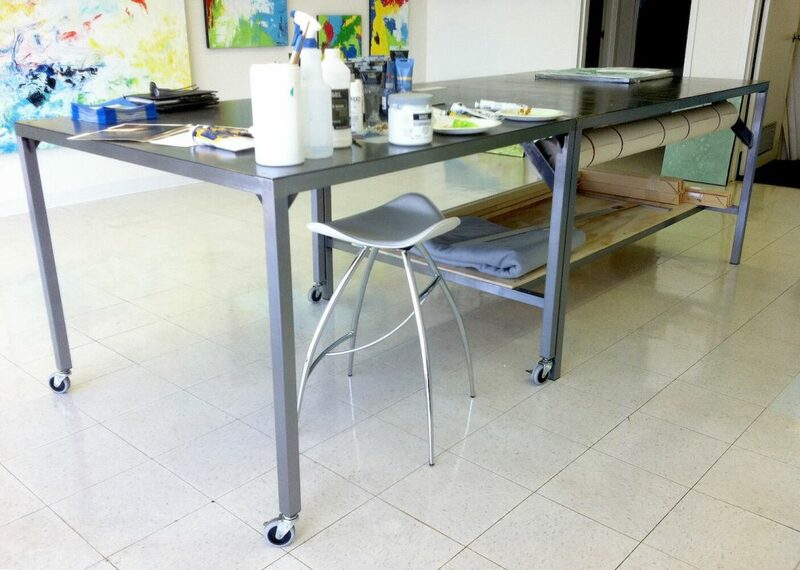 Custom table for the working art gallery of painter Liz Wiley. 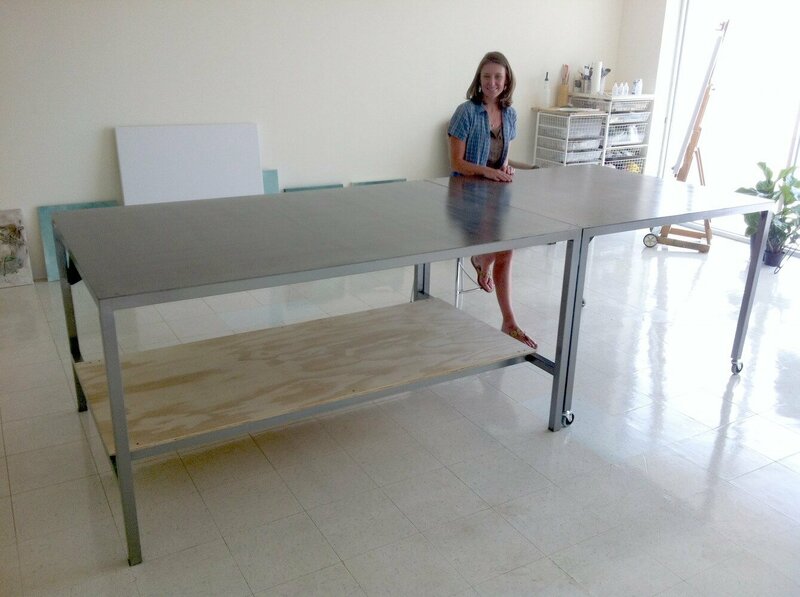 Liz wanted a large table to spread her tools onto that had the ability to be separated into a smaller utility table and larger storage/dispensing table. 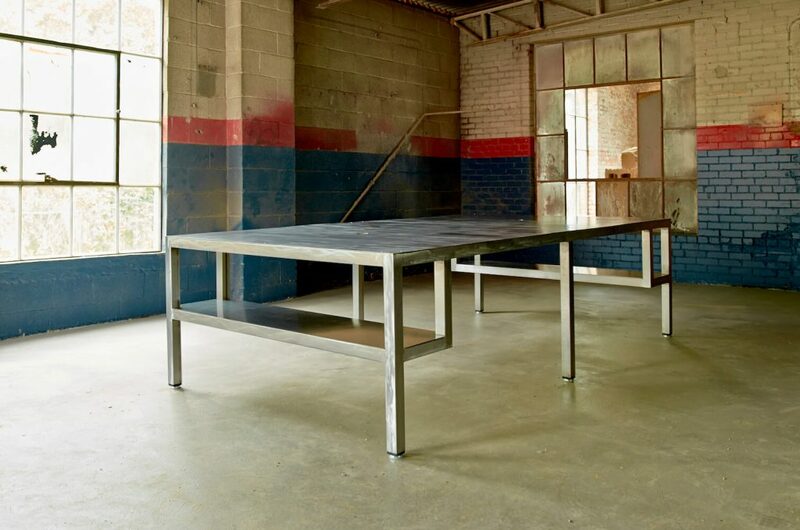 The end product is 12-feet long and locks together, then separates into 4×4 foot and 8×4 foot tables. 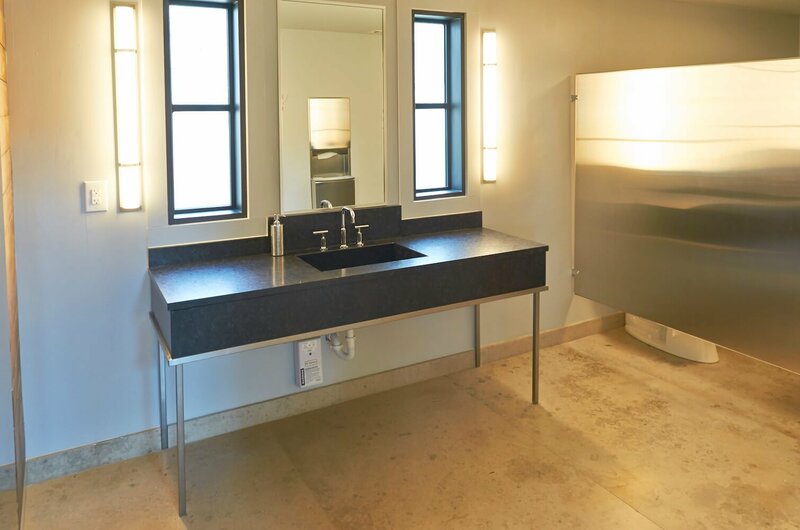 Bathroom vanities of brushed and blackened steel built for a stone company showroom. 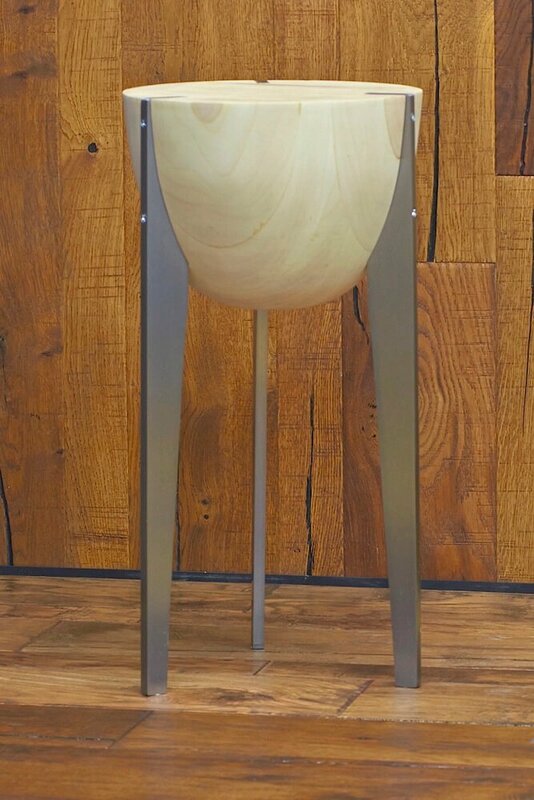 Available to order. 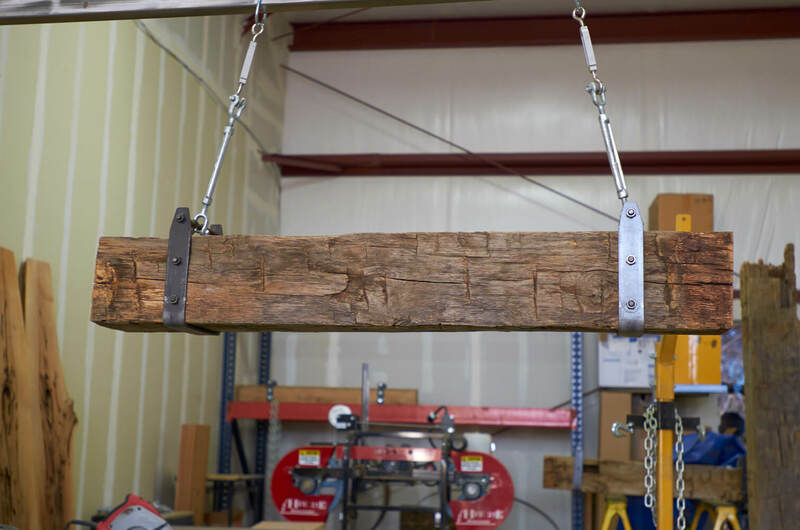 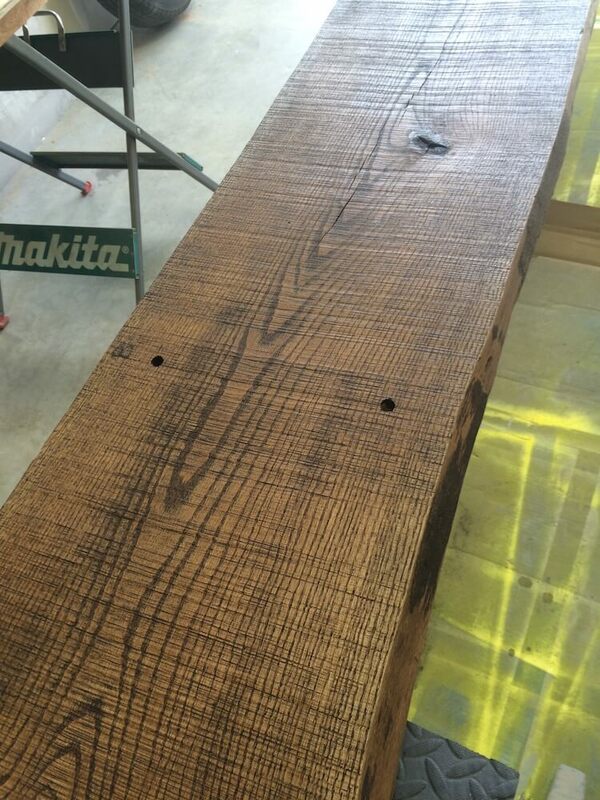 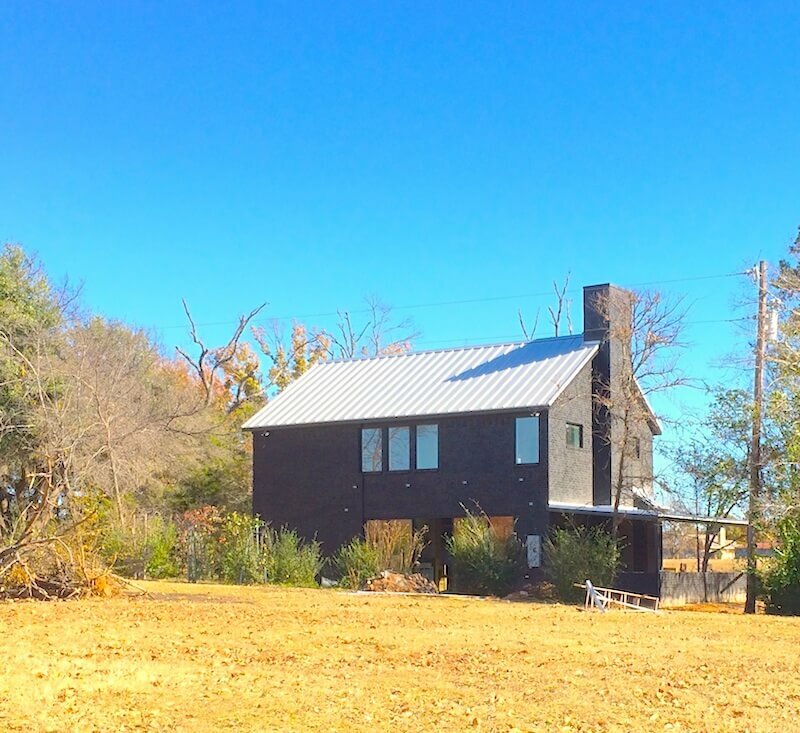 Stål Timber builds spec and custom furniture from our stock of 1800s-era Virginia Barn Beams. 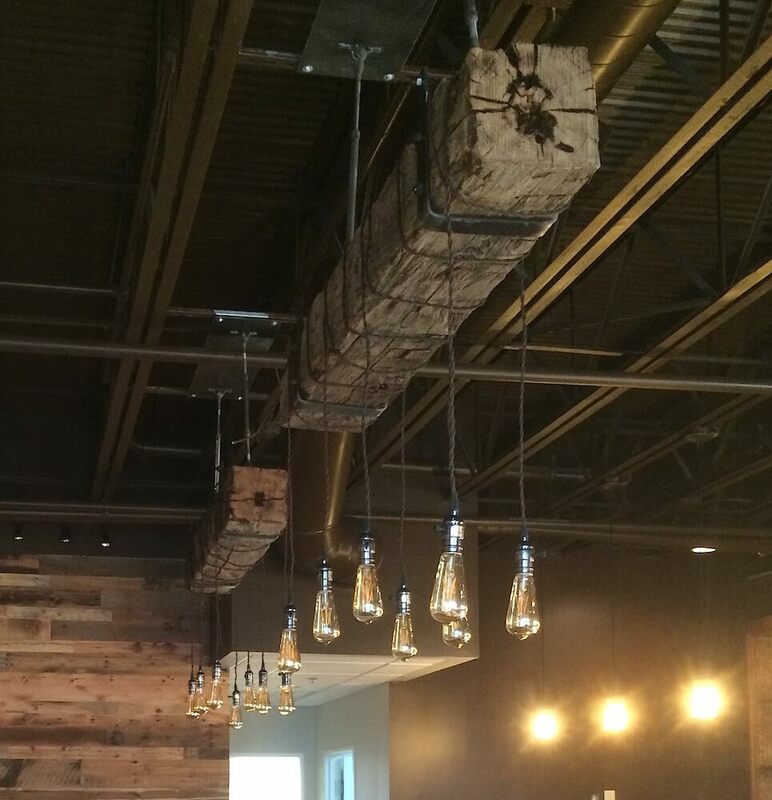 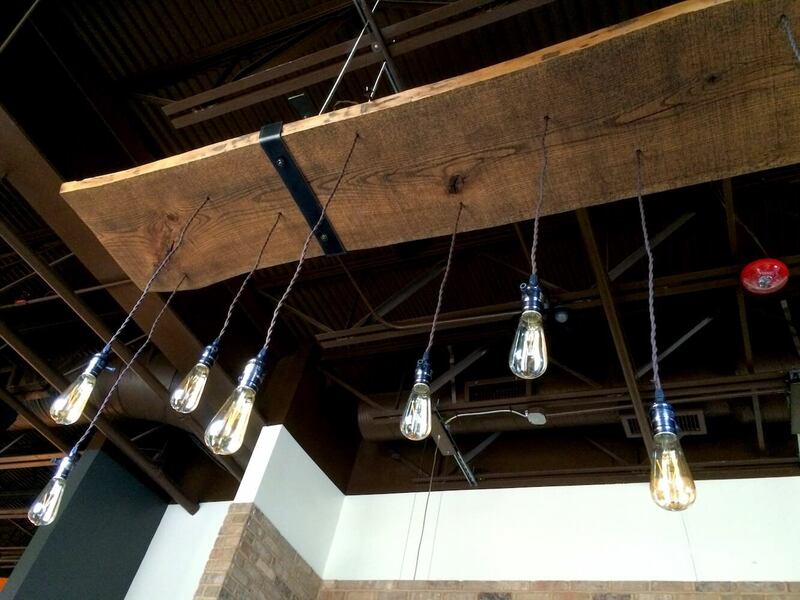 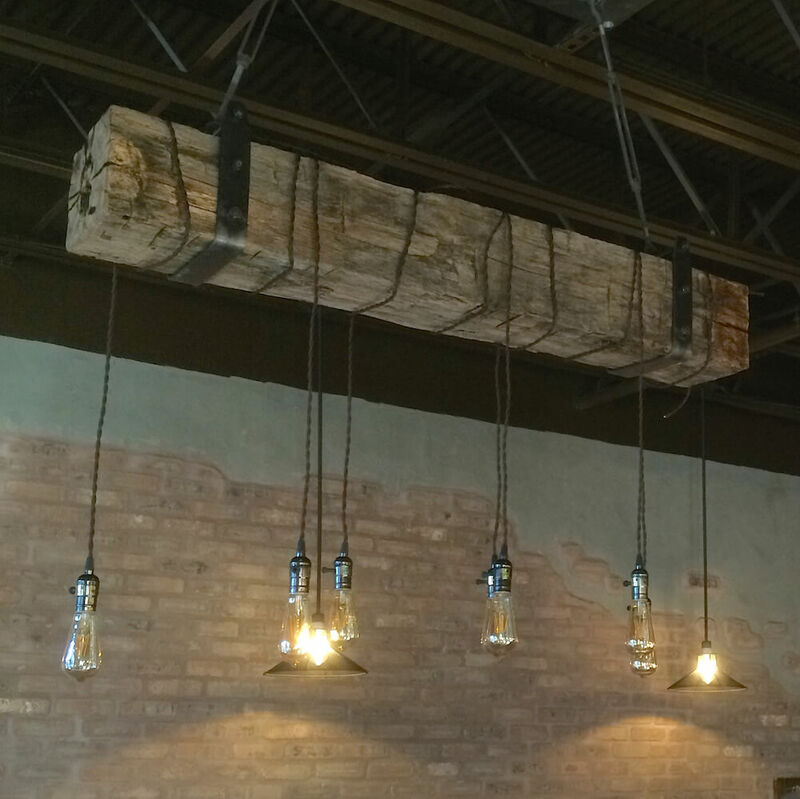 Rustic and industrial lighting crafted from antique 1800s-era barn beams and steel. 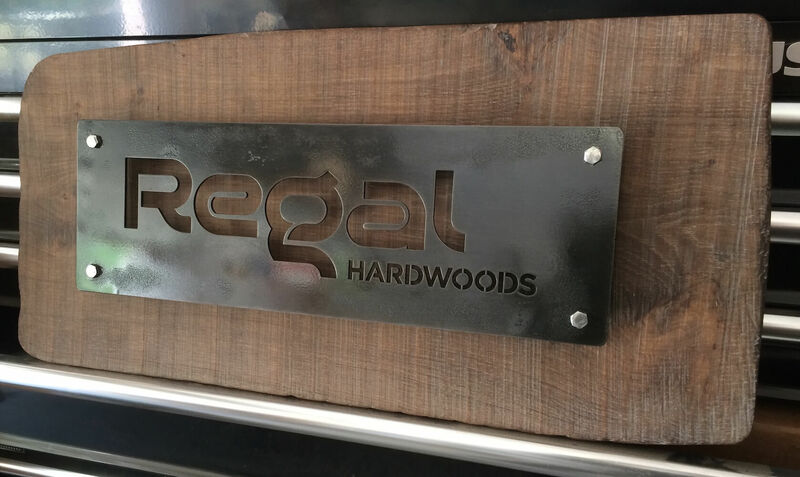 Custom signage, laser cut and mounted. 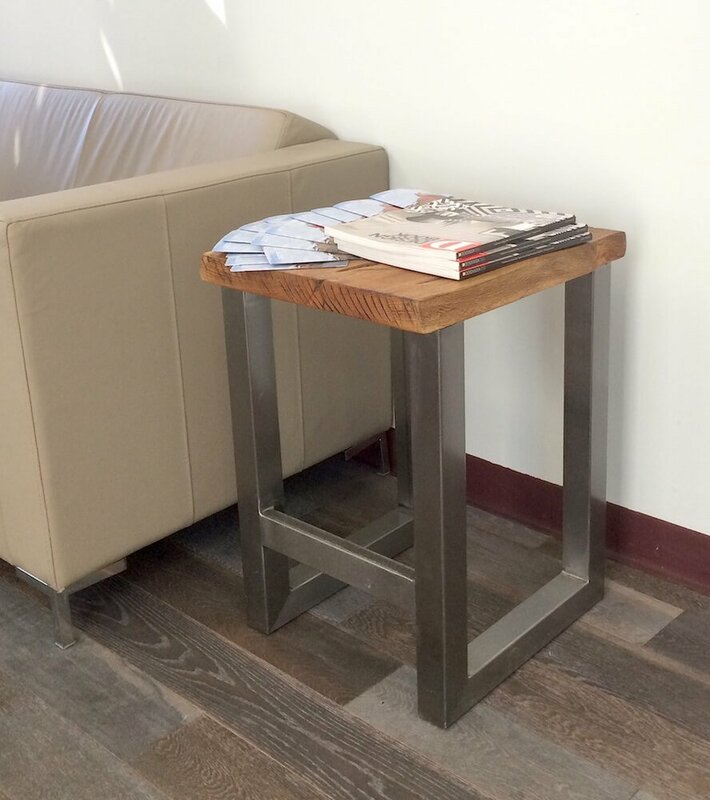 Created with the customer’s book-matched distressed wood for customer reception lobby of a wood flooring manufacturer. 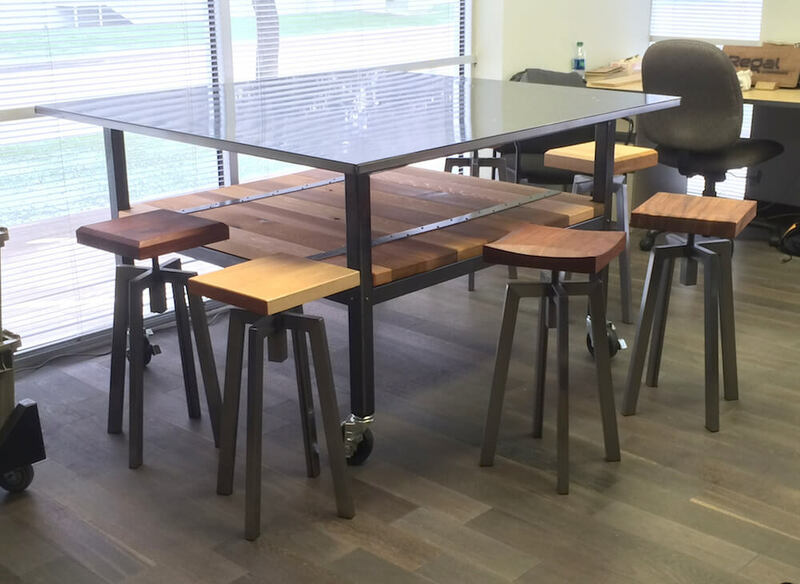 Custom laser cut bench bases for a retail showroom. 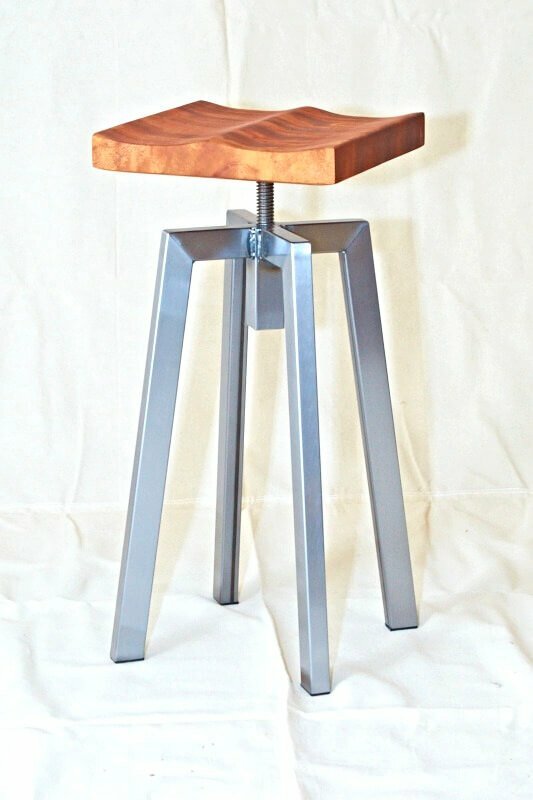 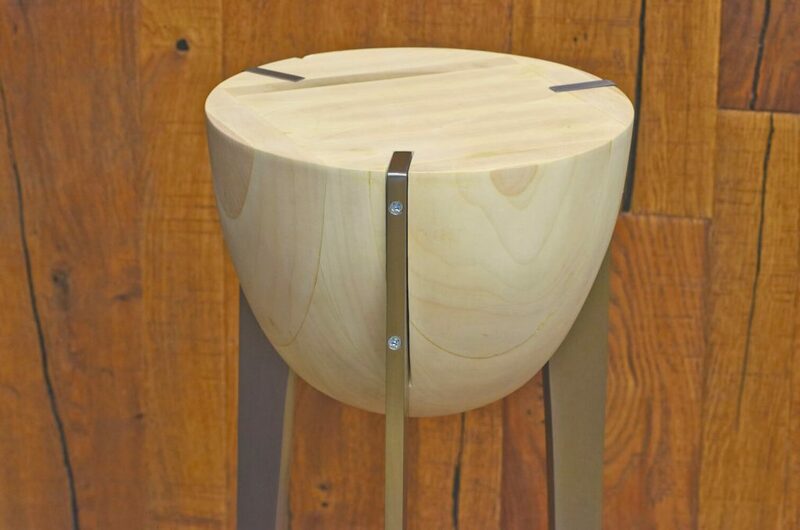 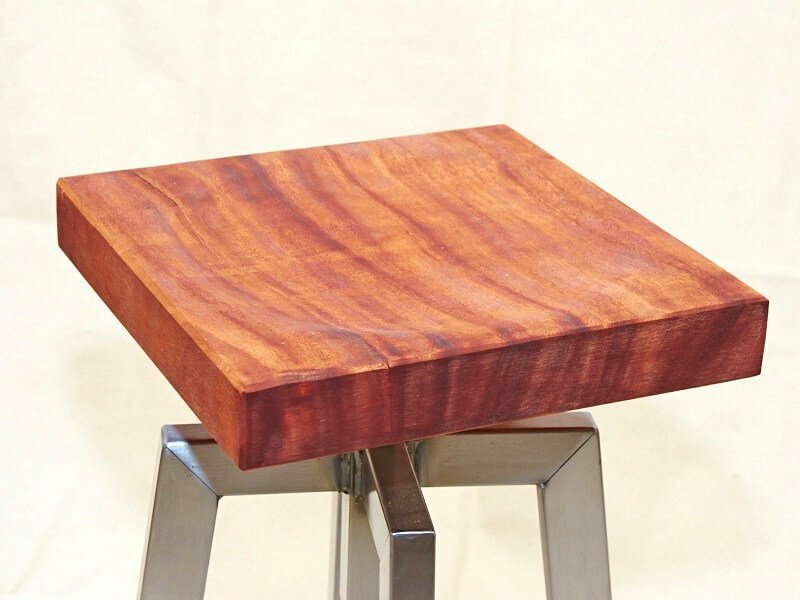 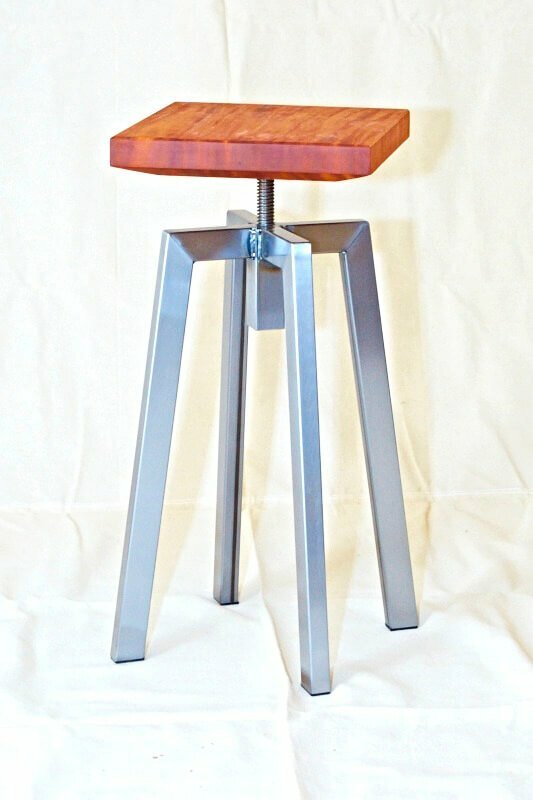 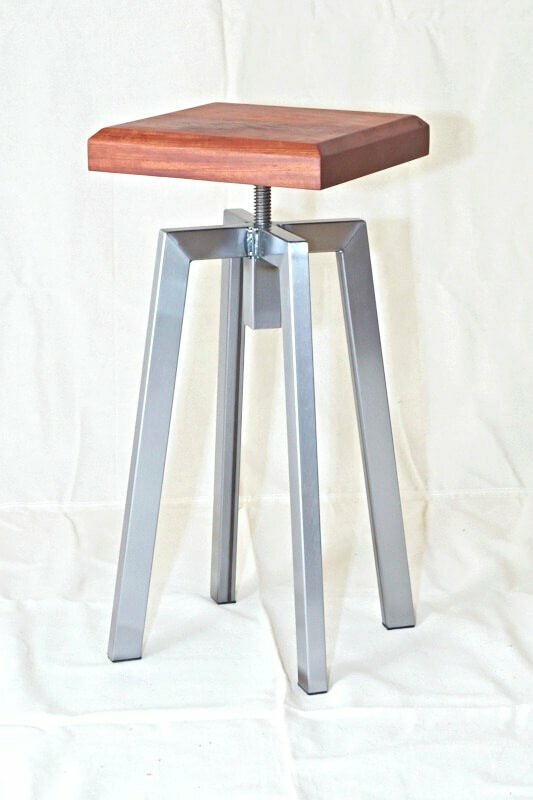 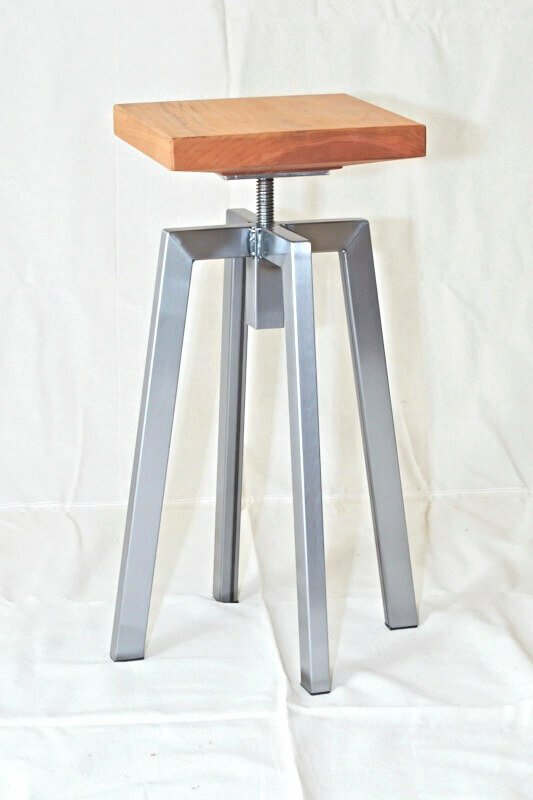 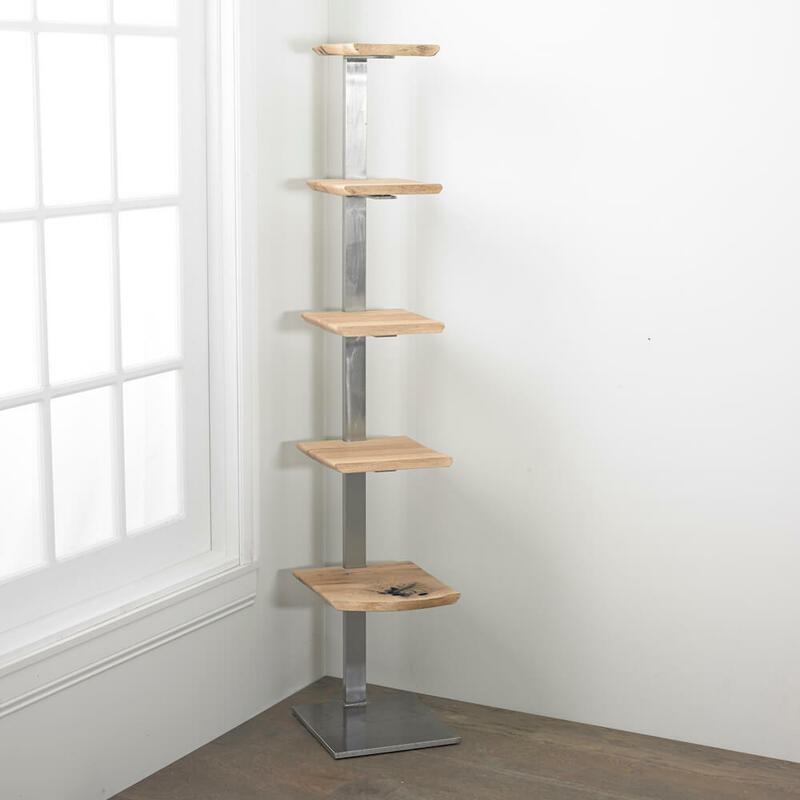 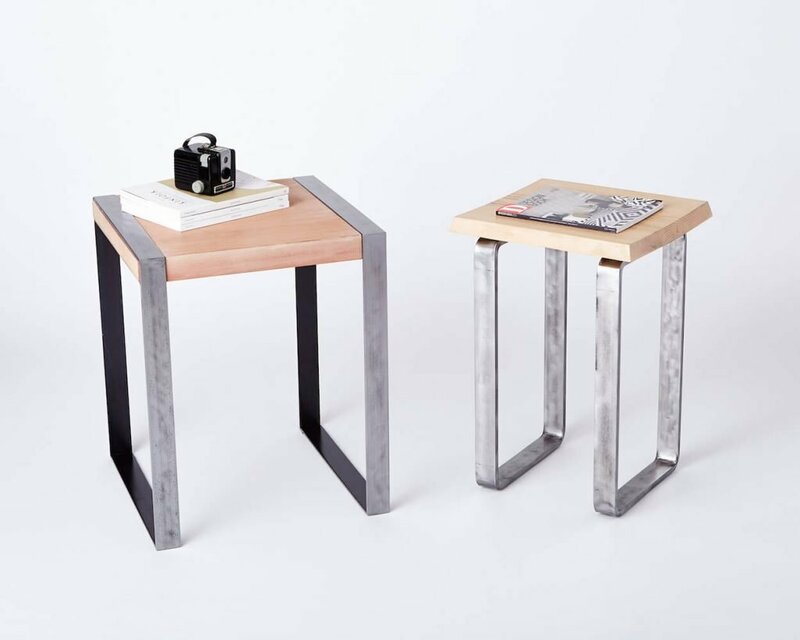 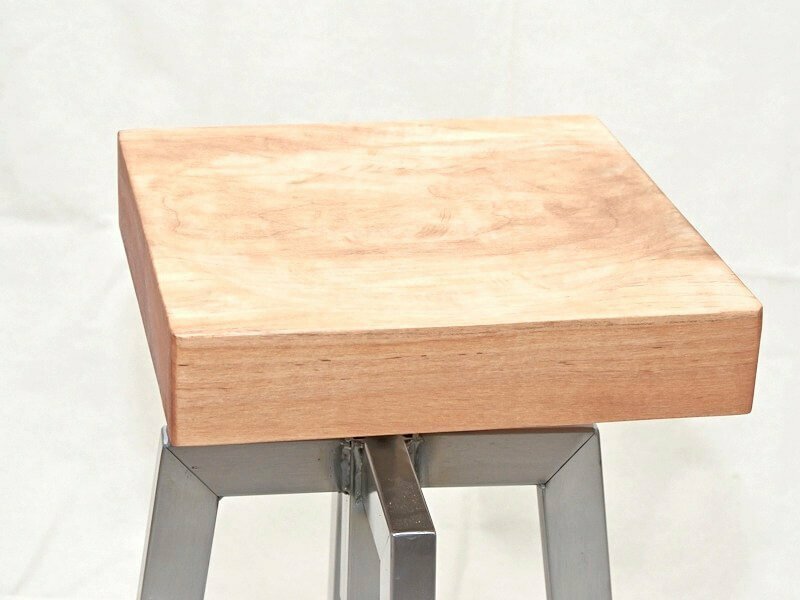 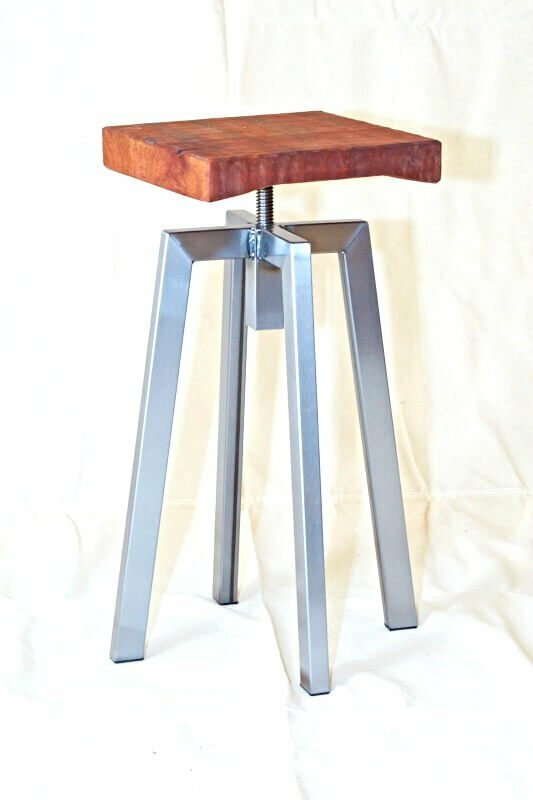 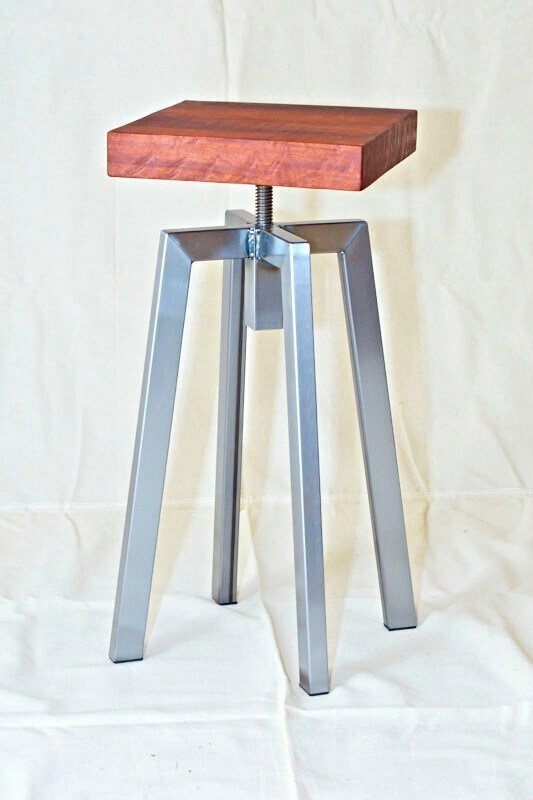 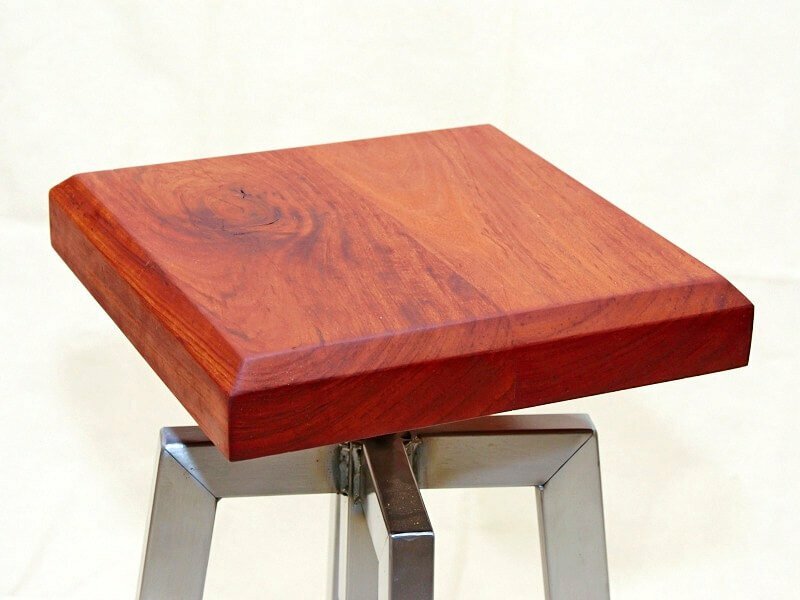 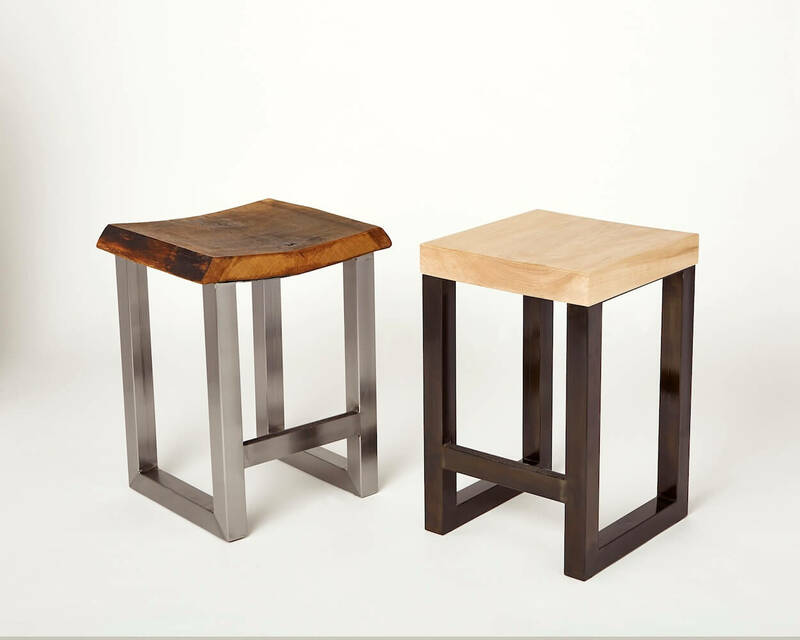 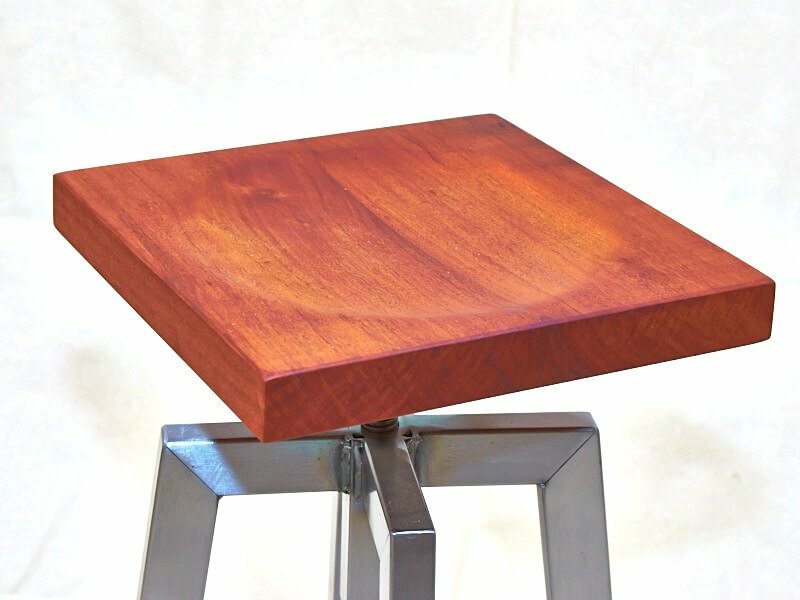 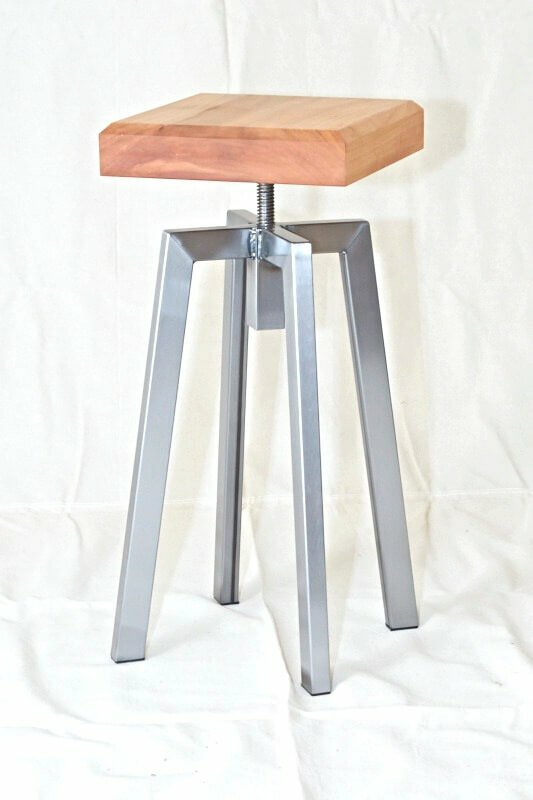 Steel end table doubles as a stool, and is available in a variety of finishes, including brushed, grinded, mill scale gray, blackened, and sepia. 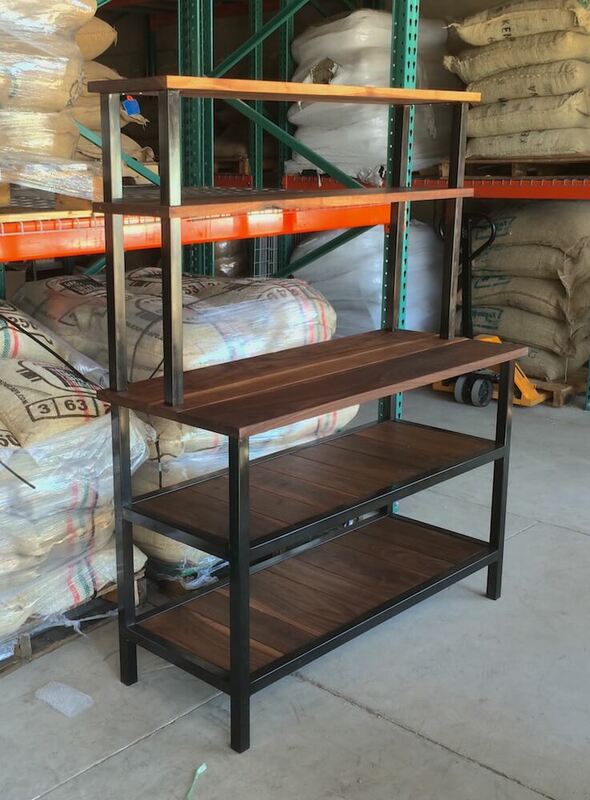 Oak Cliff Roasting Room Shelves — built for Dallas-based coffee importer and roaster Oak Cliff Coffee for their roasting room. 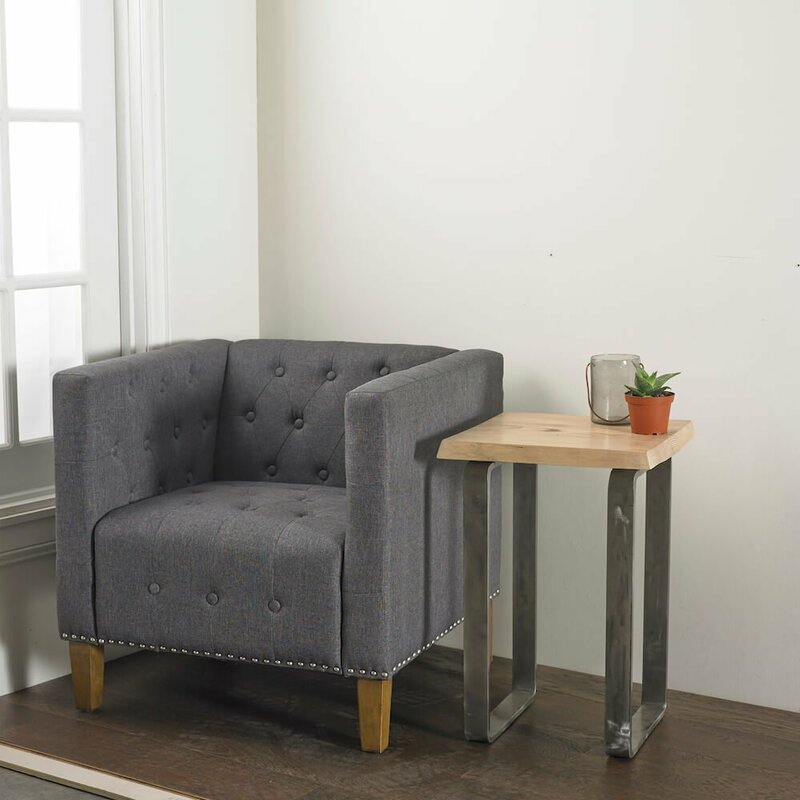 Sturdy 3/16-inch thick steel, pine, and cast iron casters make these pieces instant industrial classics. 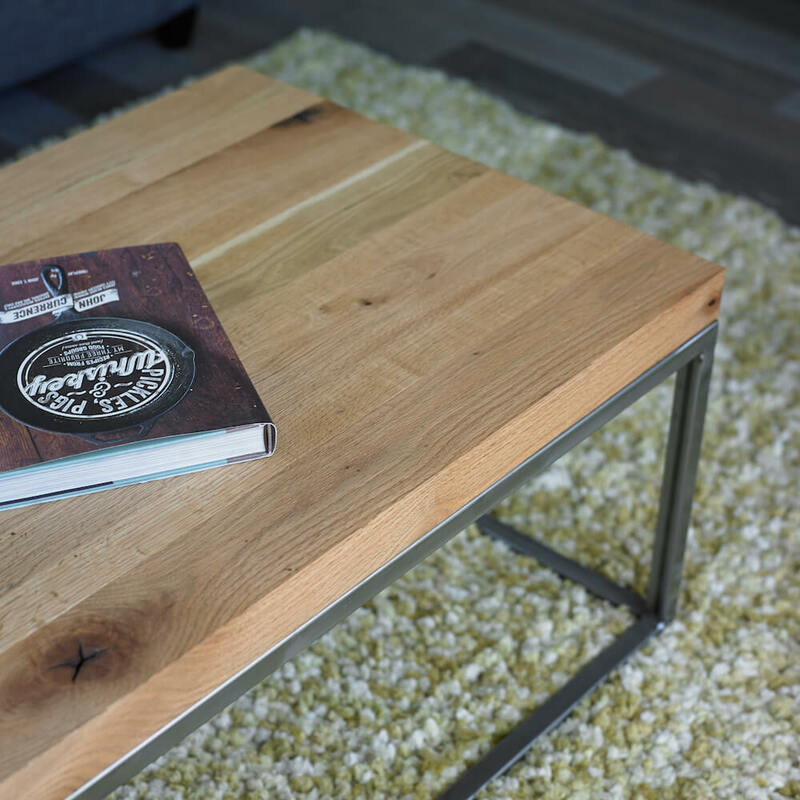 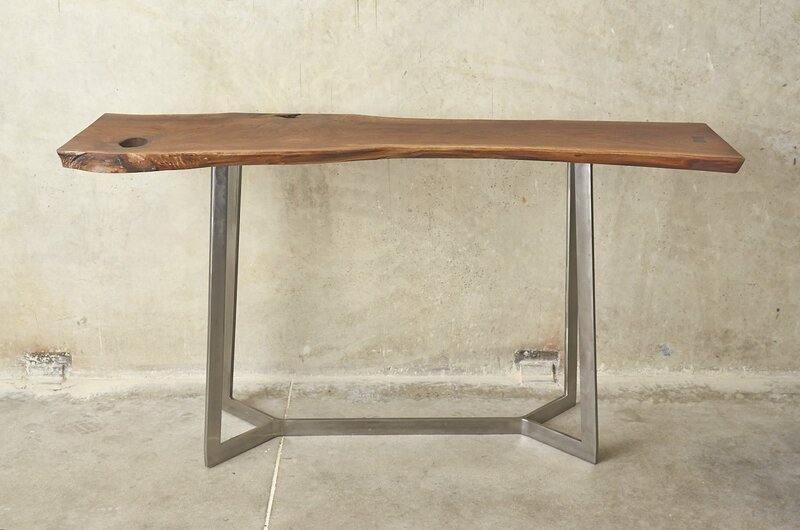 The beauty of a live edge oak tree section with a natural finish coupled with mill gray steel — this series includes console tables, end and coffee tables, benches, and service consoles. 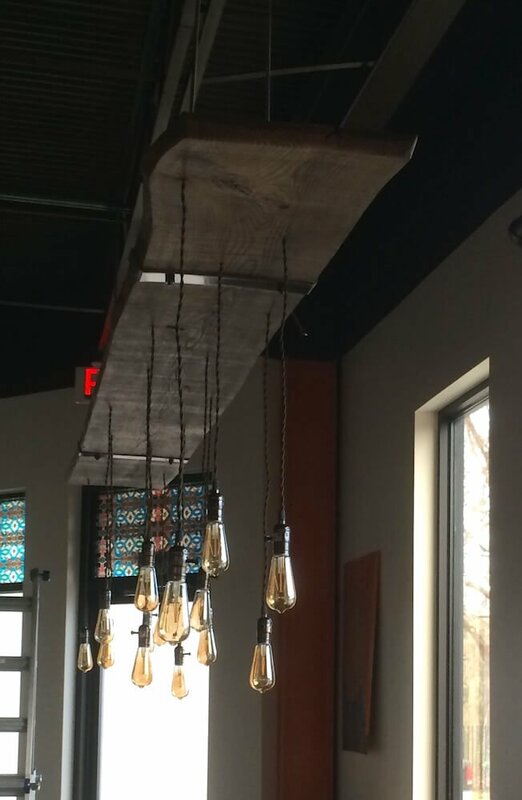 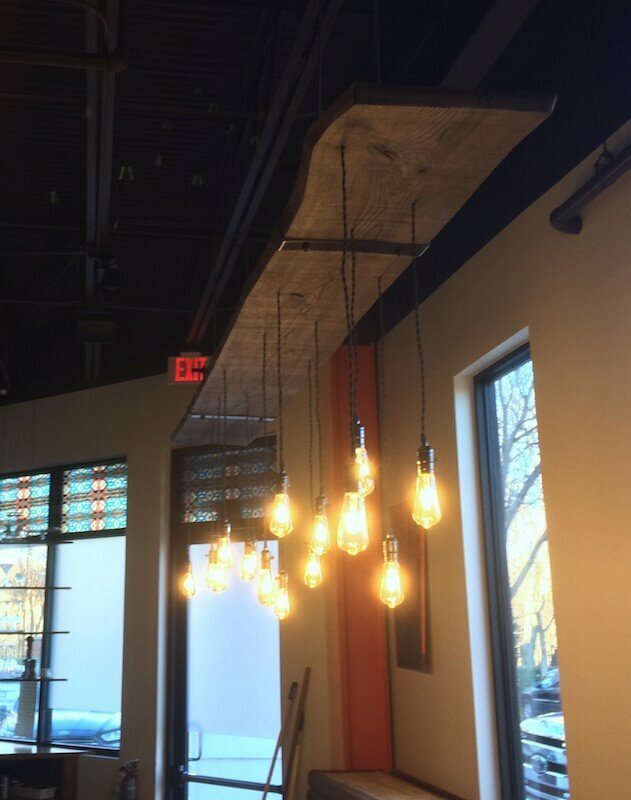 Plank Light in Savory Restaurant — 12-foot long live edge plank couple with hand forged steel brackets adorned with vintage-style light pendants for a Texas restaurant. 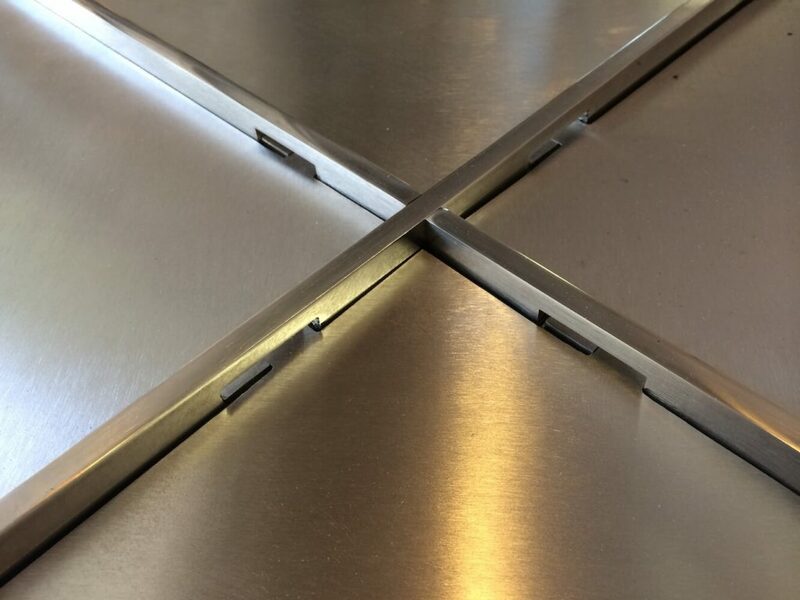 Detail of mirror-finished stainless steel table, awaiting it’s stone top and eventual trip to the Ritz Carleton in Puerto Rico. 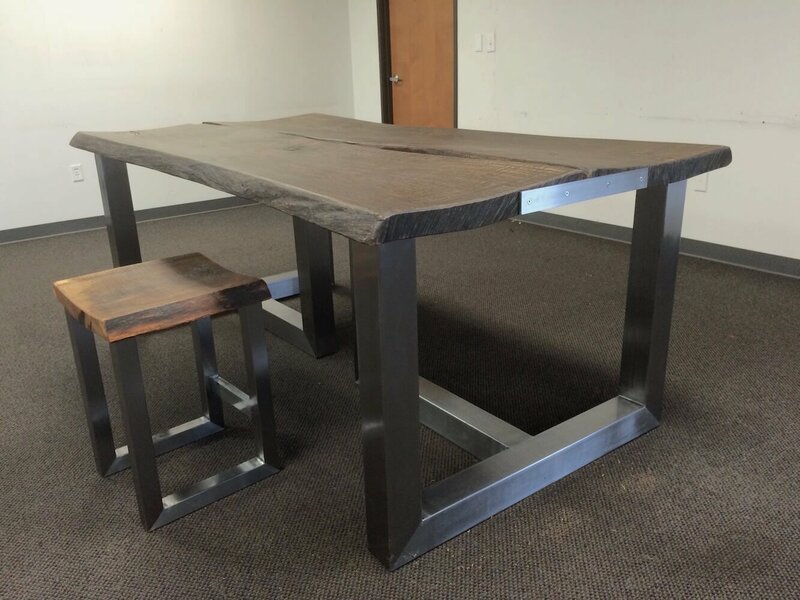 Steel table with Cedar plank shelves commissioned as a marketing team collaborative table for a corporate headquarters. 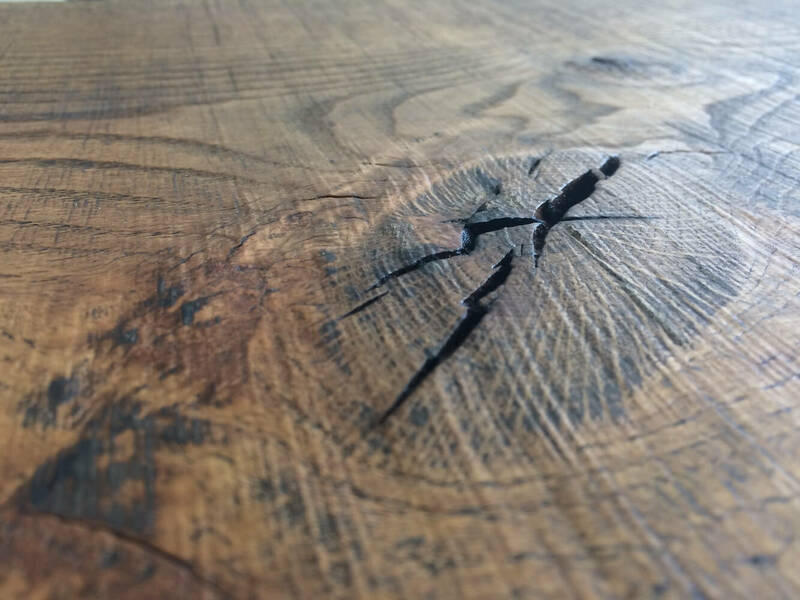 Customer supplied huge 3″ thick oak planks, with the wish that they be fashioned into a conference table, while preserving the live edges for possible other use later. 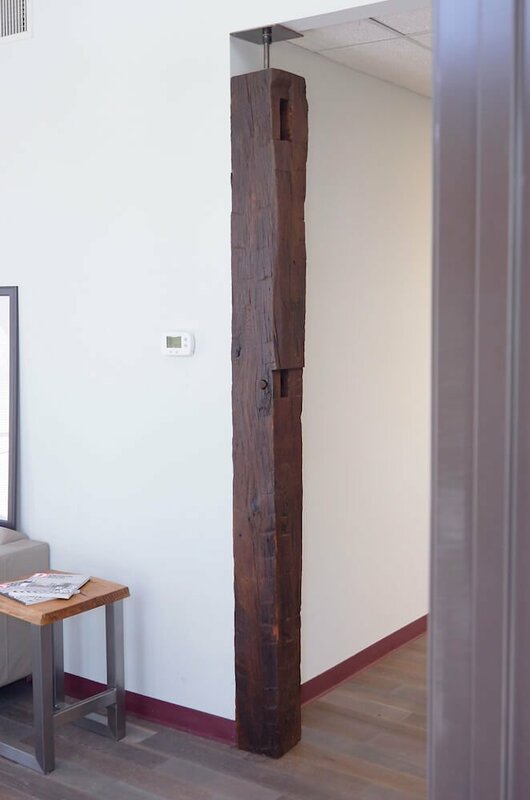 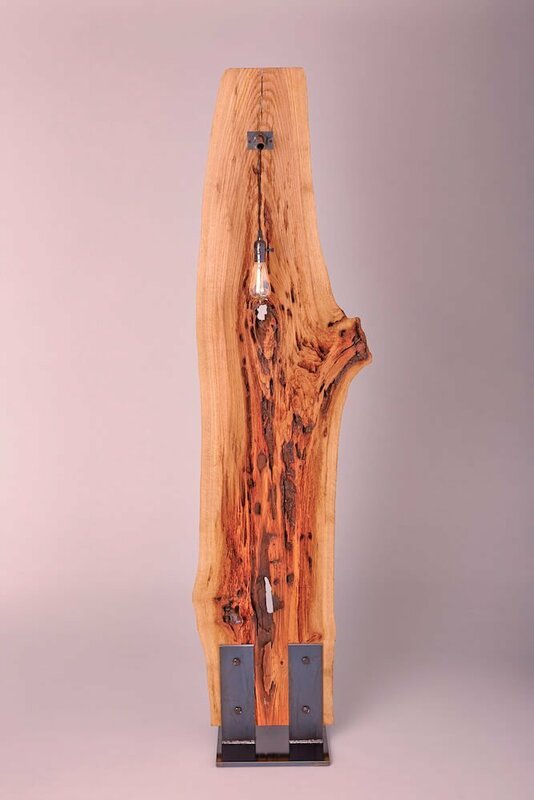 Stål Timber carved the planks to join together in the center, and built the massive brushed steel base, which could be disassembled to get into a small 30″ wide door. 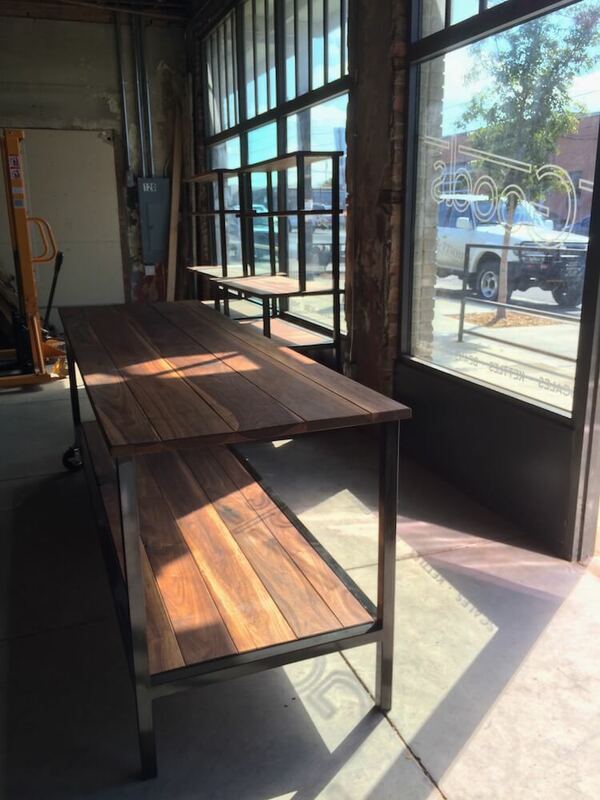 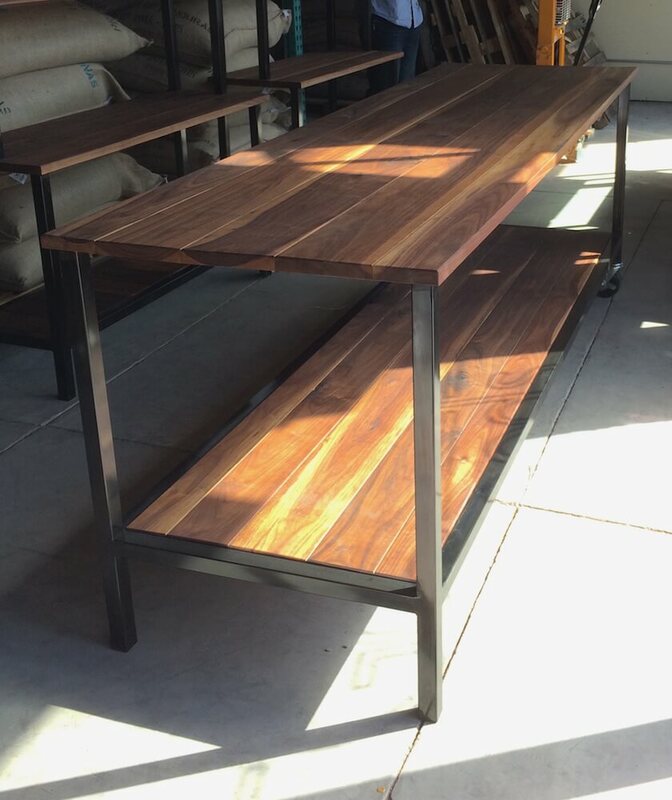 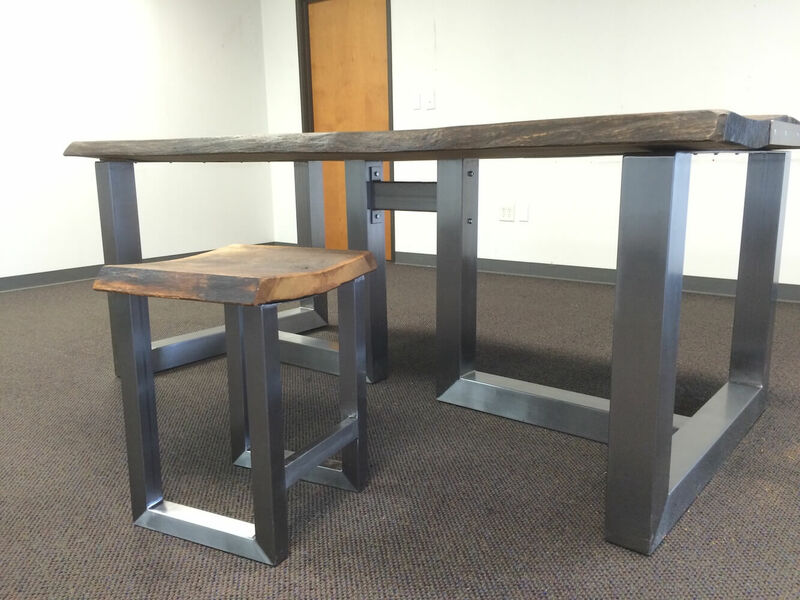 Steel common work table for four people in an office area of a local coffee shop headquarters. 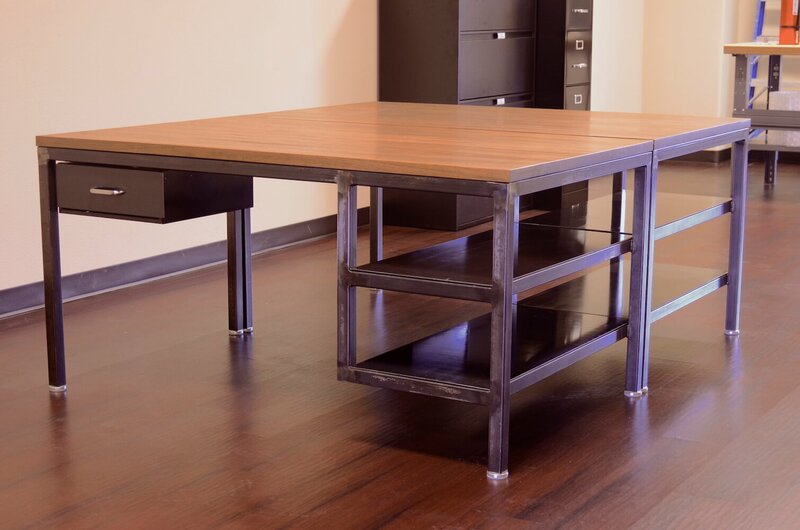 We were approached about one of our commercial production tables, and it evolved to a design to allow them to use this table as a four-person common desk. 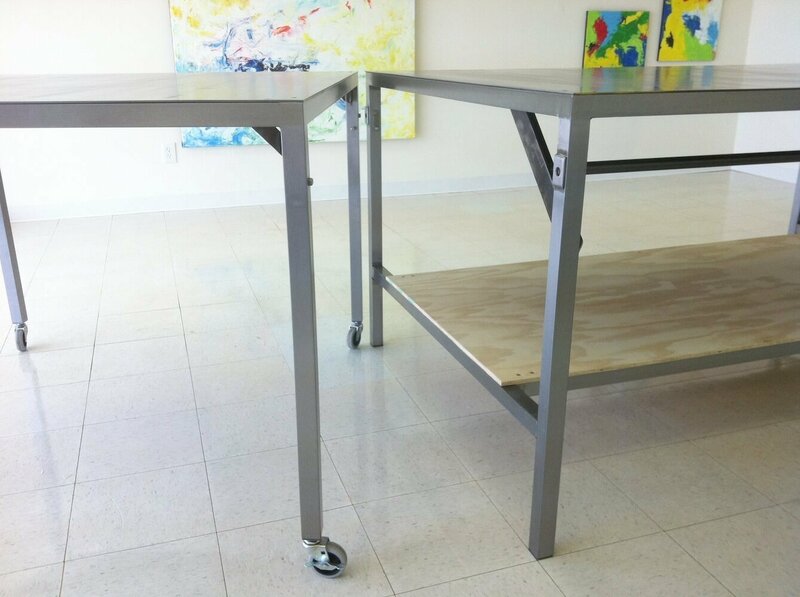 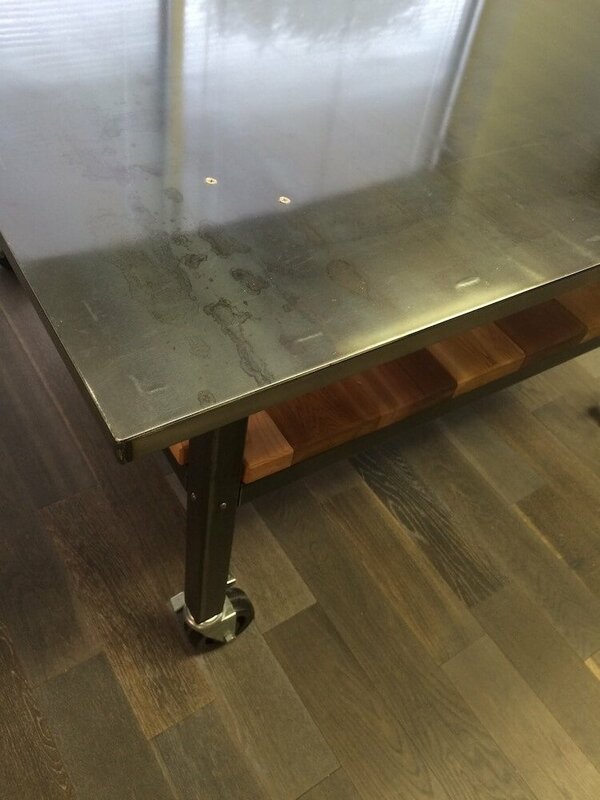 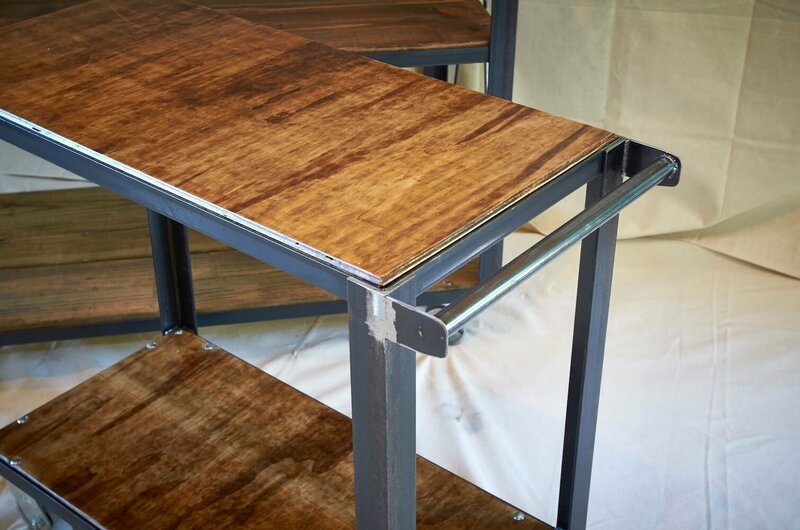 Industrial Steel Table at home in an office, lobby, or showroom. 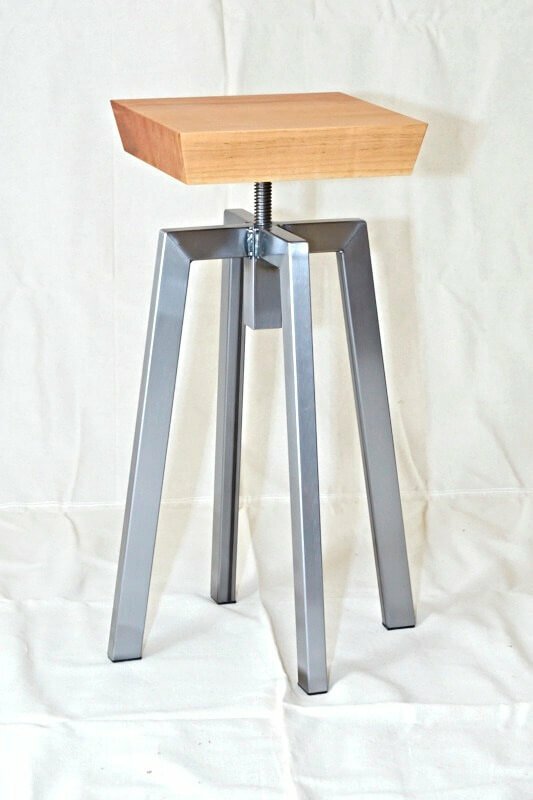 Showed with a grinded base and mill gray top. 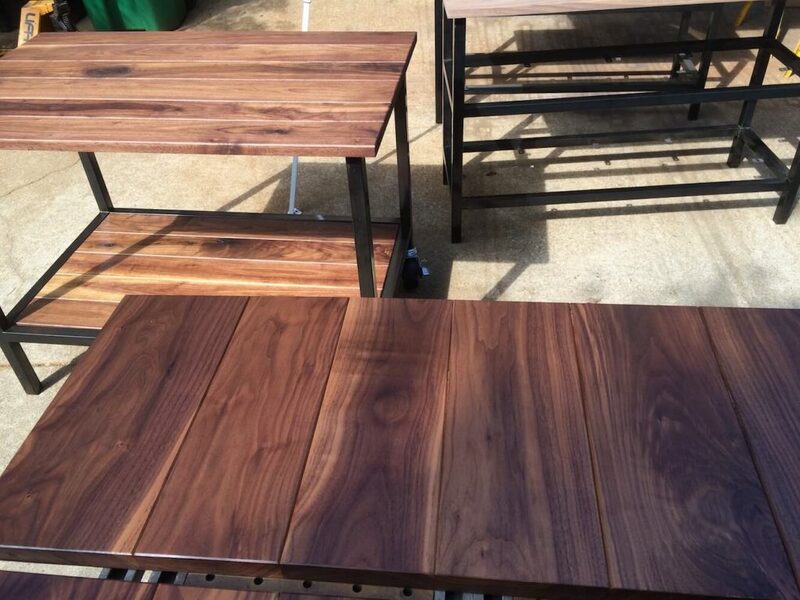 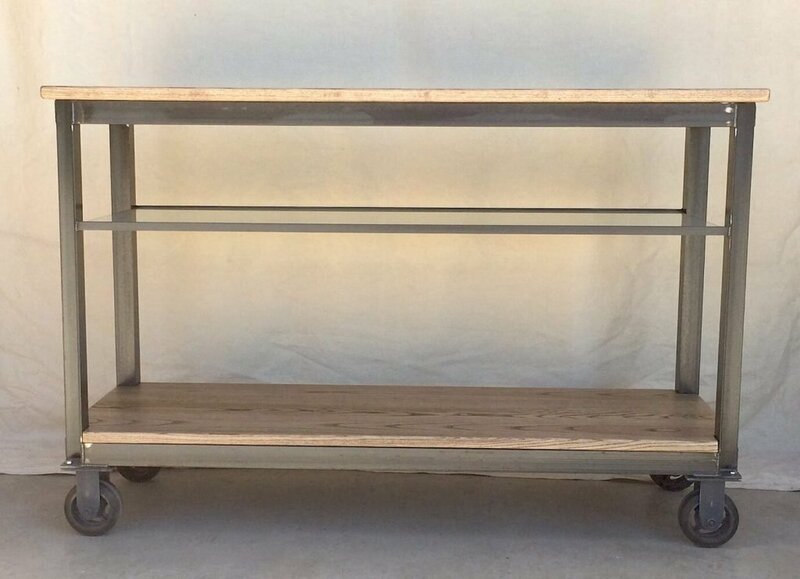 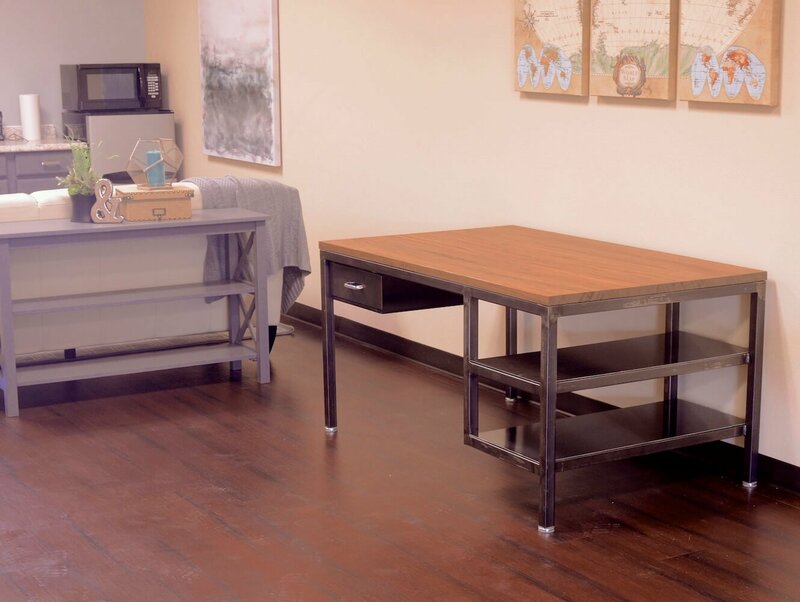 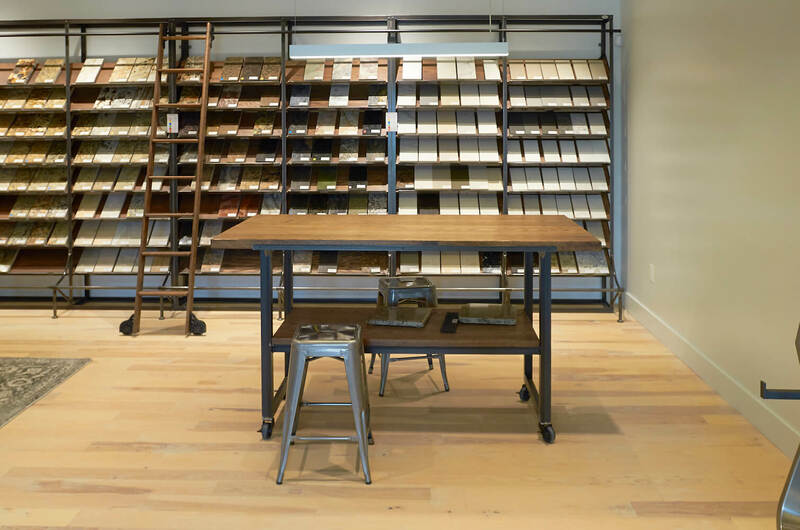 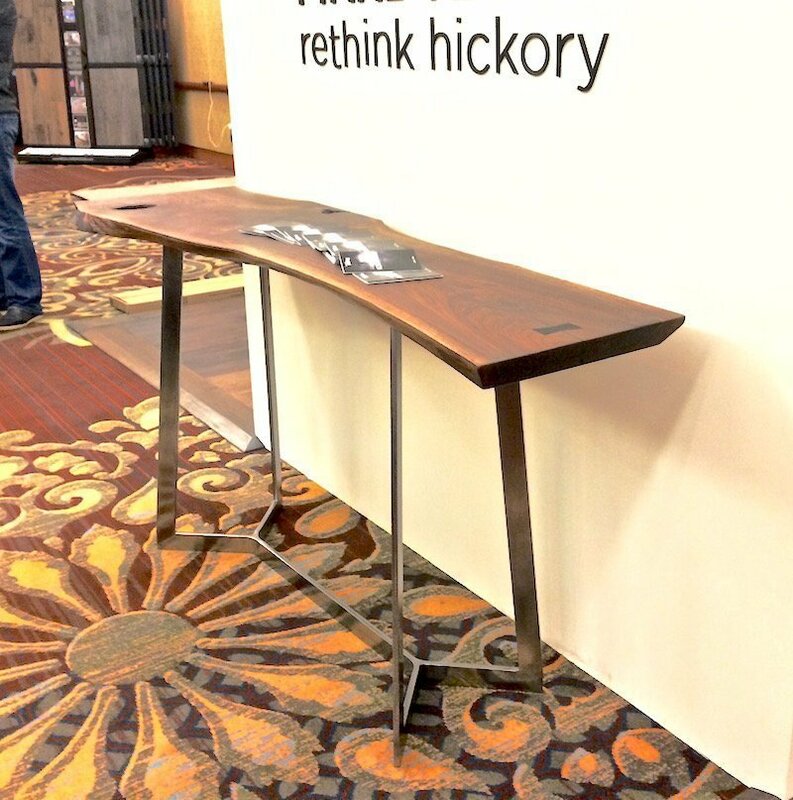 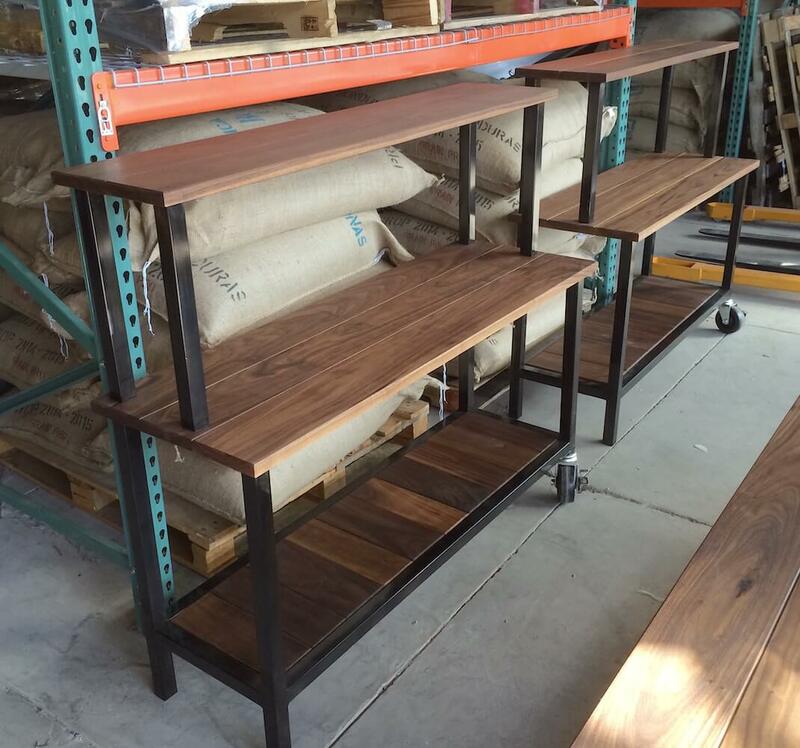 Walnut and Blackened Steel retail display tables and carts are perfect in all environments — from modern to industrial to rustic. 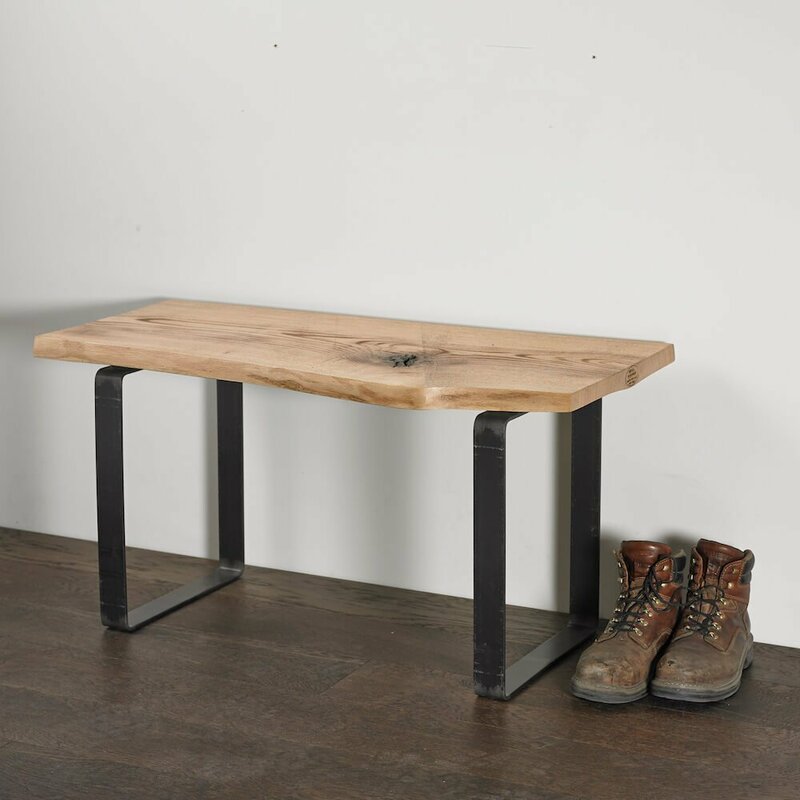 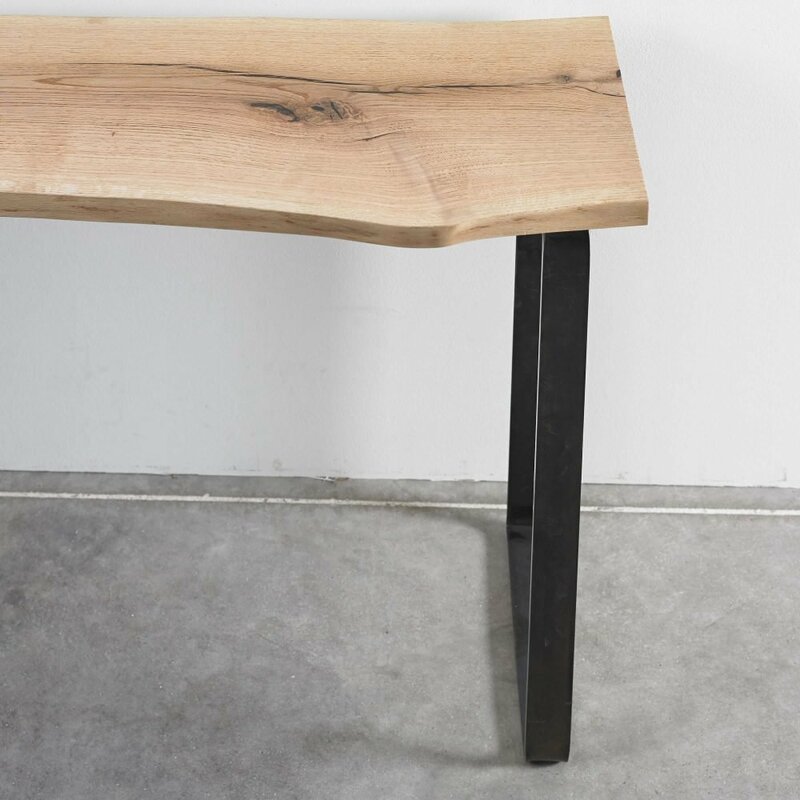 Oak live edge bench floating over ½” thick blackened steel legs. 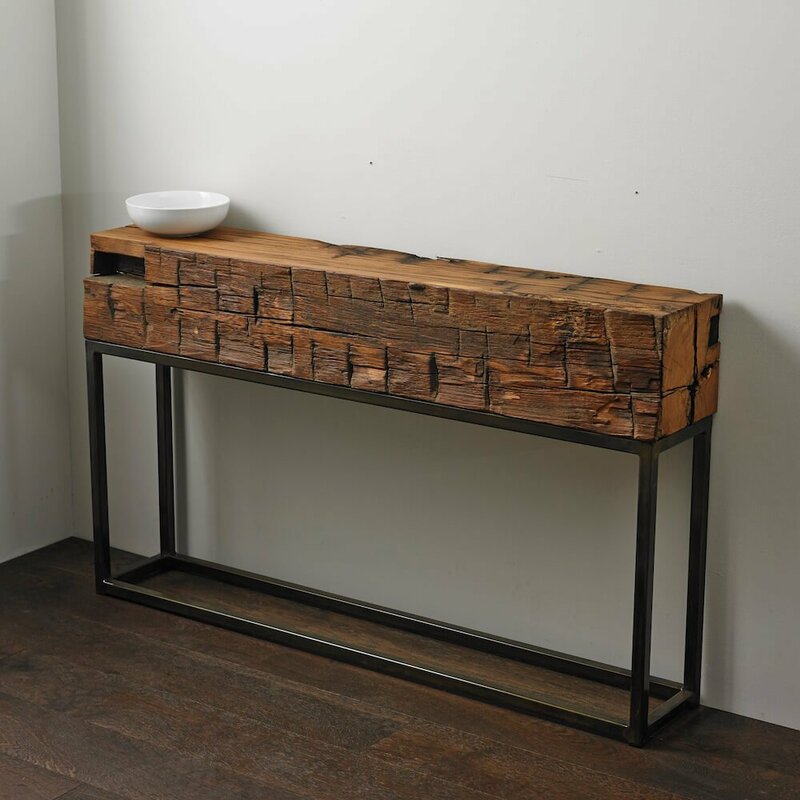 Antique Oak Beam Console Table, crafted from 1800s era Virginia barn wood on a sepia patina steel base. 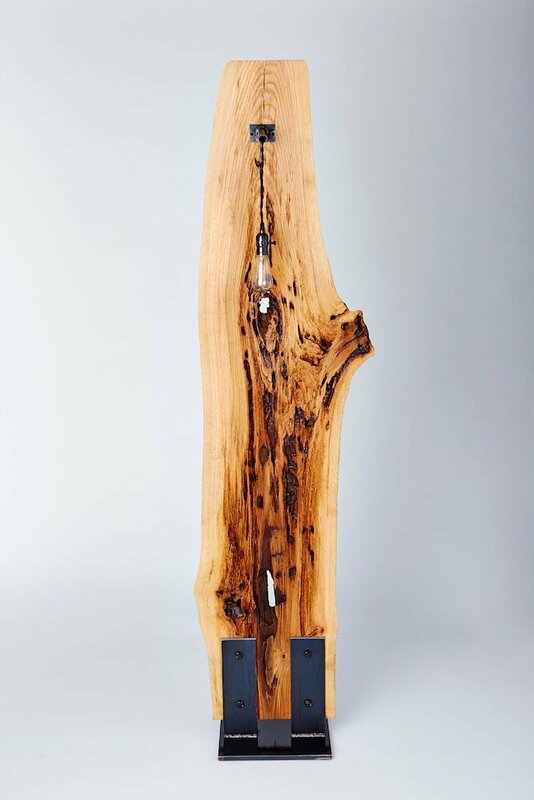 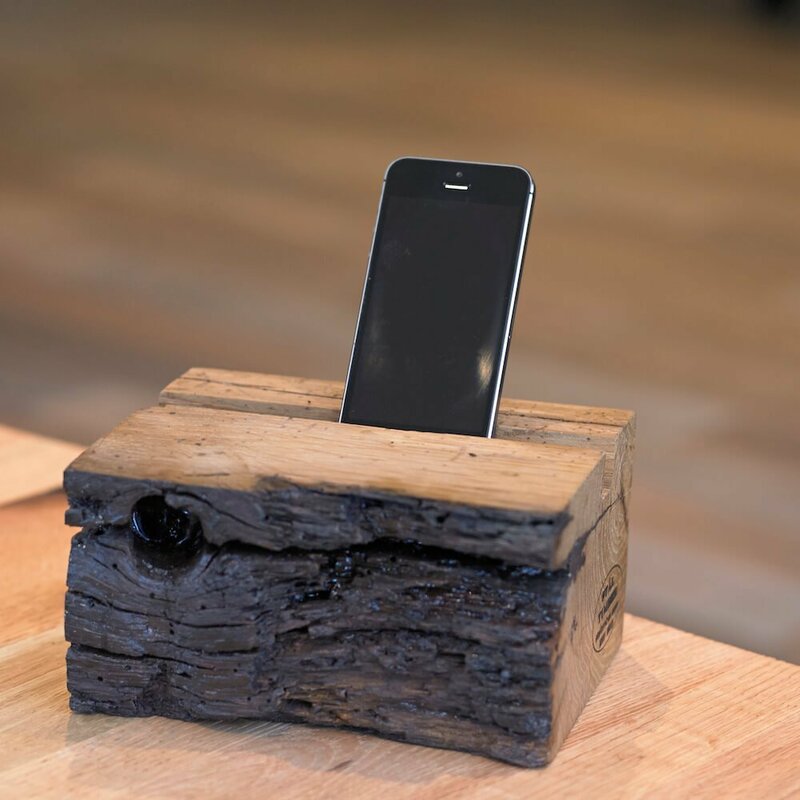 Phone and Tablet Perch, crafted from antique oak reclaimed from an 1800s era Virginia barn. 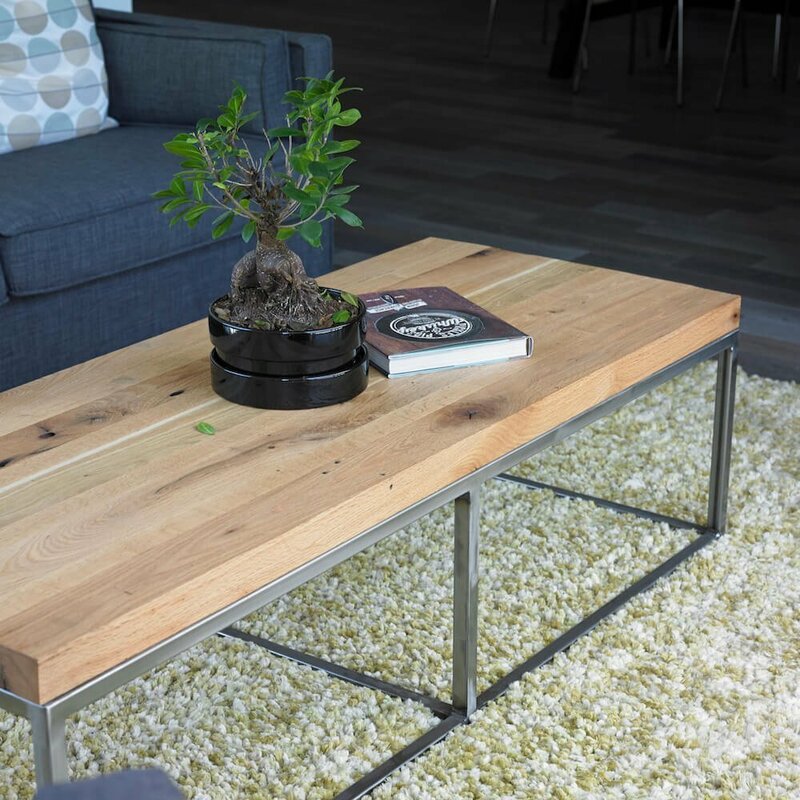 Accent tables made from antique beams in 24″ and 28″ heights. 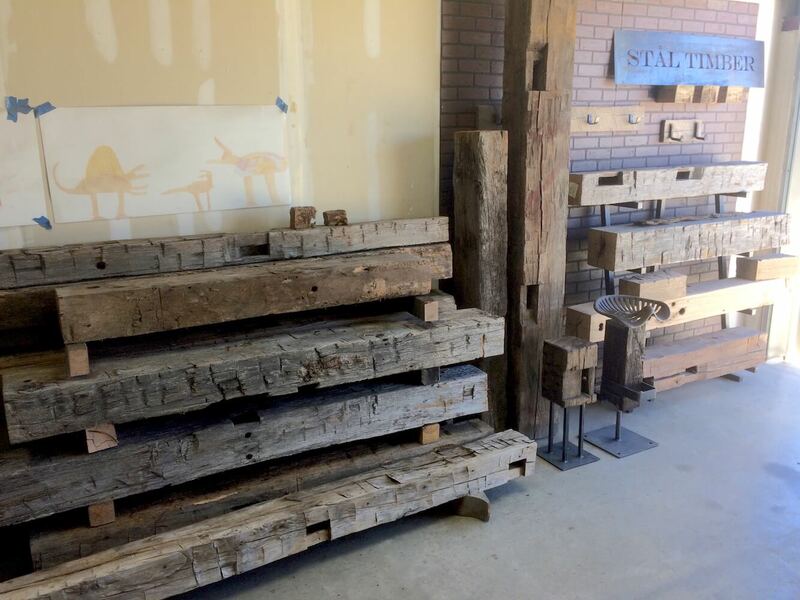 Some of Stål Timber’s stock of antique barn beams and items we make from them. 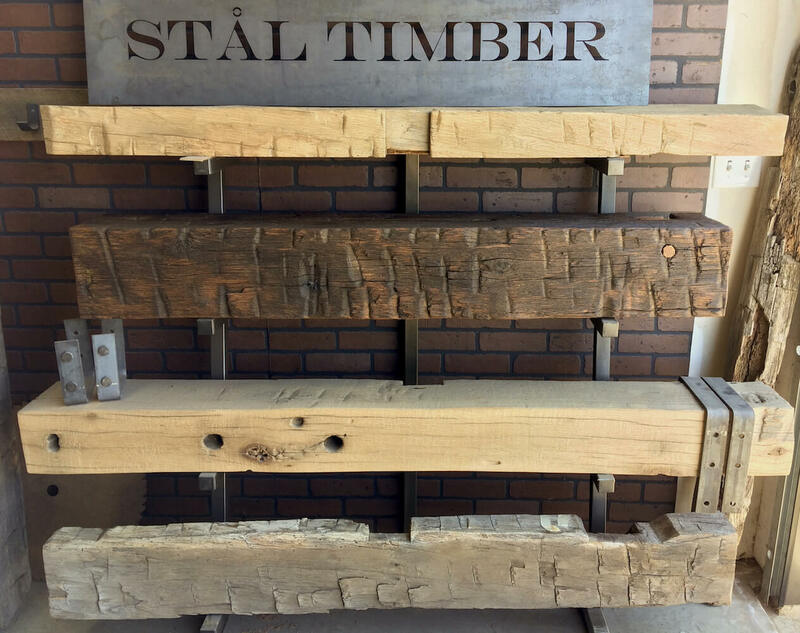 Stål Timber Antique Beam Mantel Examples, and some of our stock. 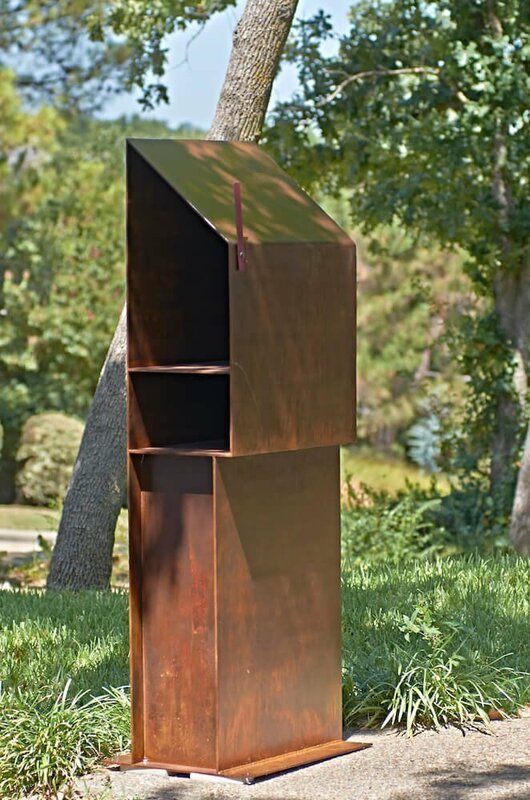 Vertical Book Tower in steel and live-edge oak. 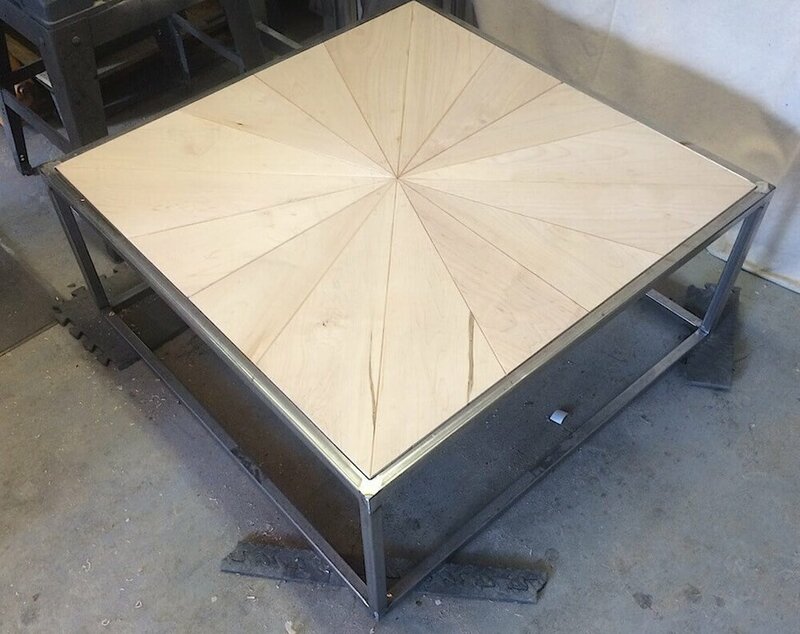 Maple and steel table for a custom commission. 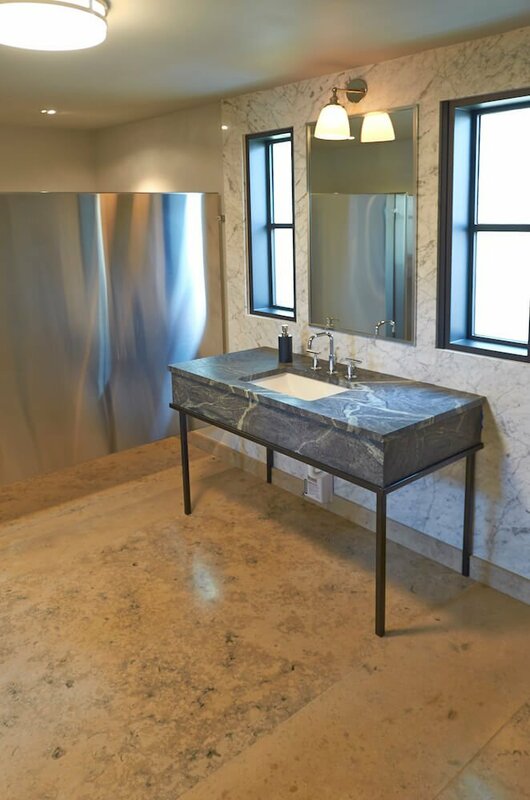 Brushed Steel Vanity, topped with a granite counter and marble sink. 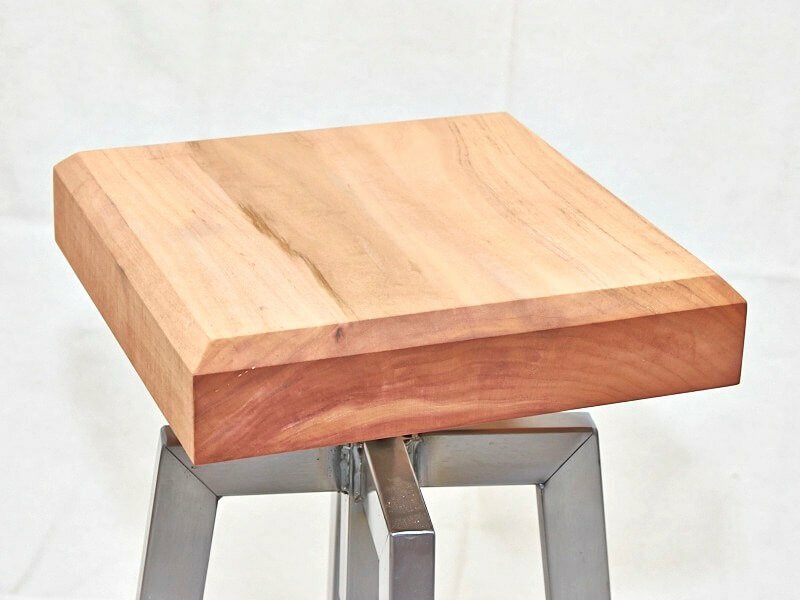 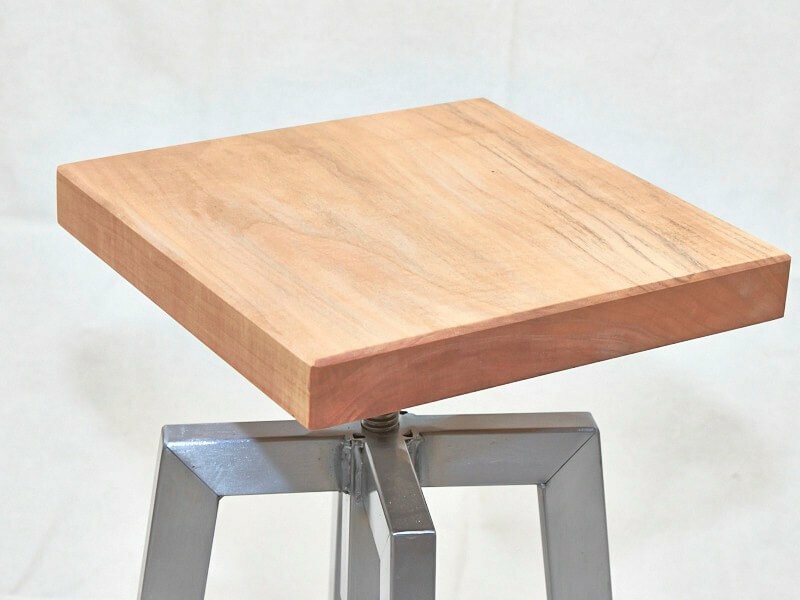 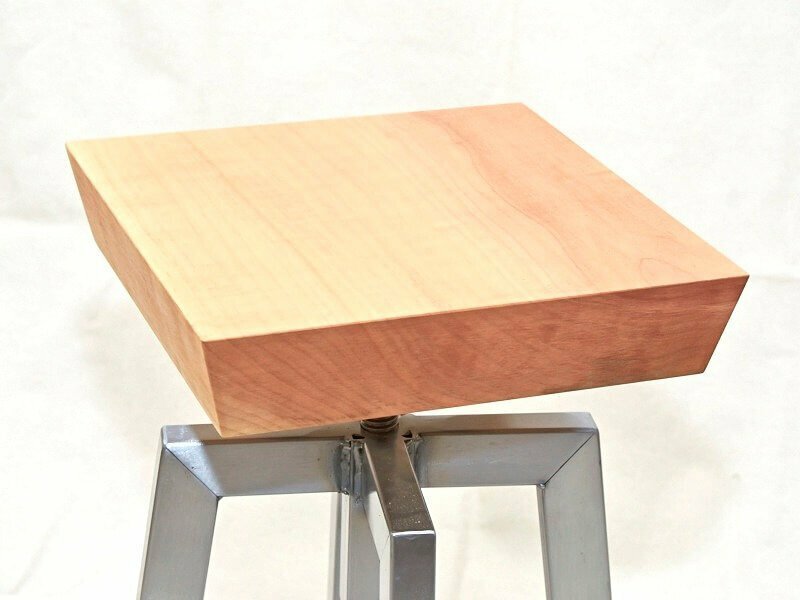 Solid Cedar side bar table, inspired by Japanese Torii Arch. 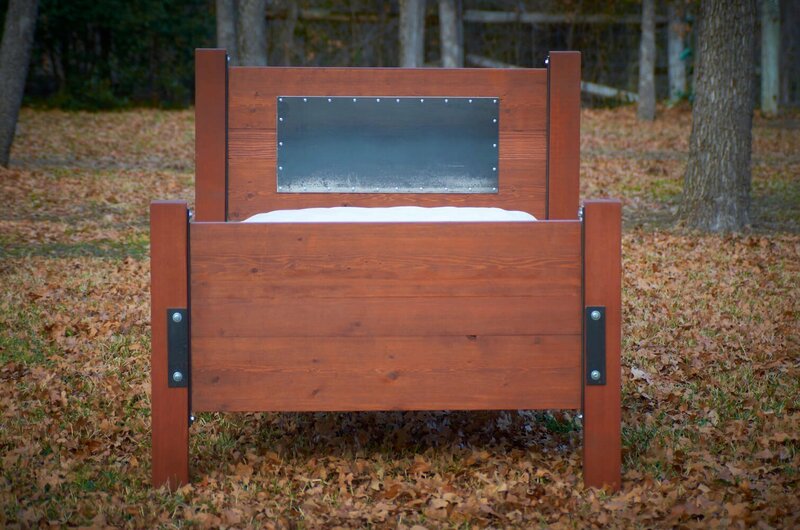 Solid Cedar and Steel camp bed for a young man’s room (indoors, of course…). 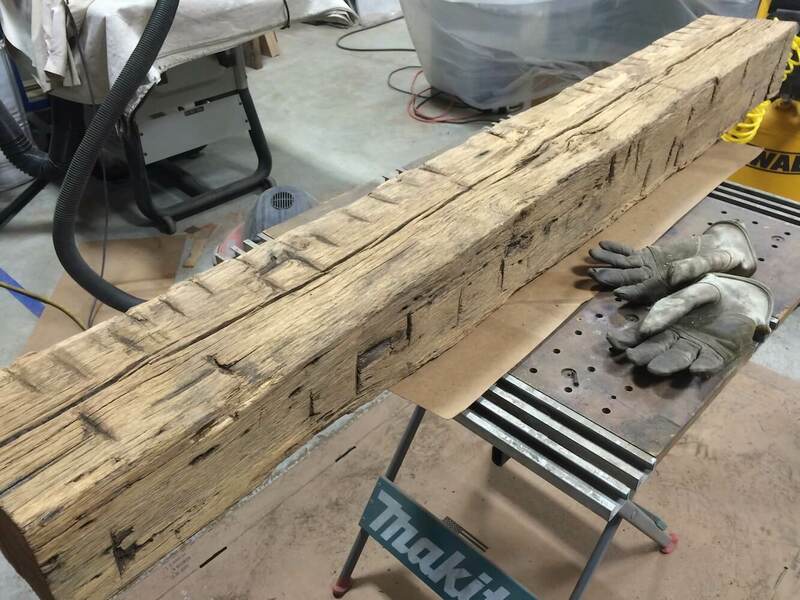 Antique Barn Wood Console Tables, each showing the evidence of Mortise and Tenon construction of the original structure. 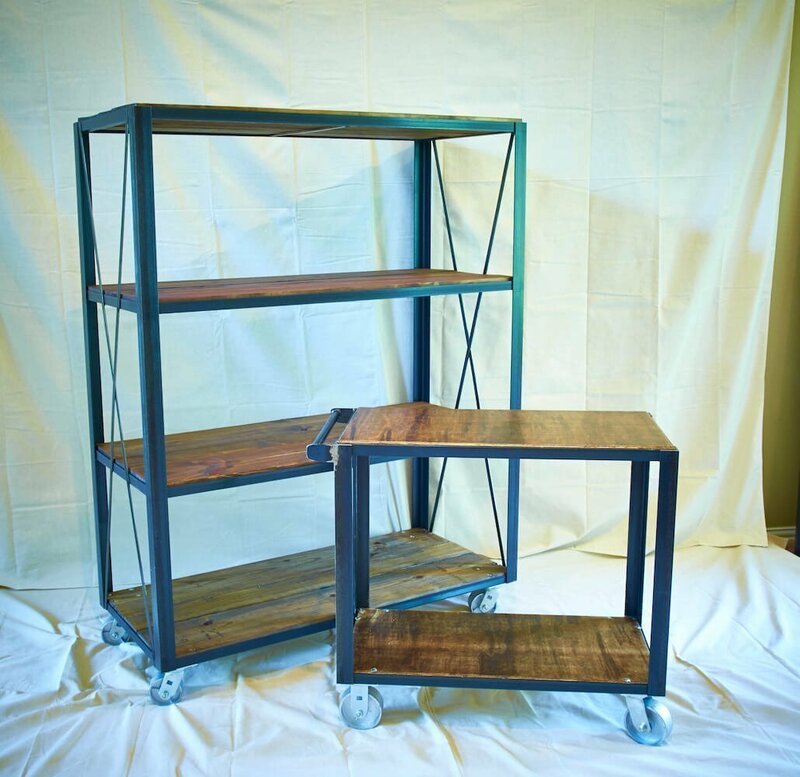 Shown in 54″ and 30″, with Sepia patina steel bases. 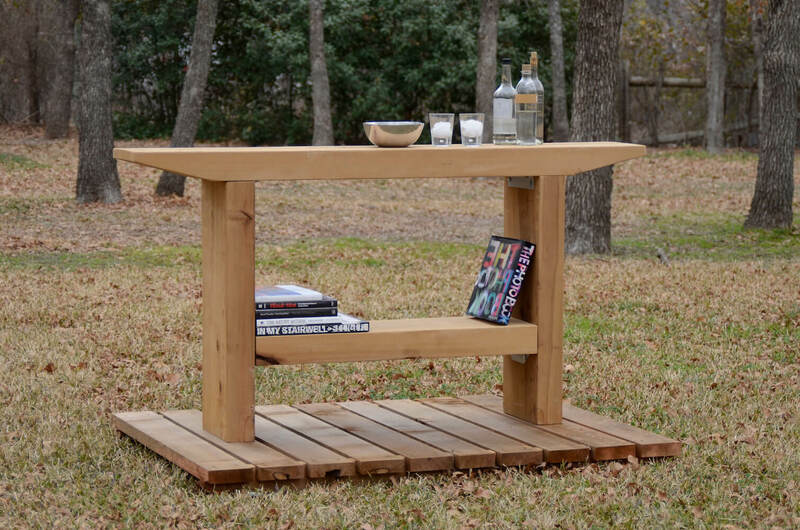 Oak Live Edge End Table, doubles as a sturdy stool. 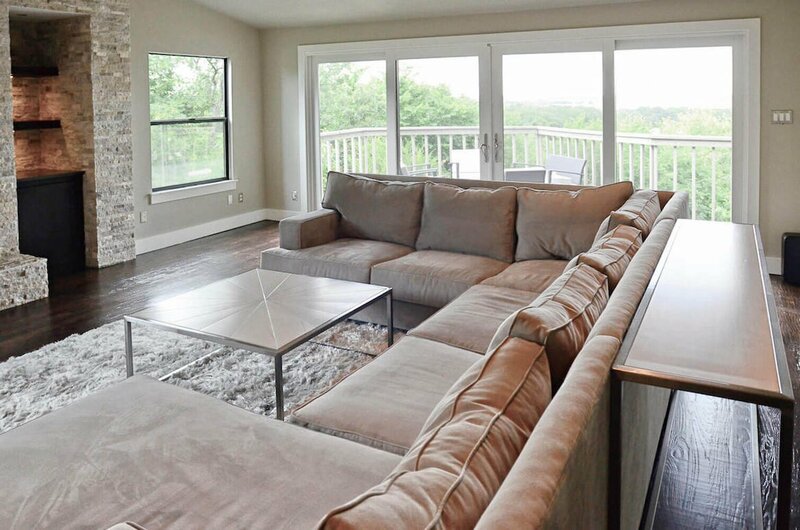 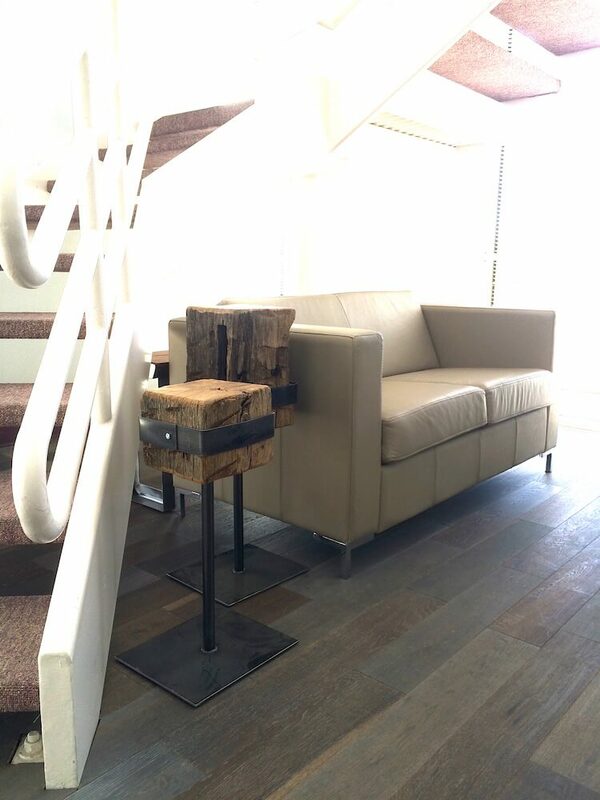 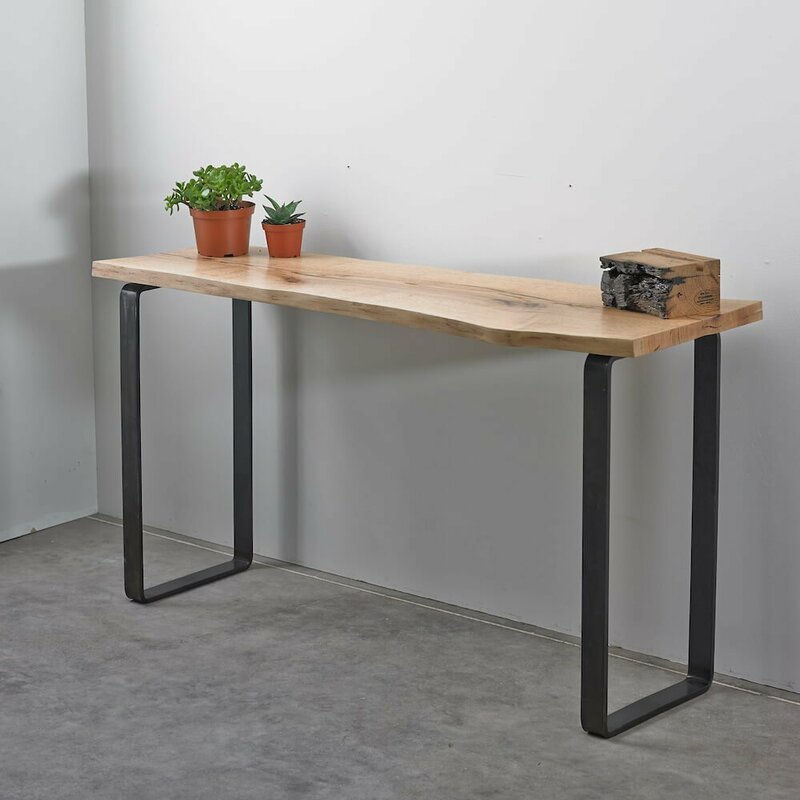 Shown in Natural finish with bright rustic steel legs. 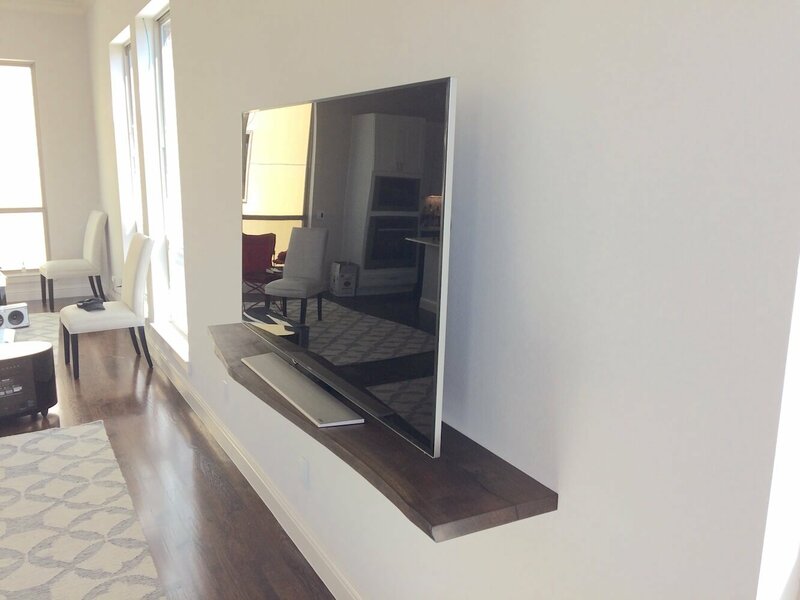 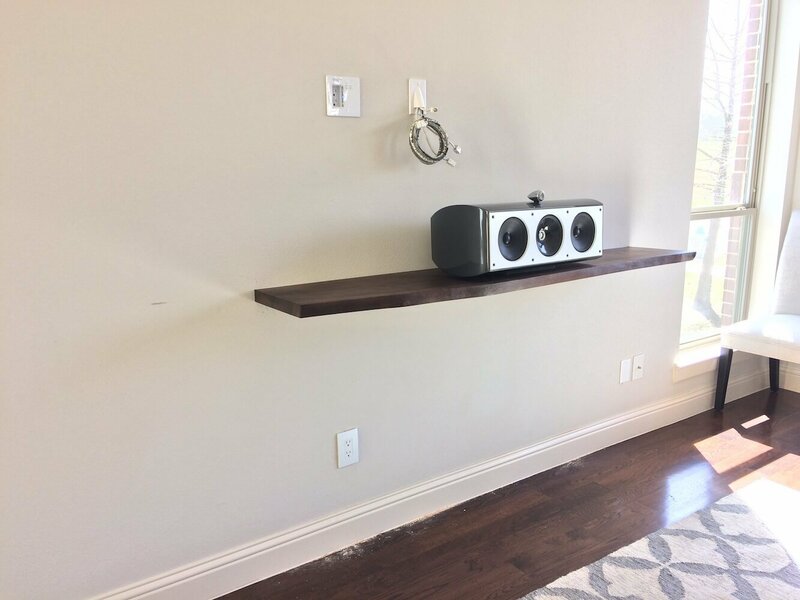 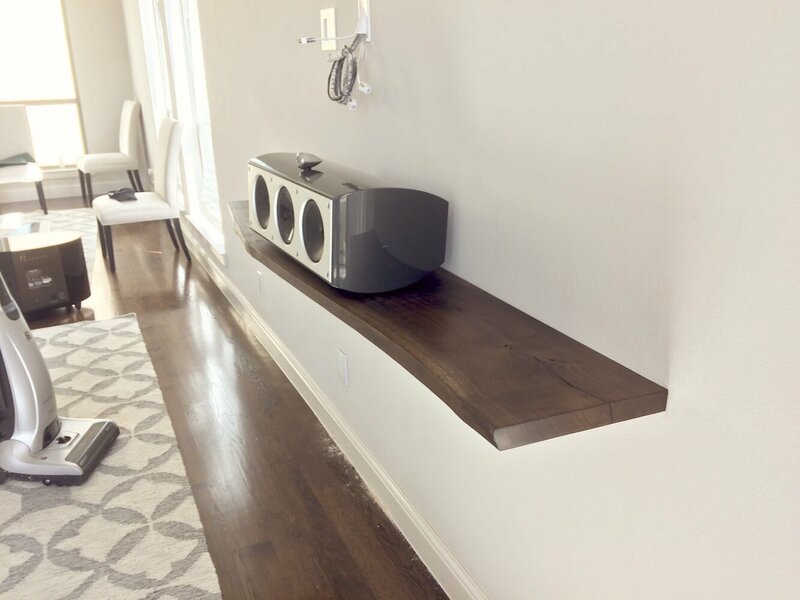 Floating (bracketless) shelf from solid Walnut live edge wood slab. 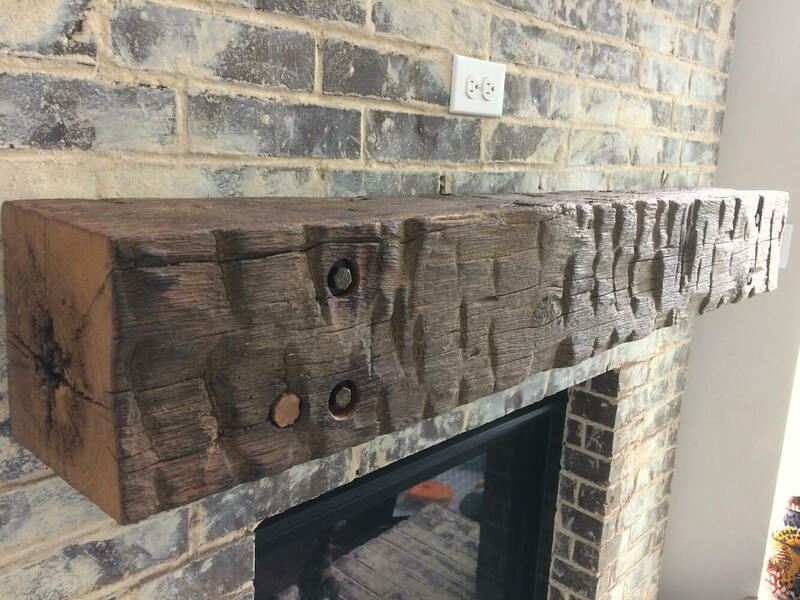 72″ long x 15″ wide. 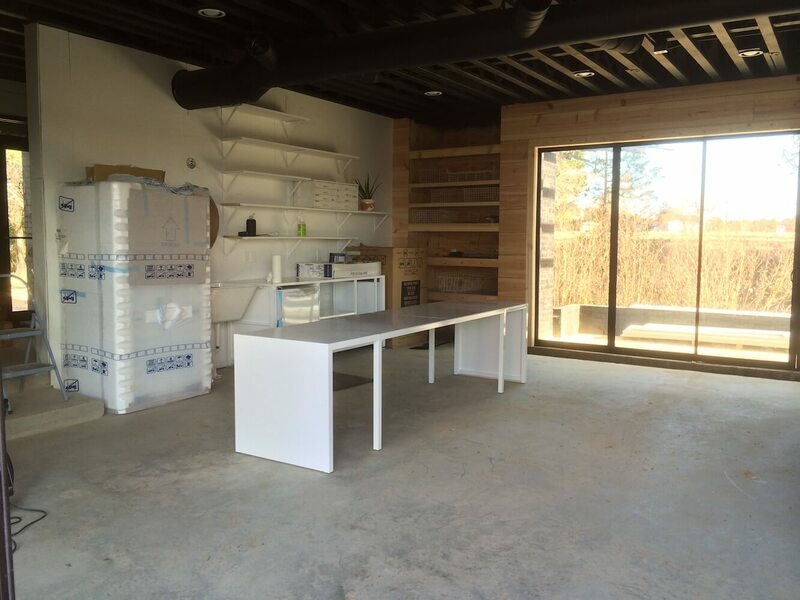 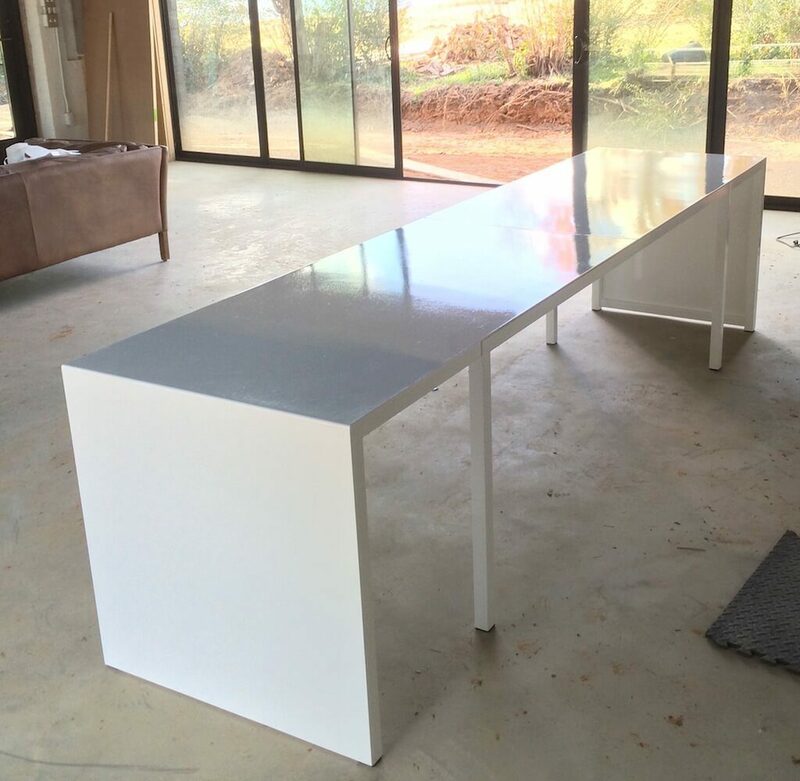 Built for a newly constructed minimalist modern farm house, a kitchen waterfall table, steel counter assembly, and wall shelving brackets in white powder coating. 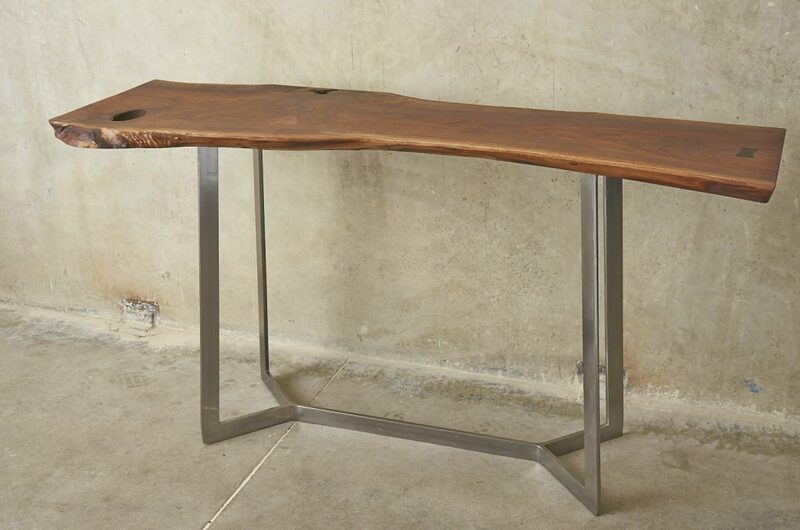 Live Edge Bench with Steel legs and rear profile. 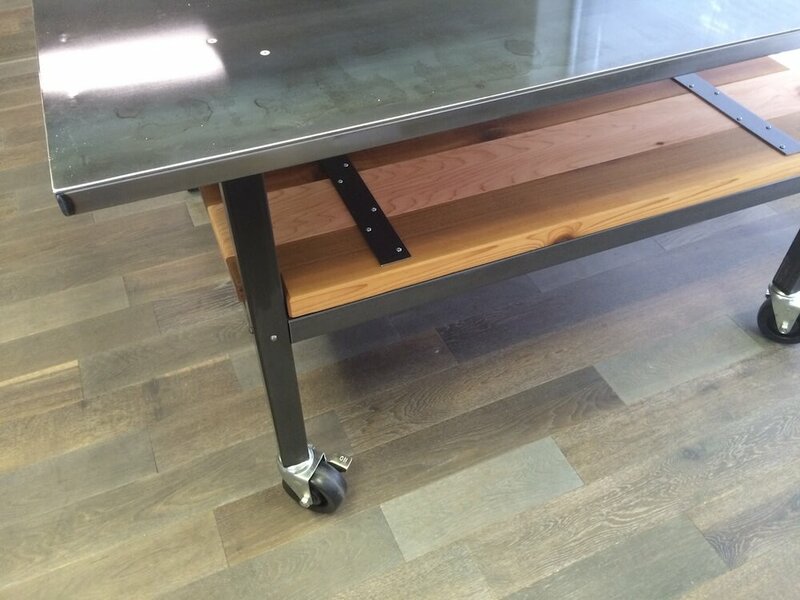 Brushed steel and Ebony stained reclaimed Spanish Cedar. 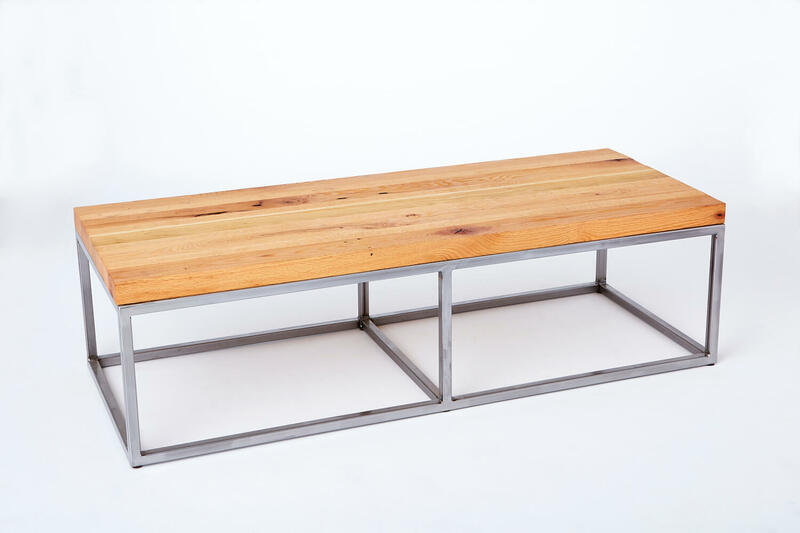 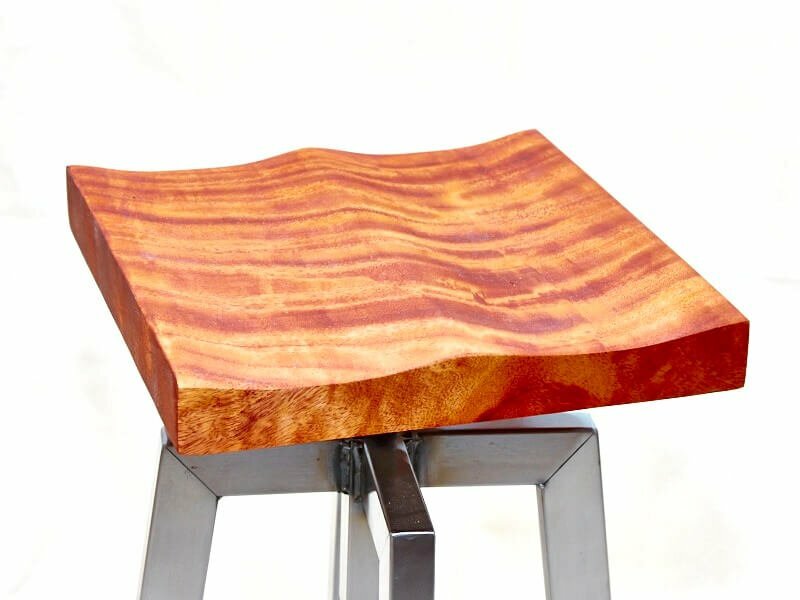 Designed for end, coffee, and console tables/benches. 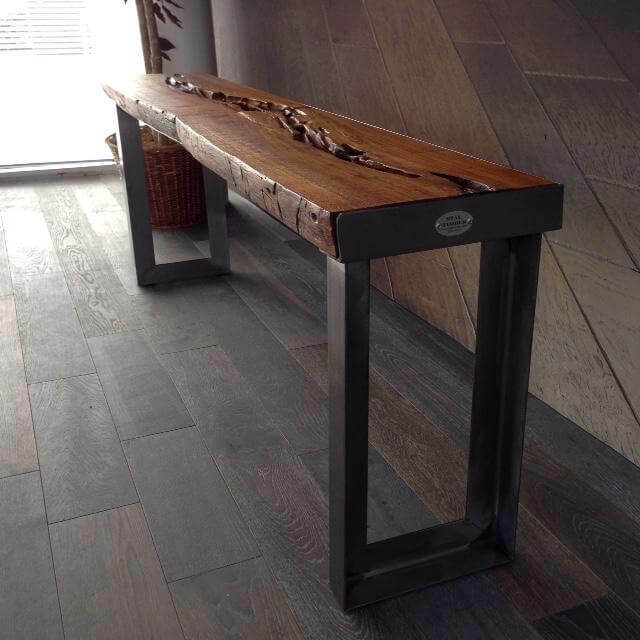 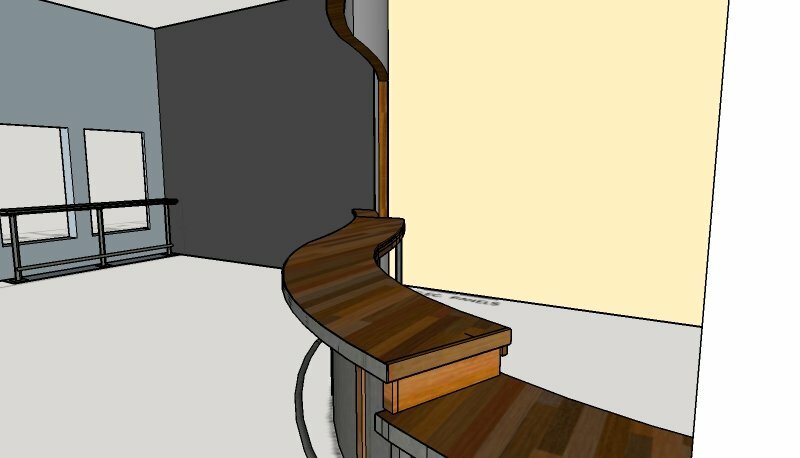 Part of our Live Edge Loop Leg series. 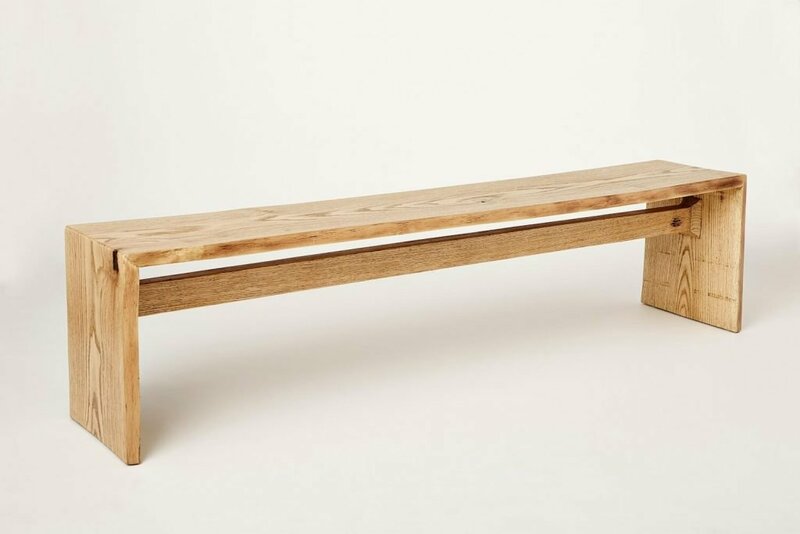 Bench in Natural finish oak with Mill Scale steel legs, 36″ long. 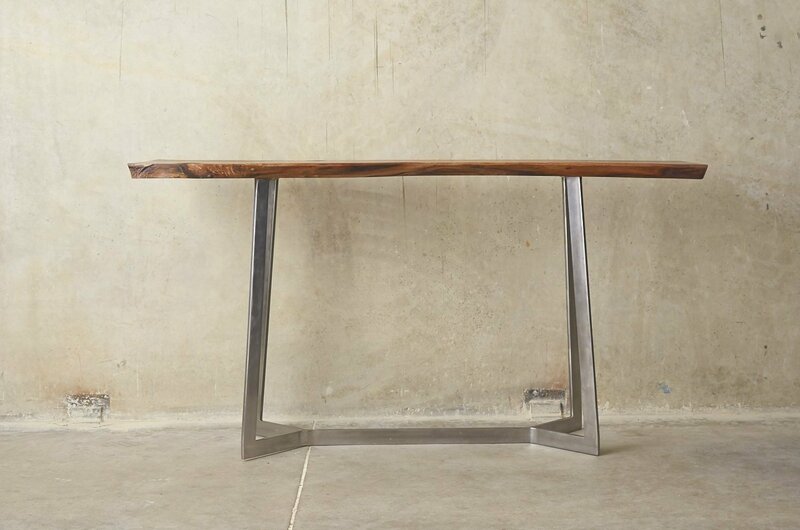 From our Live Edge Loop Leg series — console table in Natural finish oak with ½” thick steel legs in Mill Scale Gray steel. 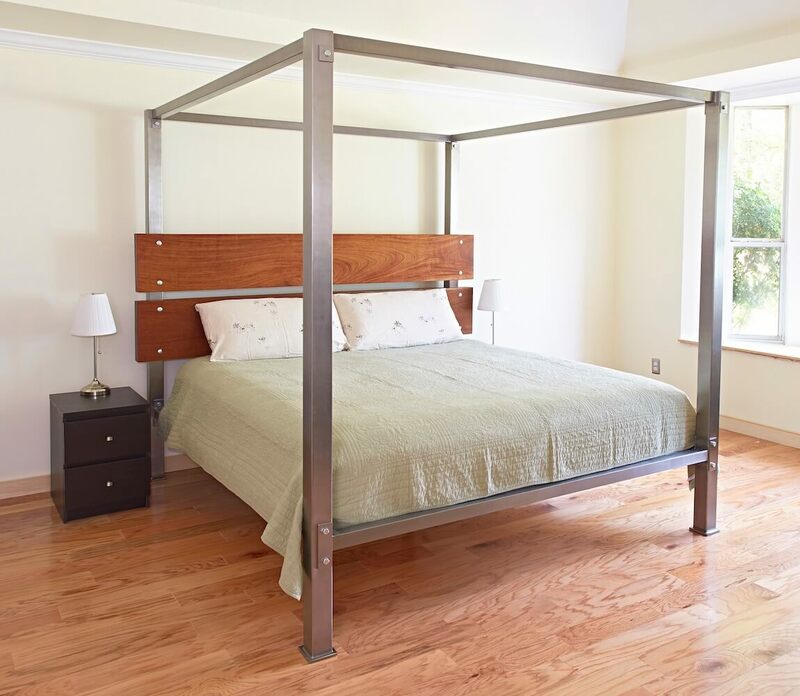 King Size canopy Bed with 3″ columns in brushed steel. 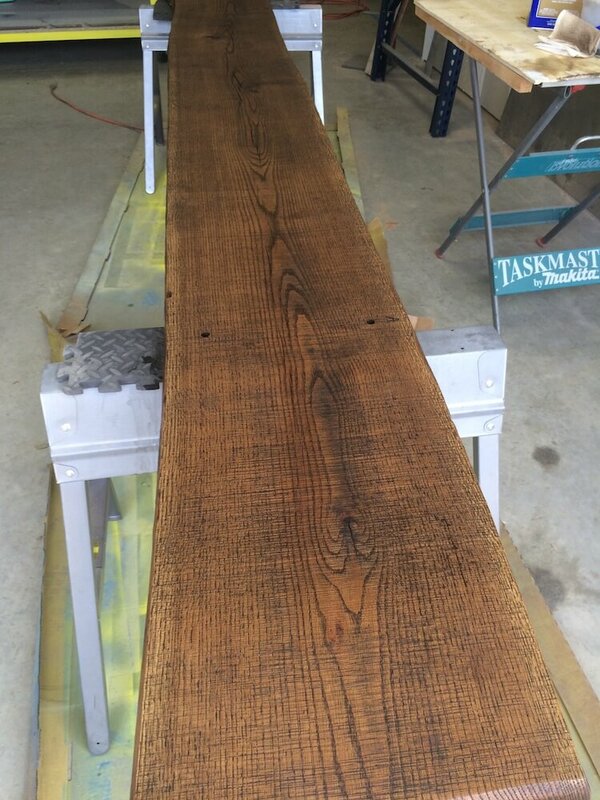 The headboard rails are oiled and waxed African Mahogany, 12″ wide and a full 3″ thick. 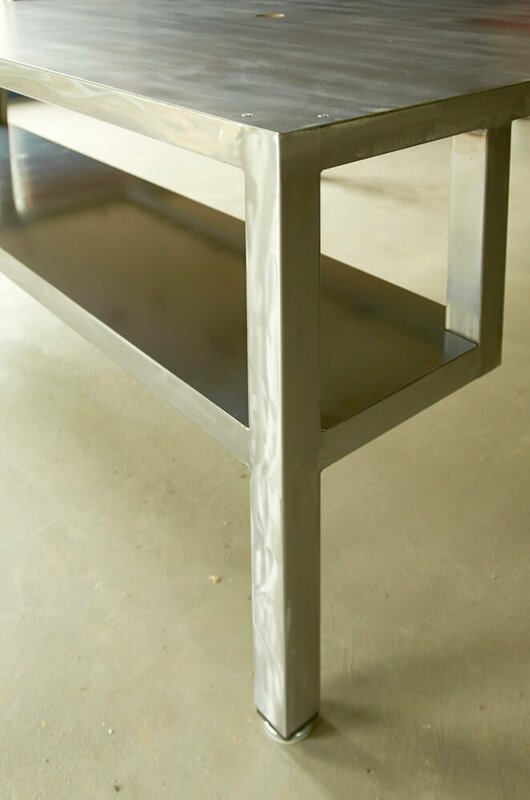 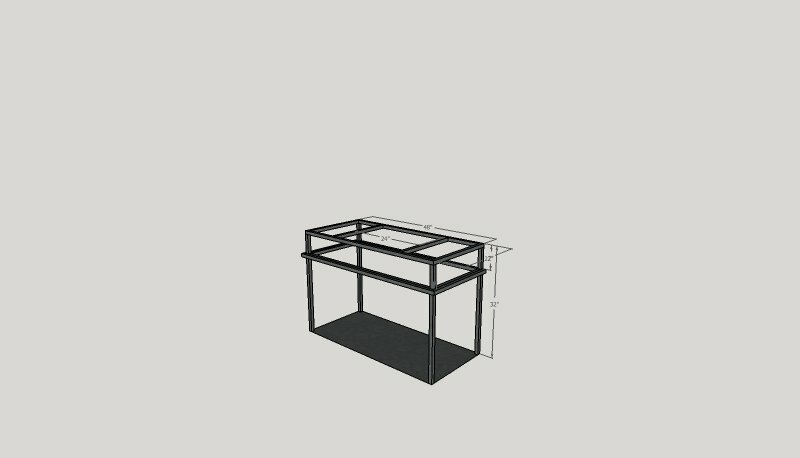 All metal seams are sculpted, and the Odin bed can be used as a platform bed or with a box spring. 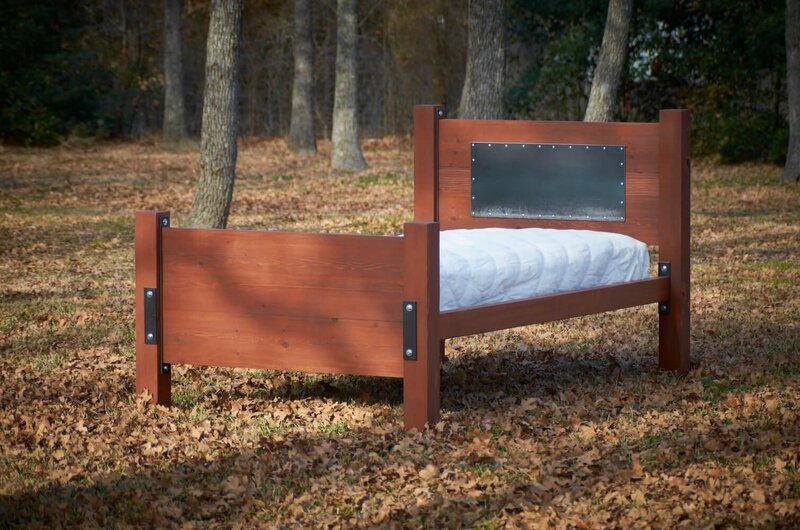 This bed can be reproduced at $5500. 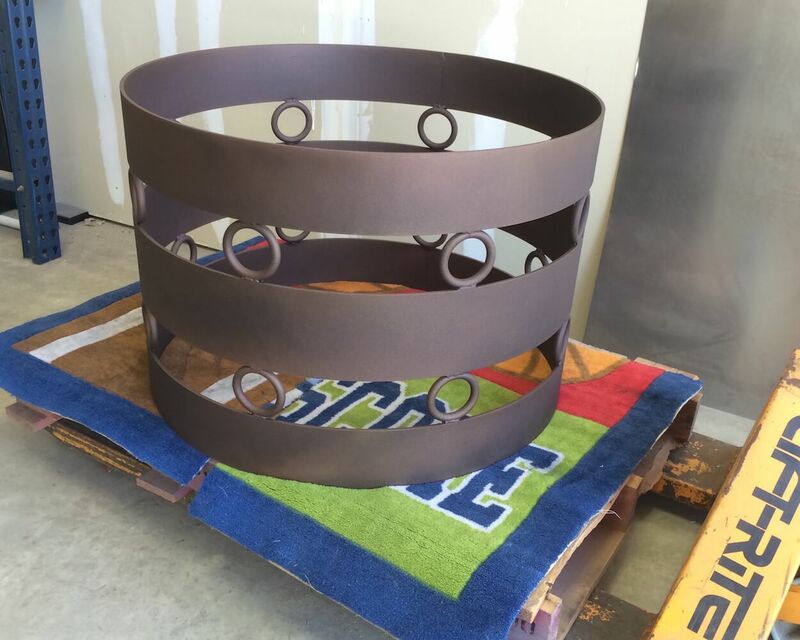 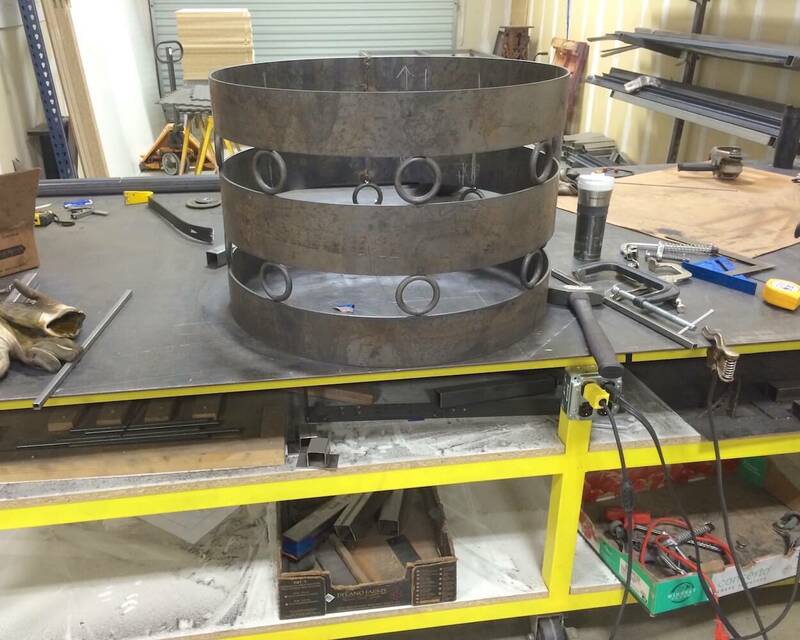 Customer commissioned, rolled rings powder coated in durable rustic outdoor coating. 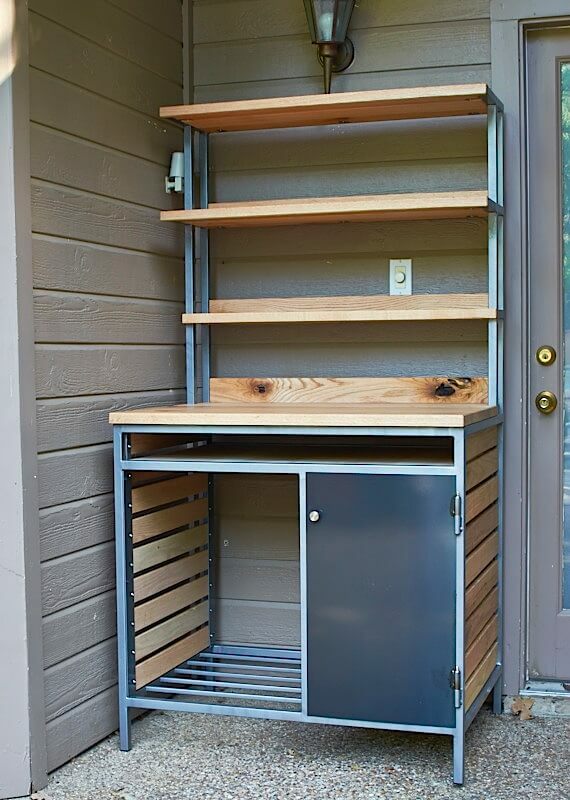 Steel and Oak outdoor storage for patio essentials like couch cushions, garden supplies, and a compartment for spare propane tanks. 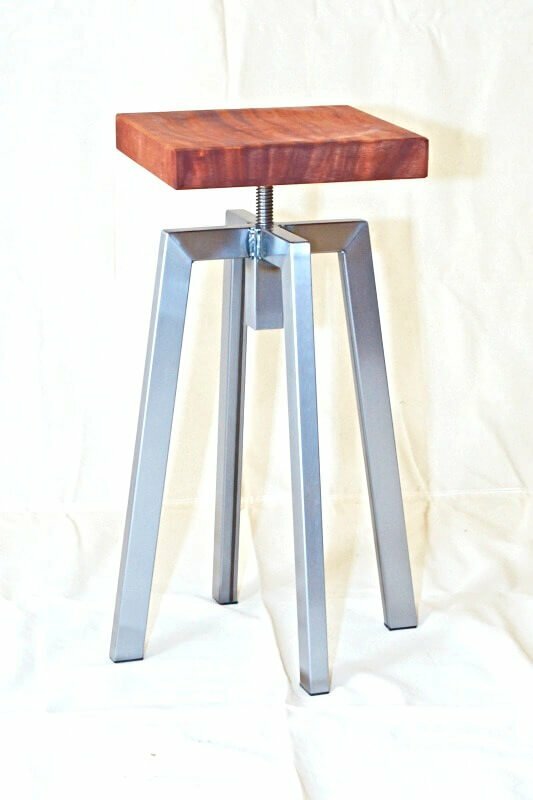 Finished in hammered texture silver paint and Natural tone spar varnish for the wood. 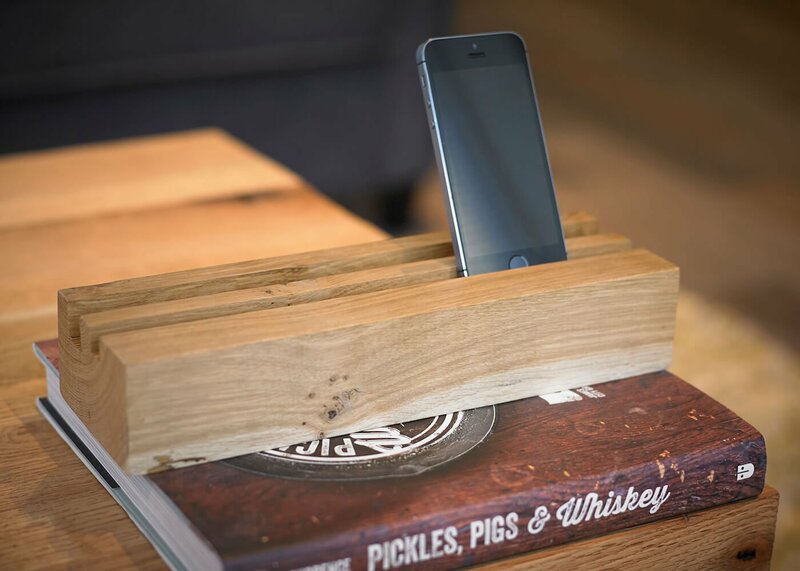 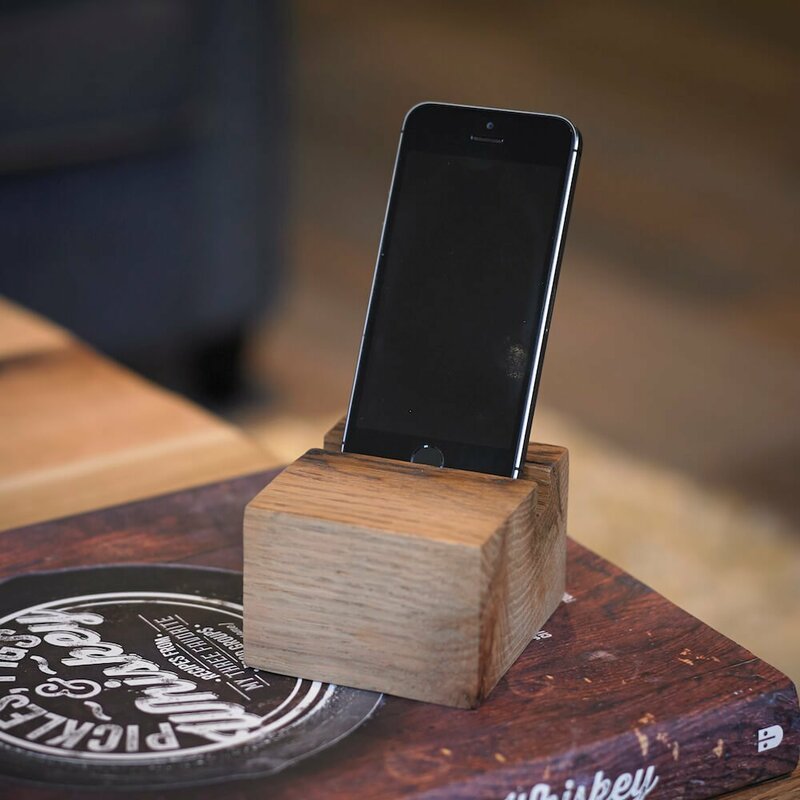 Phone and Tablet Perches in reclaimed Oak. 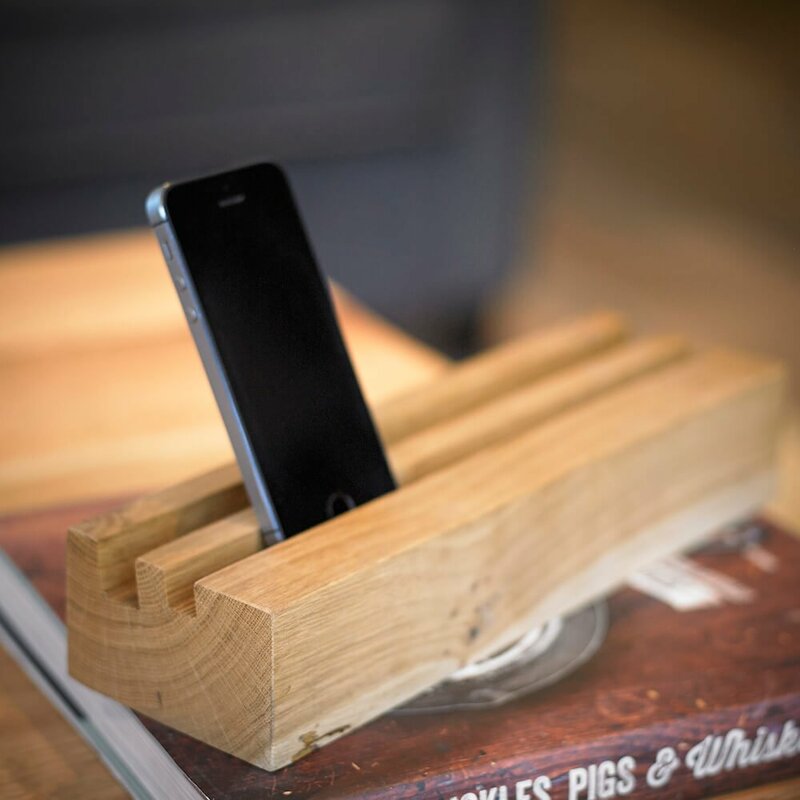 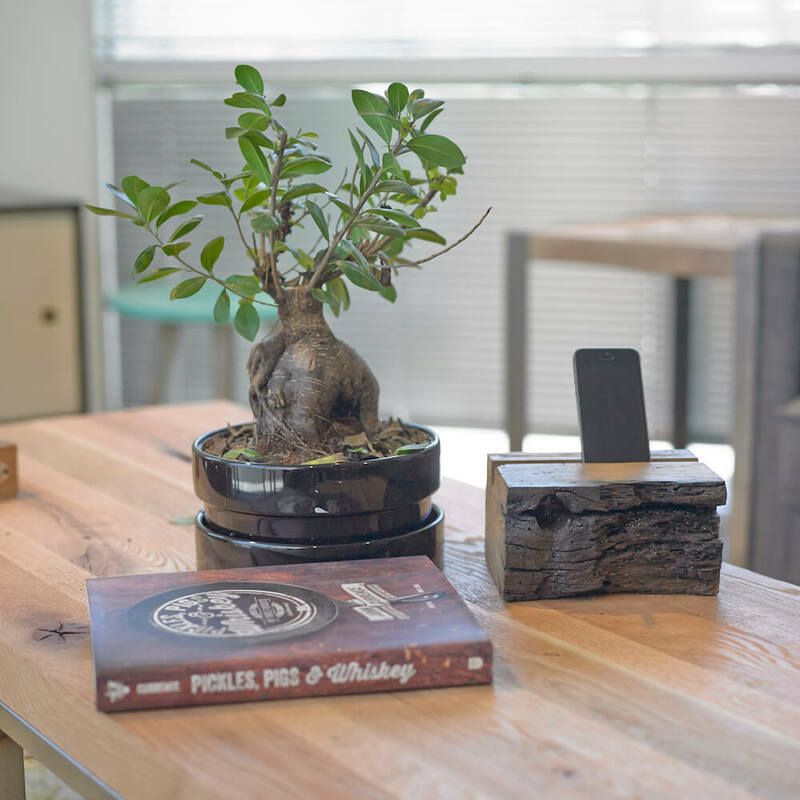 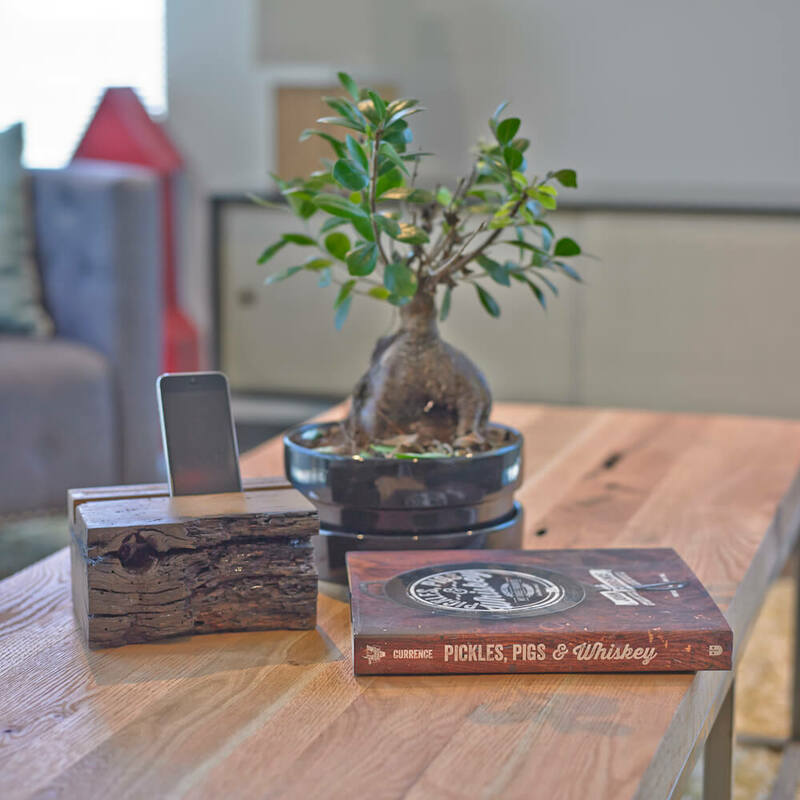 Configurations include: small for single phone, large for tablets or phones, dual groove use as a charging station, and rustic from our antique oak beams. 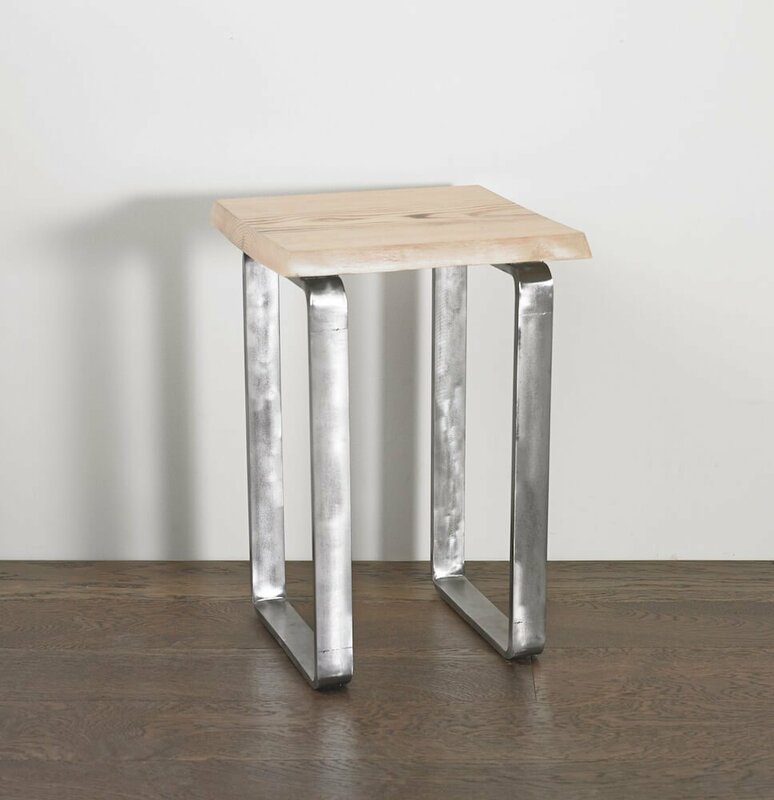 Mortise Plank table with Rustic Bright steel legs and whitewashed wood; Live Edge Loop Leg Table in Whitewashed Oak and Rustic Bright Steel – Doubles wonderfully as a stool. 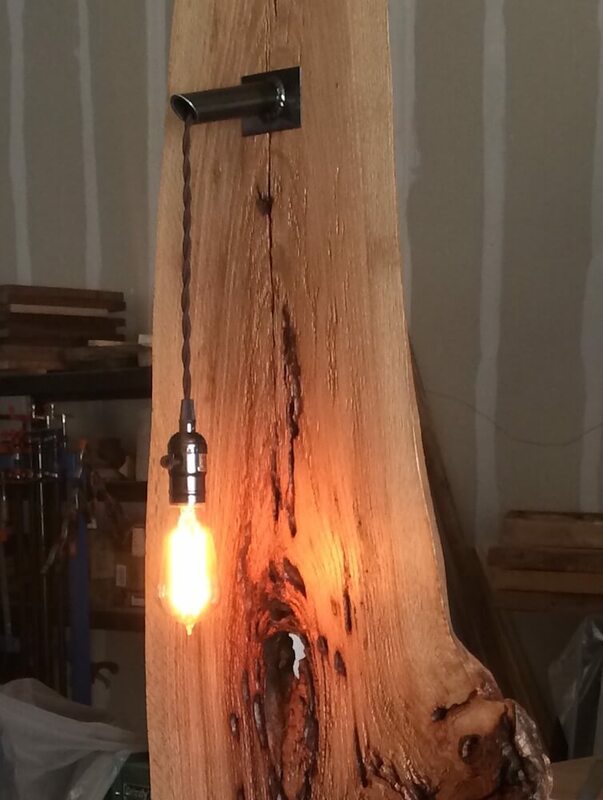 Uniquely charactered Oak live edge cutting, fixed to a natural gray steel base and illuminated with a single vintage bulb pouring from the steel spout on top. 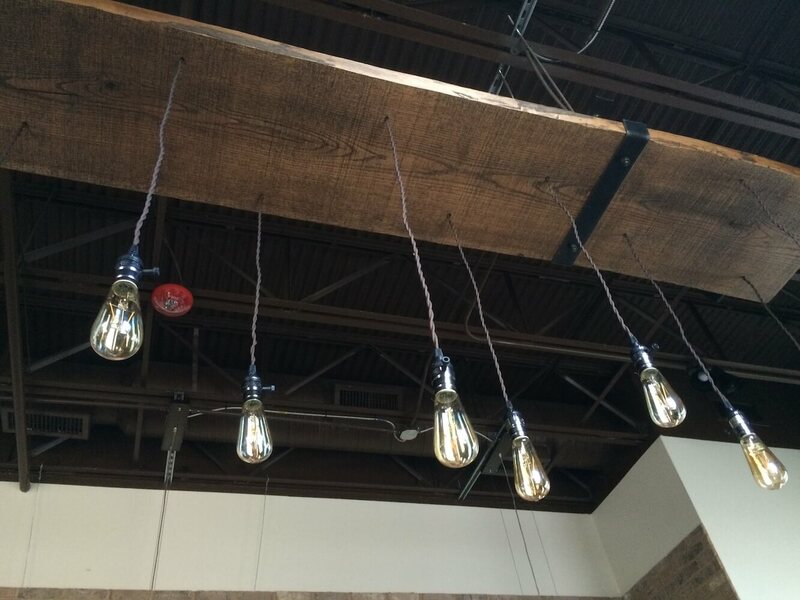 This fixture includes dimmer and will accentuate any environment. 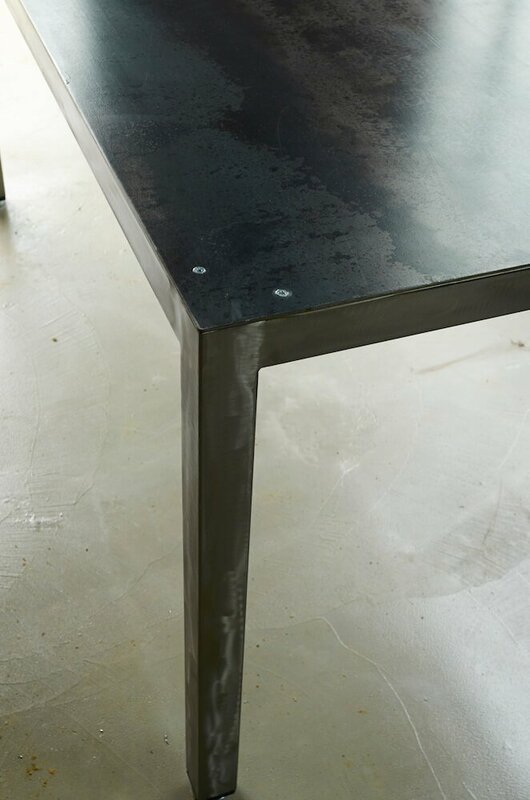 Detail of stainless steel table base in progress. 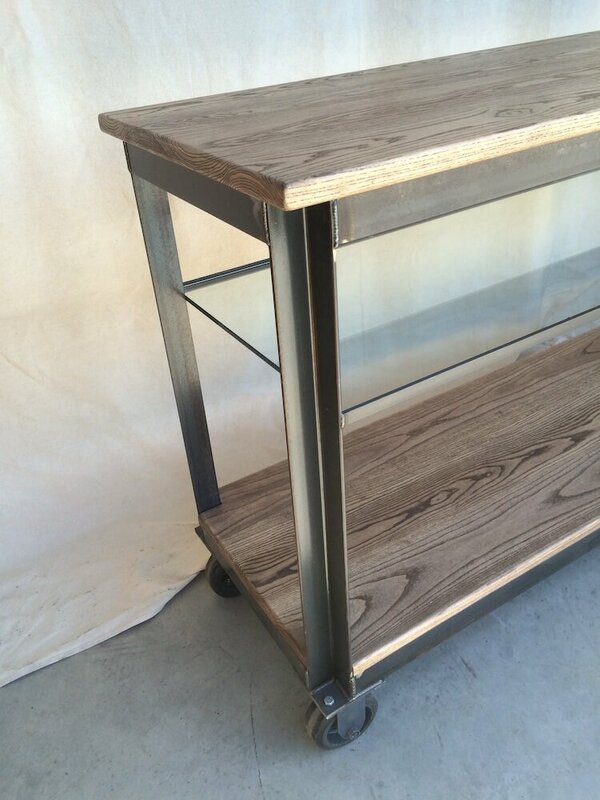 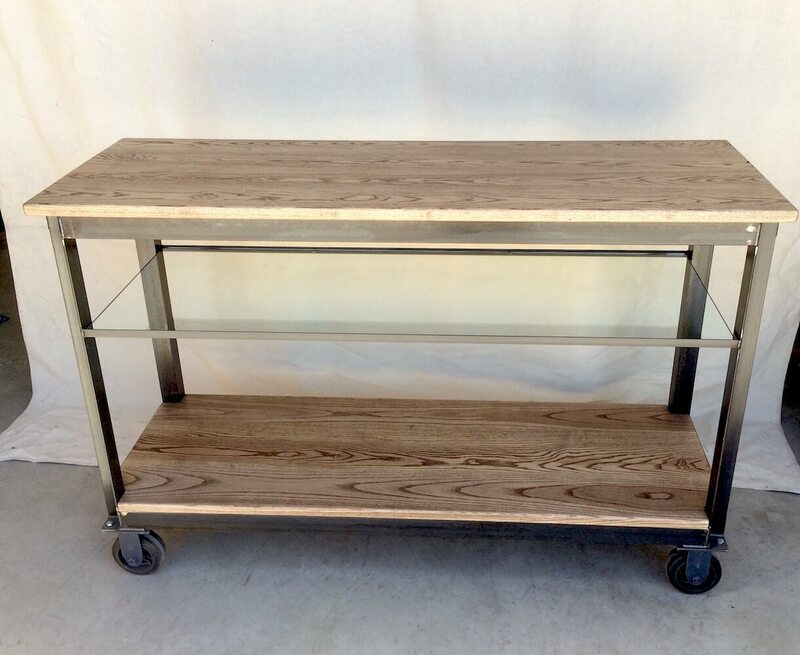 Steel and Ash Console with Glass Shelf — on casters for mobility, to use as sideboard storage or a bar cart. 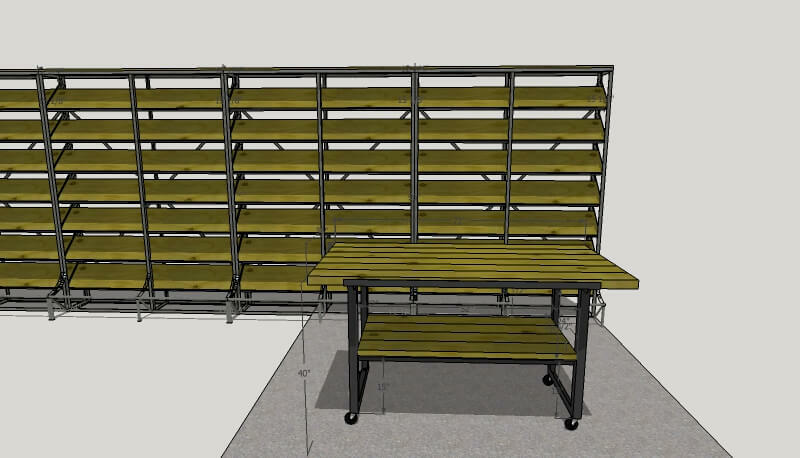 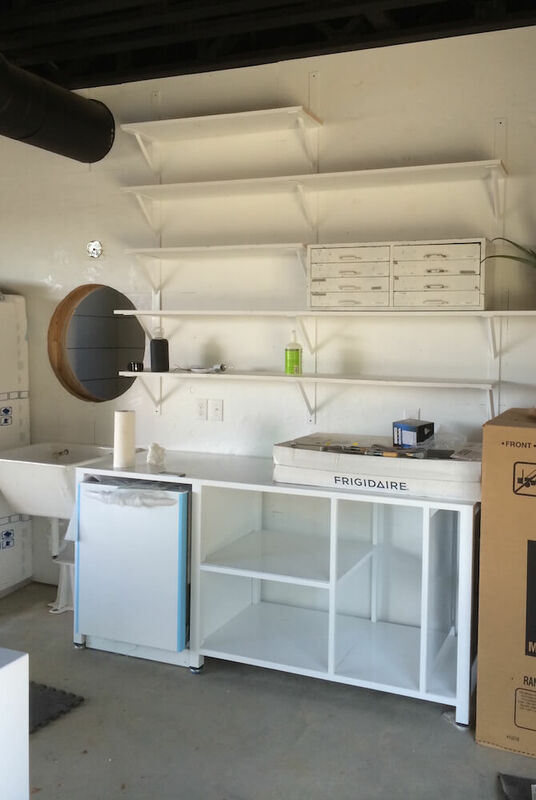 With an open shelf configuration and steel sheet shelves. 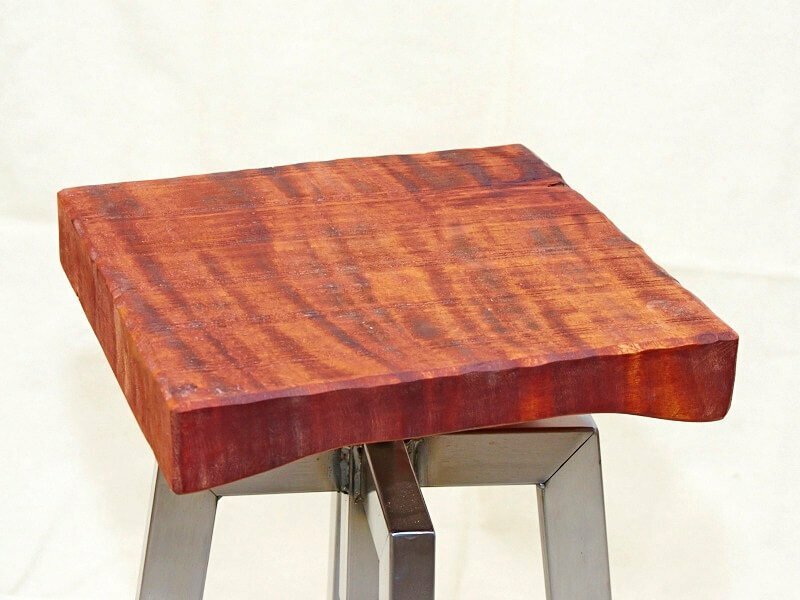 African Mahogany top. 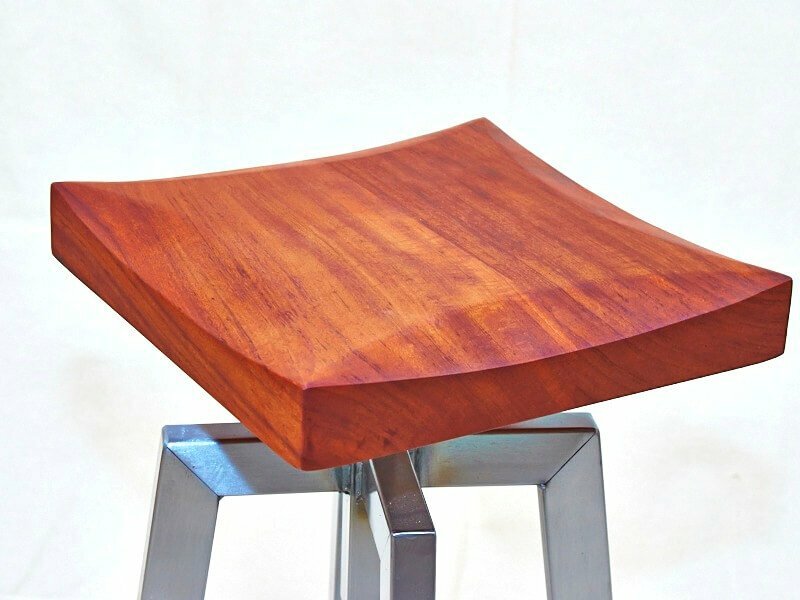 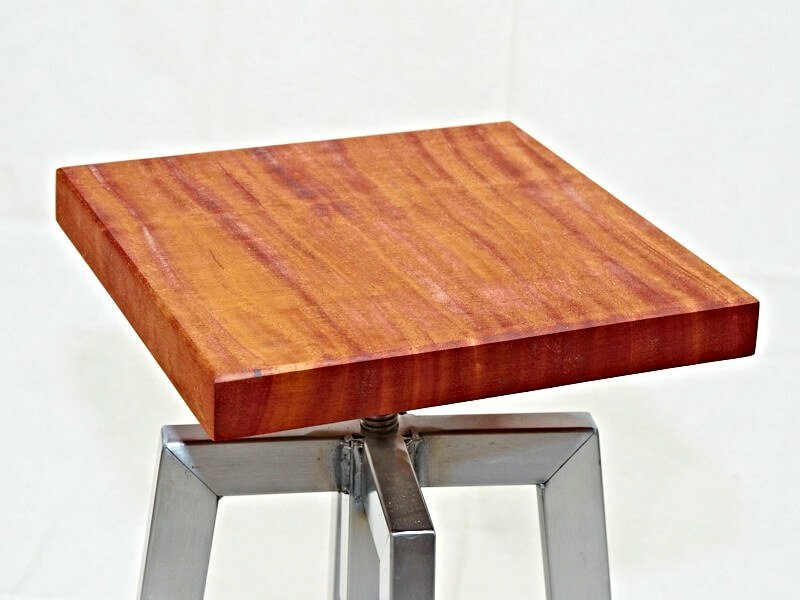 This table (or is it a stool? 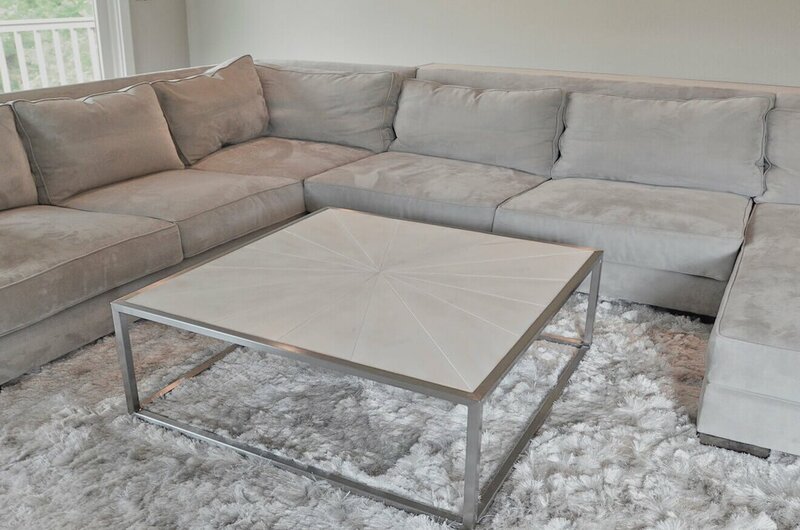 ), takes on multiple personalities. 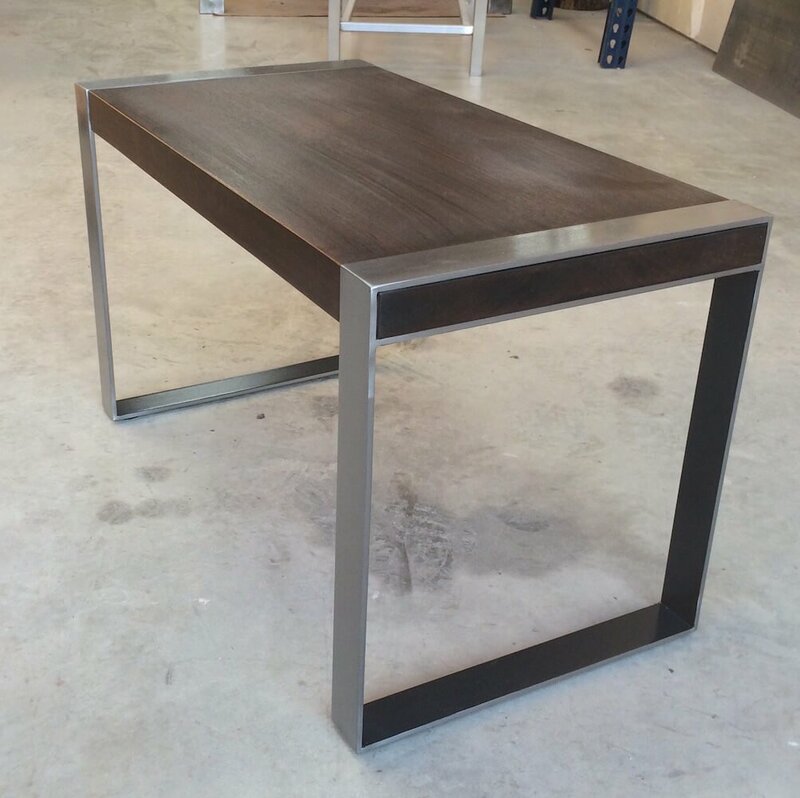 Shown in Brushed Steel with a rustic solid Oak top. 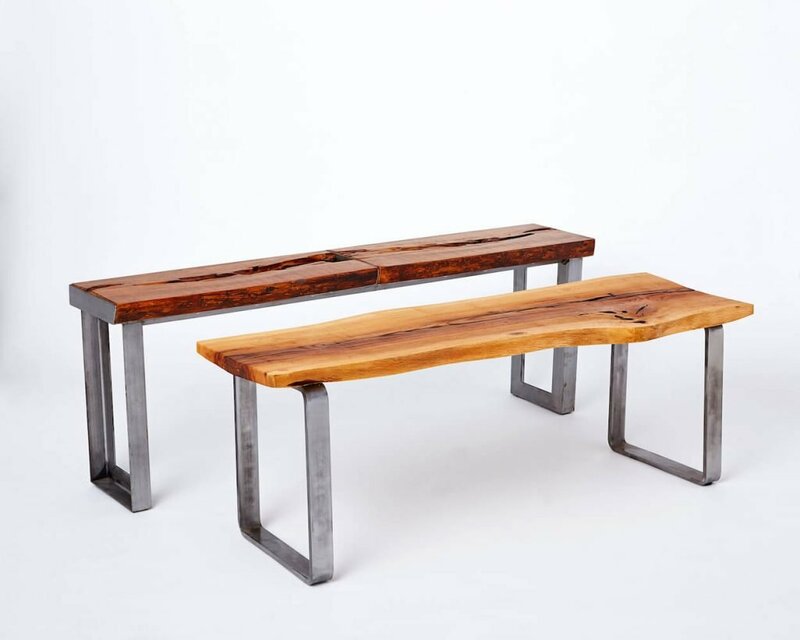 Live Edge and steel benches. 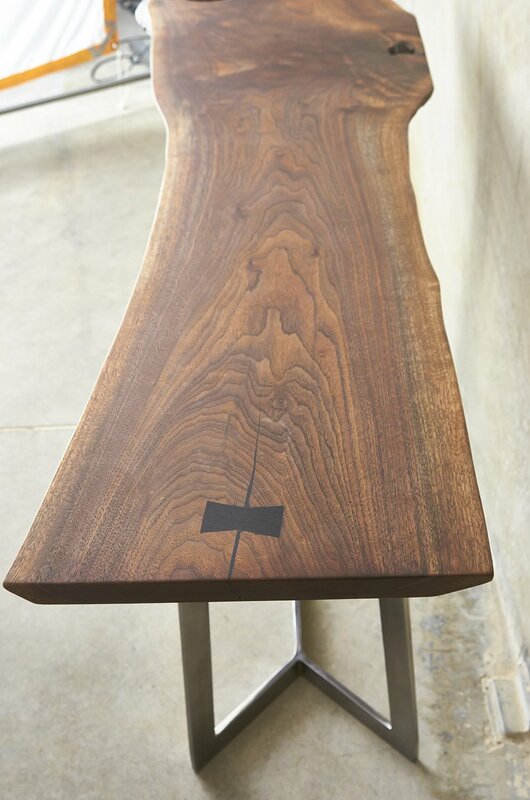 Front: Oak in Natural Oiled finish with ½” thick Loop Legs. 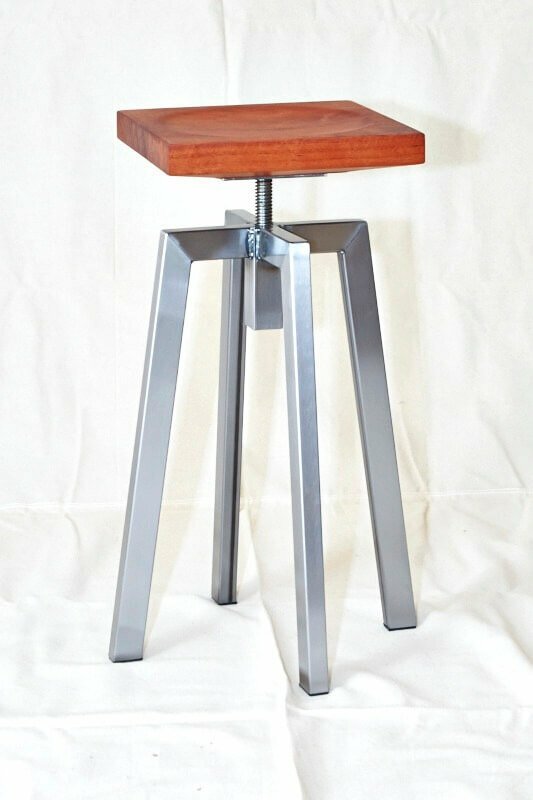 Rear: Distressed and Bookmatched Cedar in Dark Oil finish with Steel Picture Frame base. 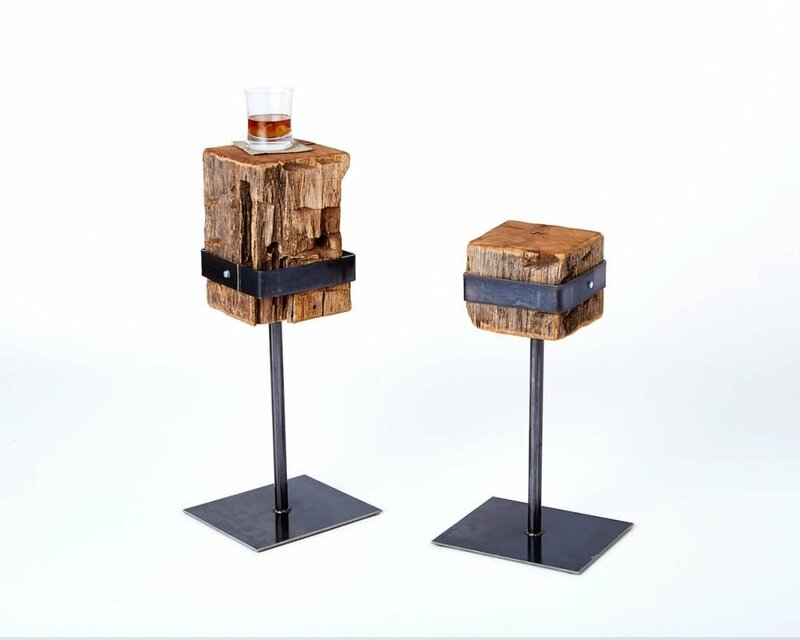 These stools take on multiple personalities as seating and tables; Rustic or very contemporary, depending on finish and wood selection. 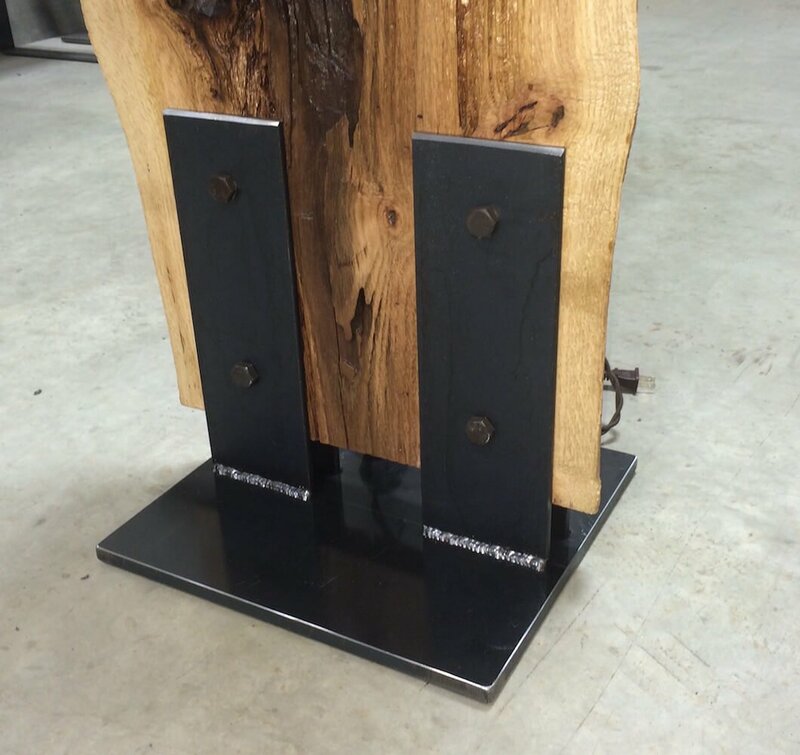 Shown in Brushed Steel with Dark Oiled live edge top and Blackened Steel with Maple top. 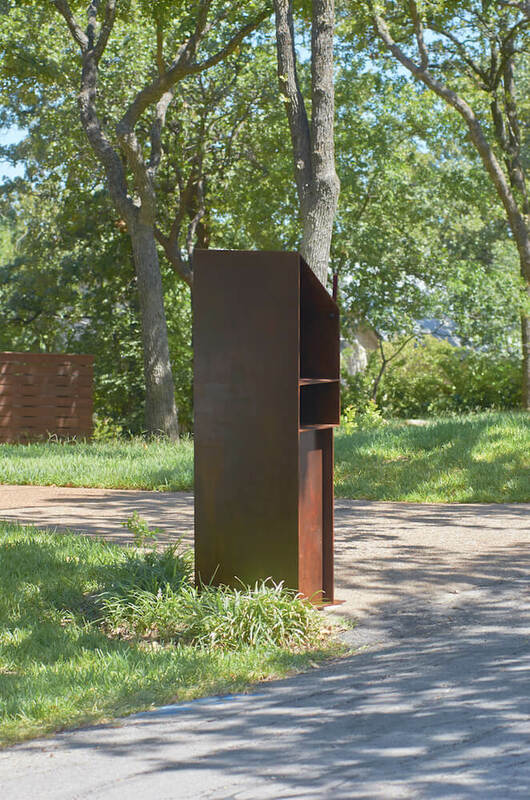 Custom built mailbox enclosure to house a lockable mailbox. 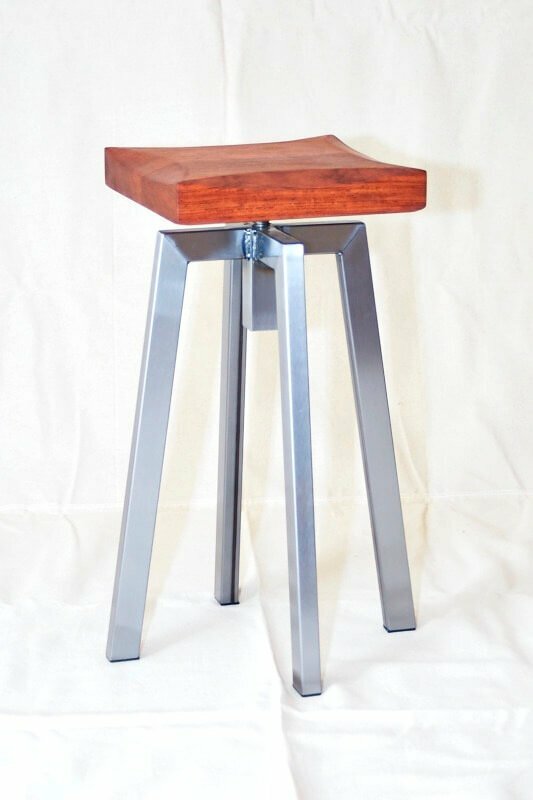 Built from ¼” plate steel with a rust finish. 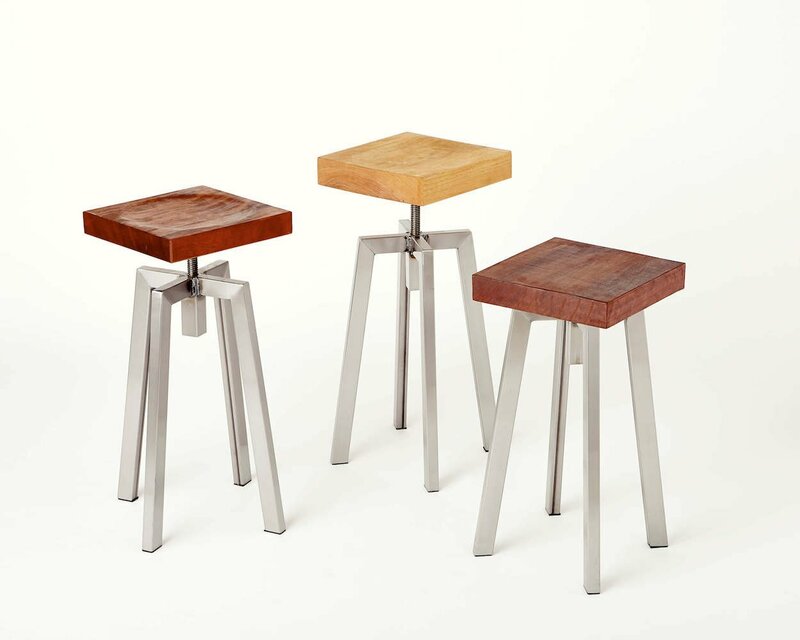 Piano-style stools in brushed steel. 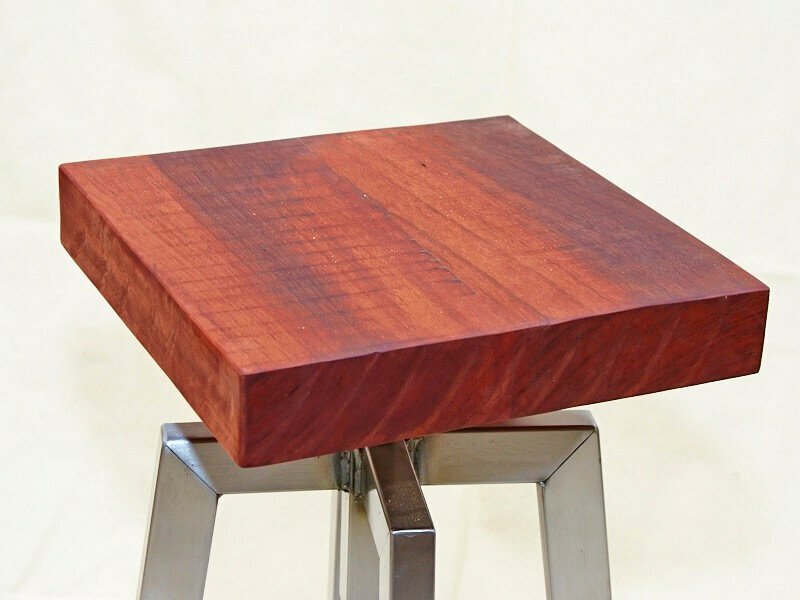 Tops in Bubinga, Mahogany, and Maple, in a variety of finishes and styles. 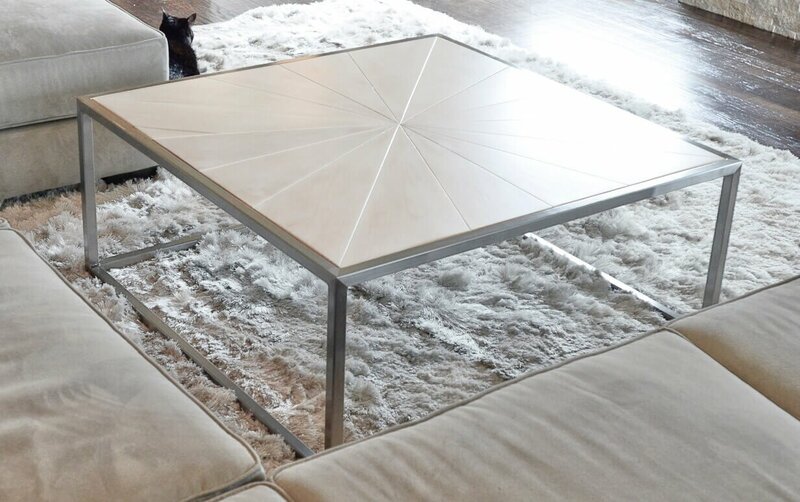 Sunburst table and matching console — Custom commission for a remodel. 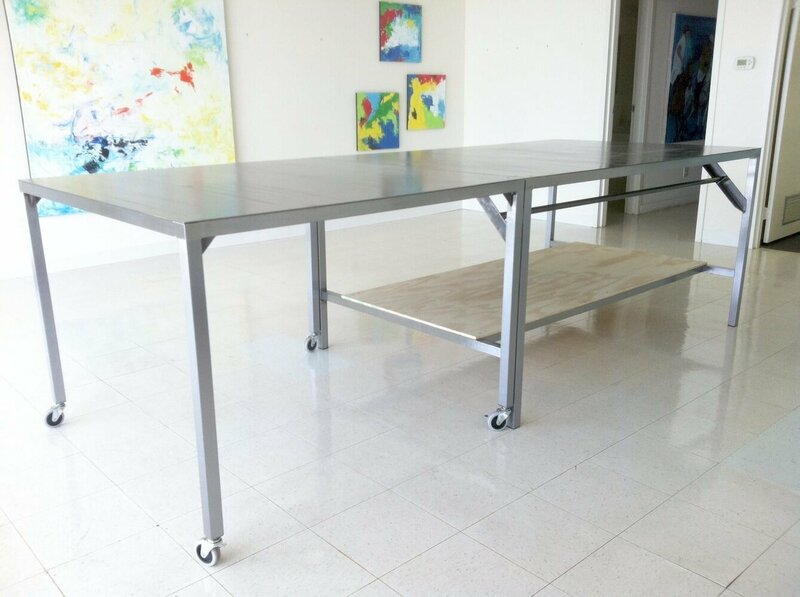 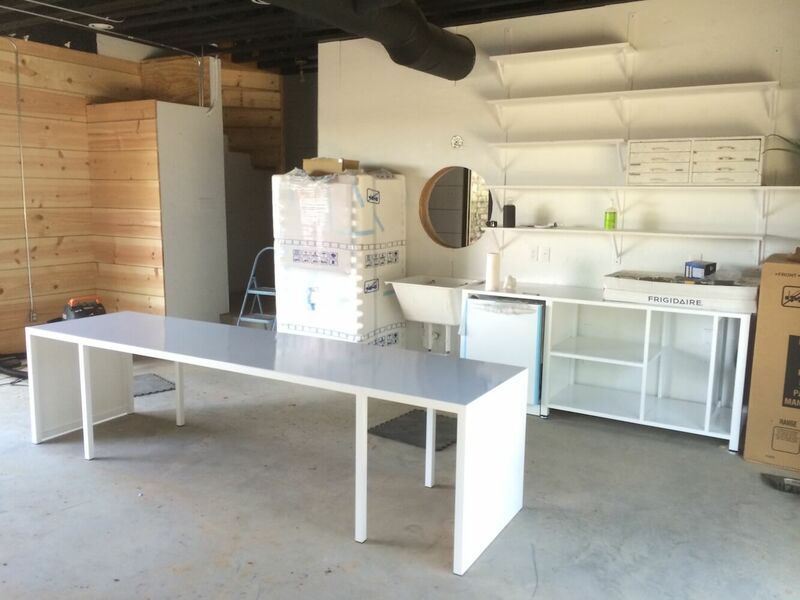 40″ square sunburst table of whitewashed maple and brushed steel, and 80″ long console. 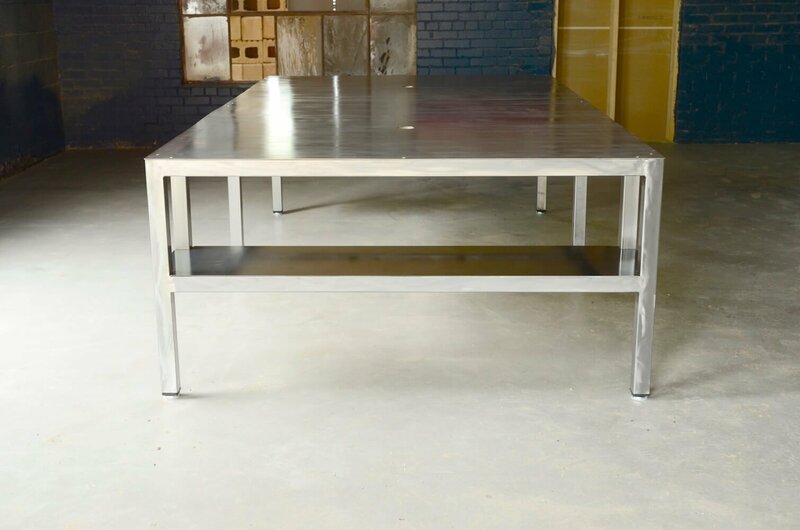 Custom stainless steel table in mirror finish, commissioned by Ten+3 Architects and built in collaboration with Allied Stone, Inc. in Dallas, Texas. 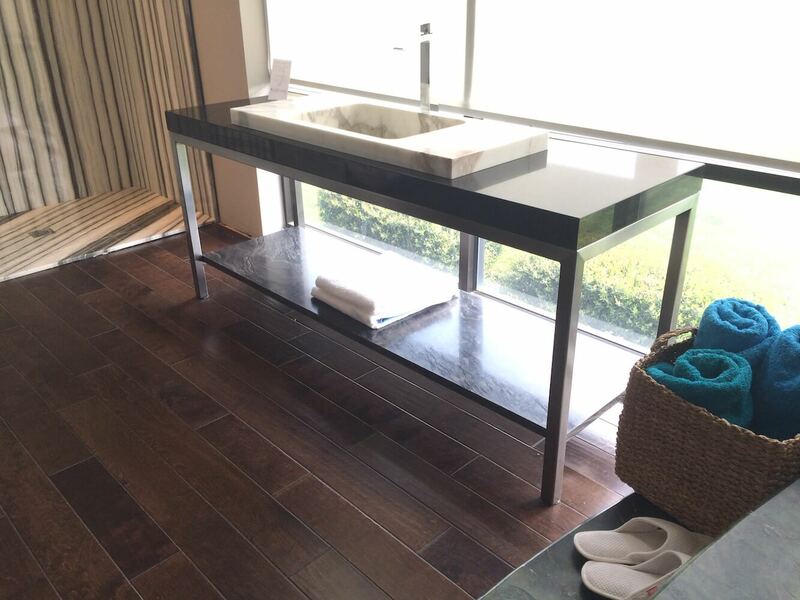 Currently located in the Ritz Carlton, Puerto Rico. 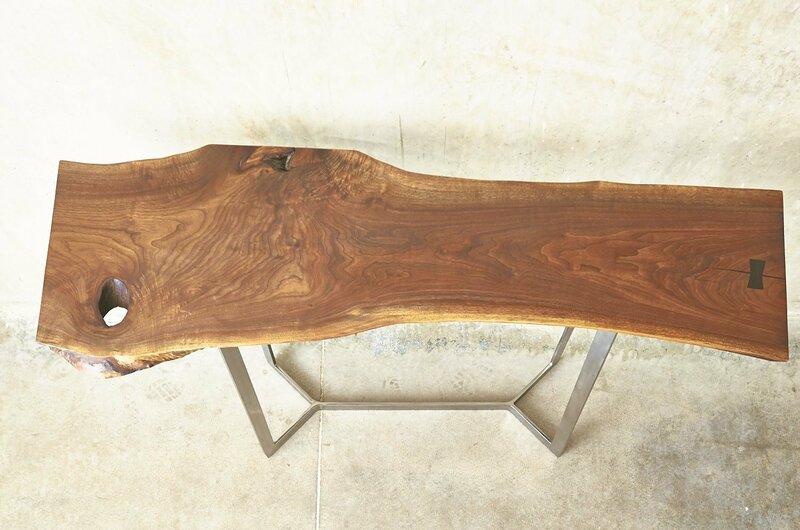 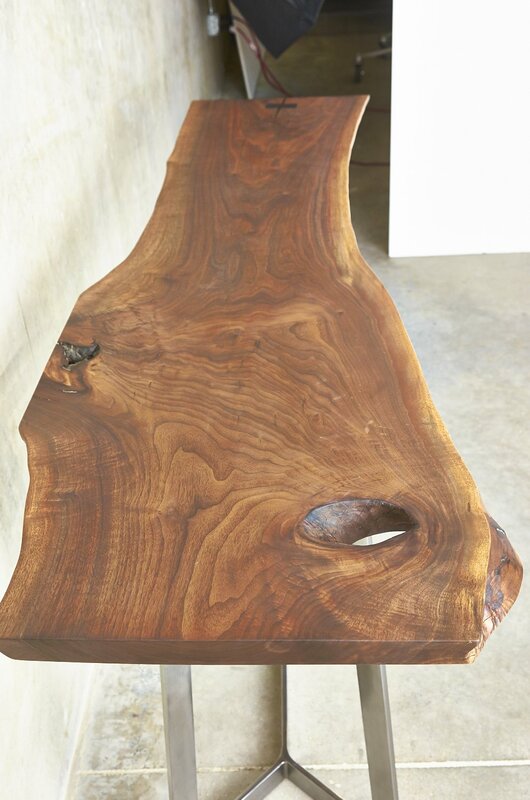 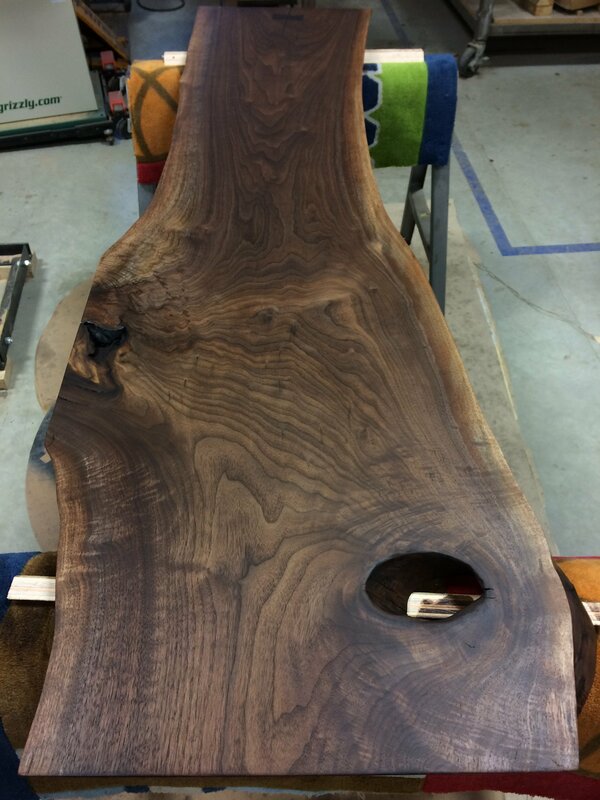 The grain of this massive red oak live edge slab spills over the edges to the legs of the 72″ bench.